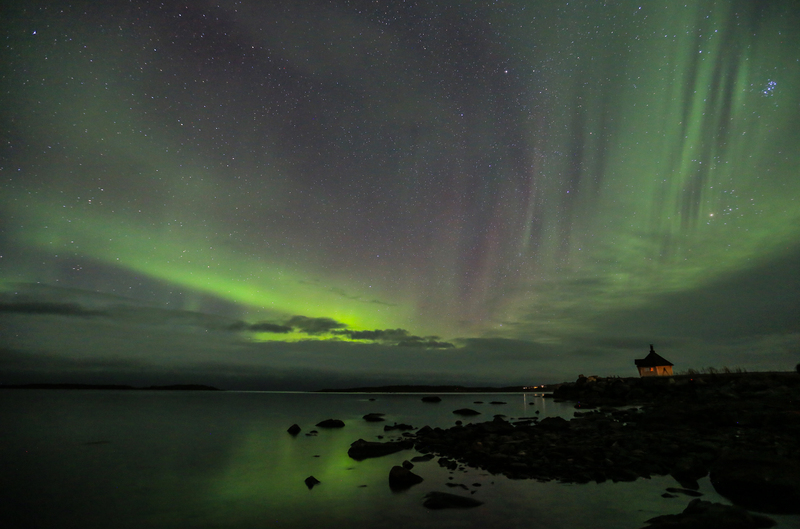 I was lucky enough to go to Sweden last year to see the Northern Lights. I confess I have seen them before so I already had a pretty good idea of how to photograph them, but I was really excited just to play around and see what I could capture. We booked a trip where cameras and tripods were provided, and a guide is on hand to give advice and tuition during the evening. 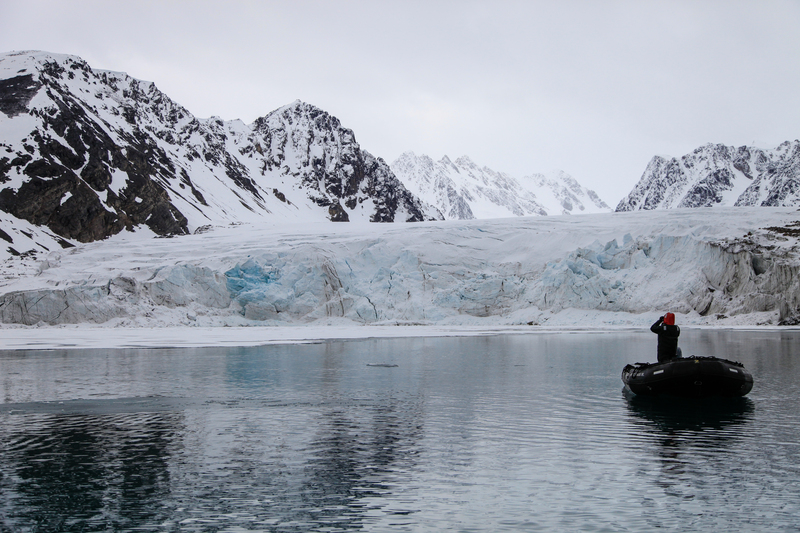 Although we had cameras of our own, it seemed like a good idea to book a guided trip, and there was a great balance between having some down time, and getting out doing other activities in the daytime. 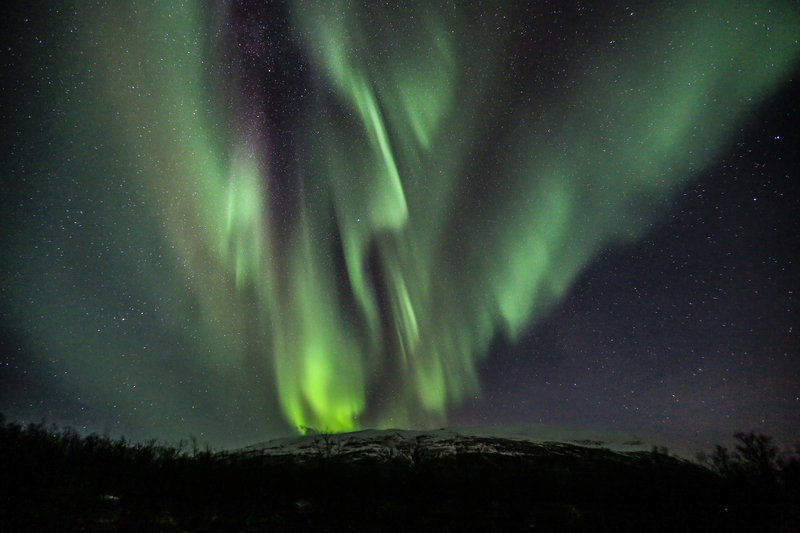 The company is called Lights Over Lapland and for anyone who wants to experience the Aurora Borealis, I whole heartedly recommend booking with Chad and Linnea at LOL. 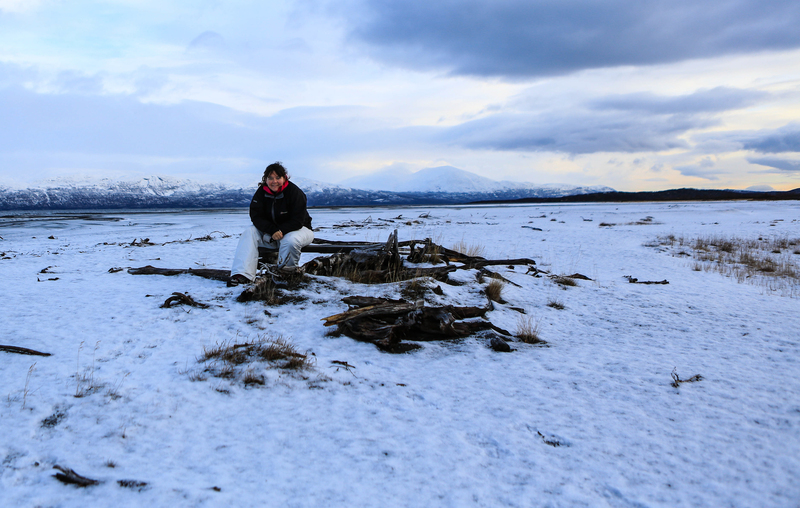 We were met at the airport and transferred from Kiruna up to Abisko, enjoying the snowy landscapes on our way. 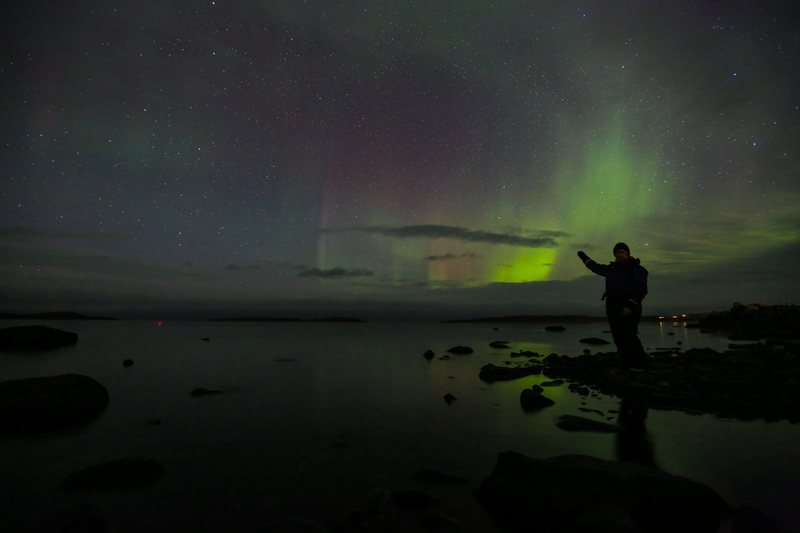 We had time to pick up our kit – cameras and overalls, and then had a gourmet dinner before we headed out for our first Aurora experience. Not far from the hotel, we found some open space with a few trees for foreground interest. Our first night was out of this world. 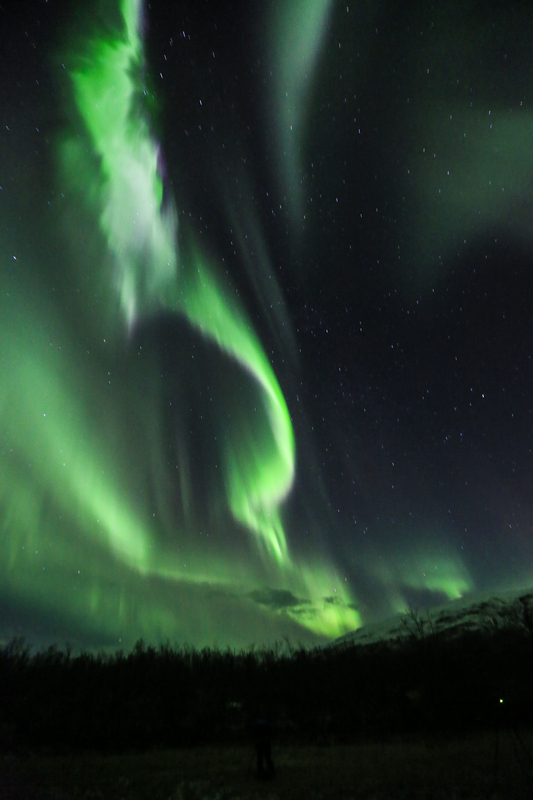 When the aurora “kick off” it’s called a Corona and the lights move so quickly that it looks like a bright green ribbon is waving across the sky. One of my lasting memories of that night was Chad shouting out “We’ve got a Corona … woo-hoo” and it echoing around the valley. 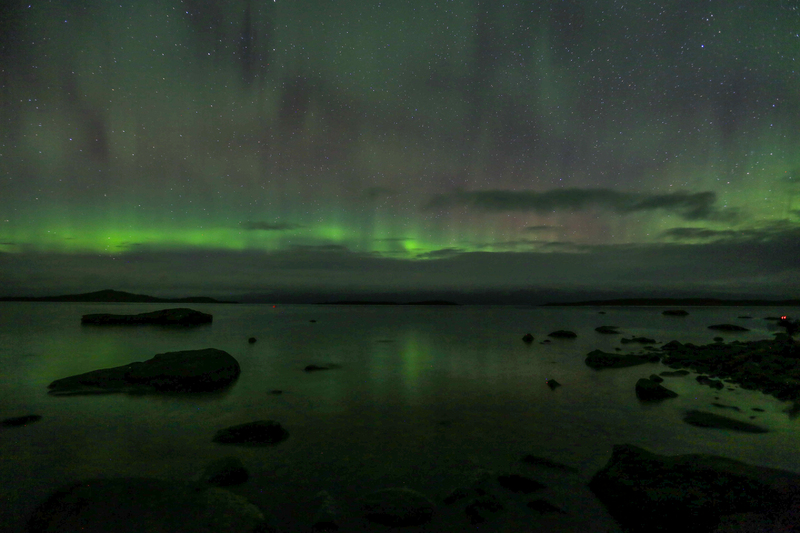 The aurora displayed for a long time that night, and by the end of the evening we had full memory cards, cold hands and feet, and a sense of having experienced something totally amazing. 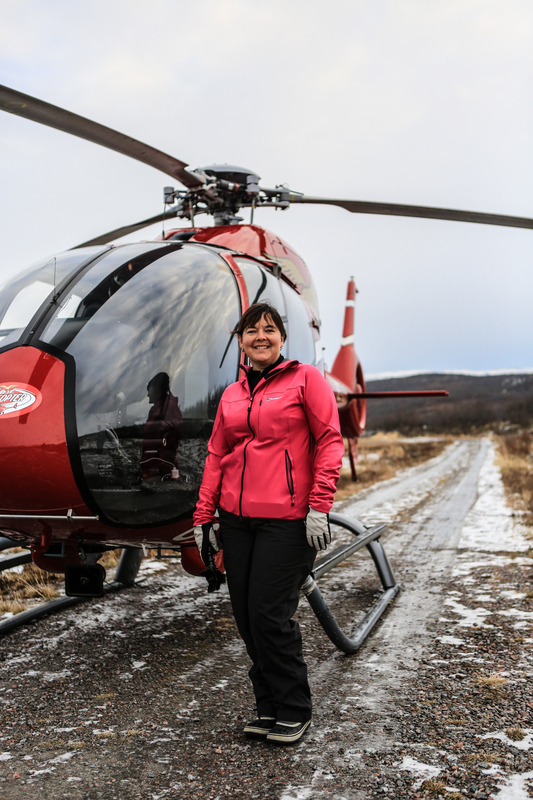 The next day we had a trip on a helicopter through the Abisko National Park. We saw fantastic landscapes, an unusual trapper’s food store, and stunning reflections in the lake. We then had an afternoon to ourselves, and so took a walk down towards the lake by the hotel. 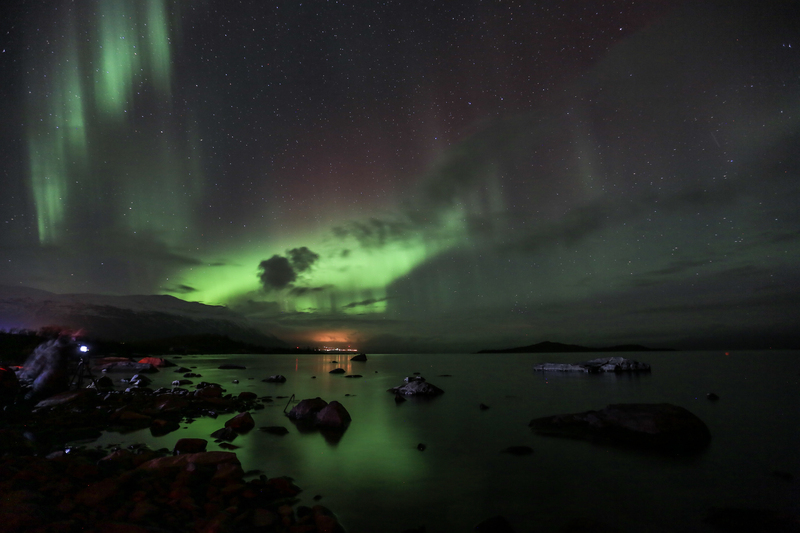 That evening, the weather was a little uncertain, and so we jumped into the van, and headed down to the waterfront. This was my absolute favourite landscape view. 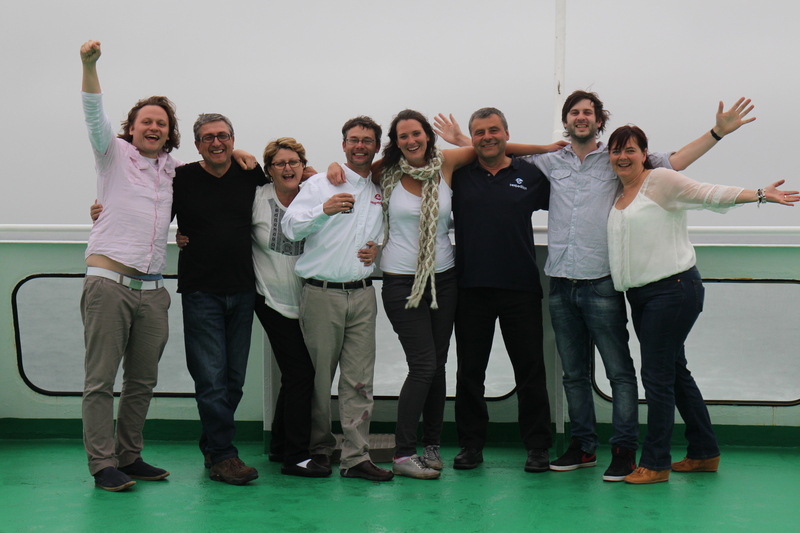 We were treated to another wonderful display, and also managed a great group shot, as well as some portraits / selfies! 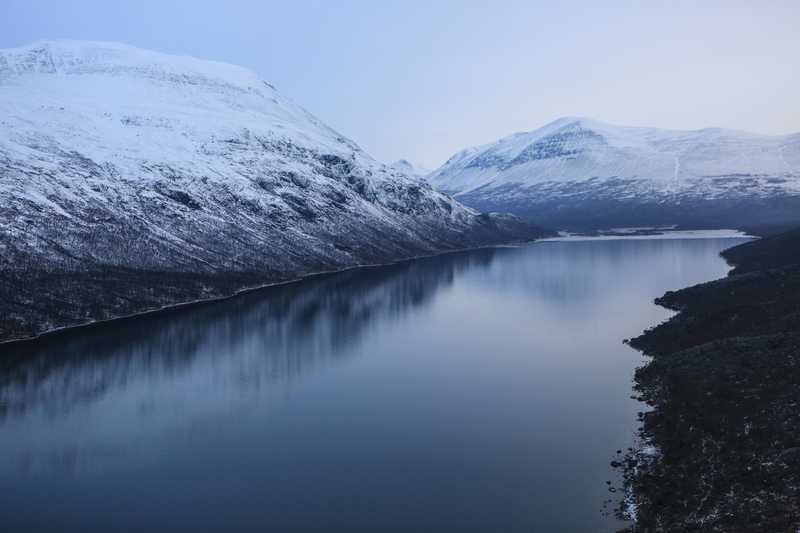 Our third day saw us being driven over into Norway to the town of Narvik. It was great to see more of the landscapes and local area, and having a picnic lunch by the sea was superb! We spent time taking a few photos, and learning to skim stones. 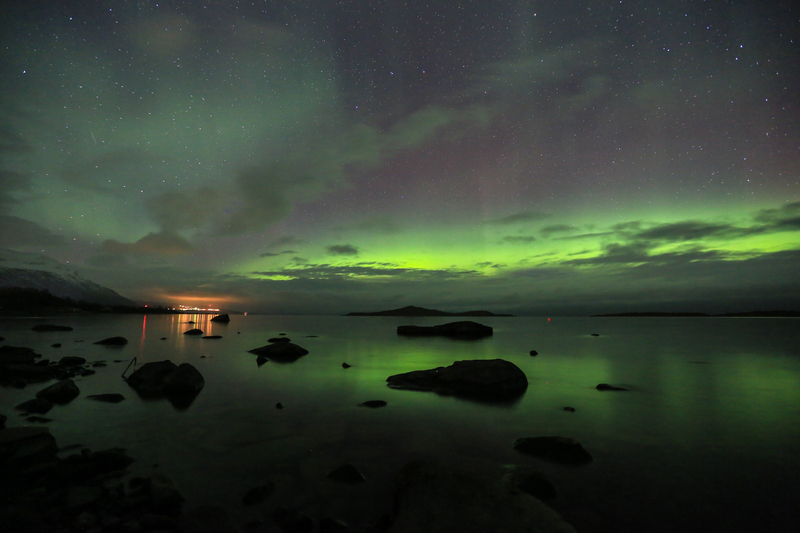 That evening, we walked down to the lakefront to try to see the auroras again, but sadly the clouds just didn’t want to move, and so instead we made s’mores and drank my home-made sloe gin! Not a bad night after all! 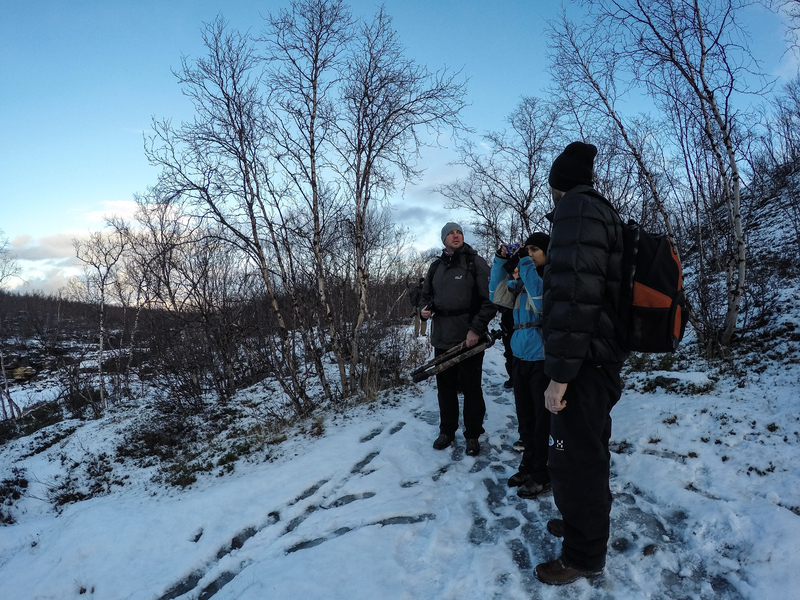 Our last full day was filled with a lovely hike through the winter birch wood. It was fun to take time to enjoy the park, the trees, the snow, and just stretch our legs! 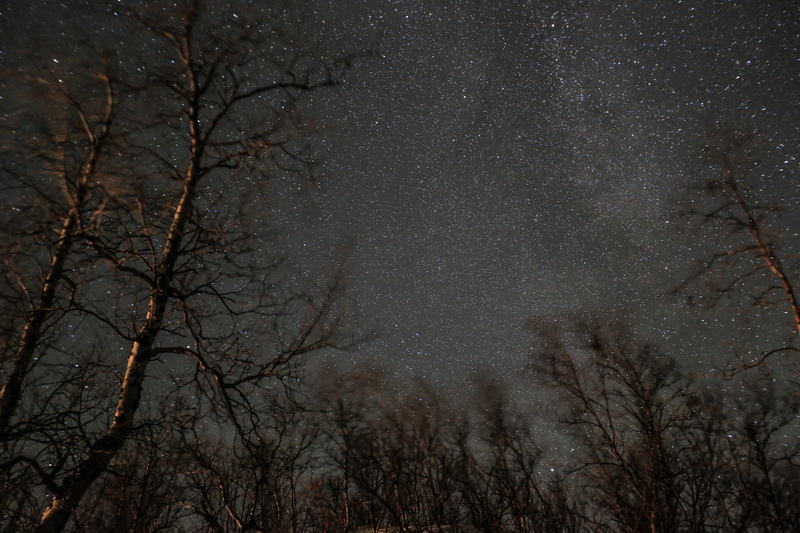 That night, our last night, we went up to the Sky Station which is located on the hill above Abisko. We had to wait till 9pm for the chair lift to open in order to get up to the station, and up to that point, the aurora were being rather shy – just showing on the horizon as a misty green glow. 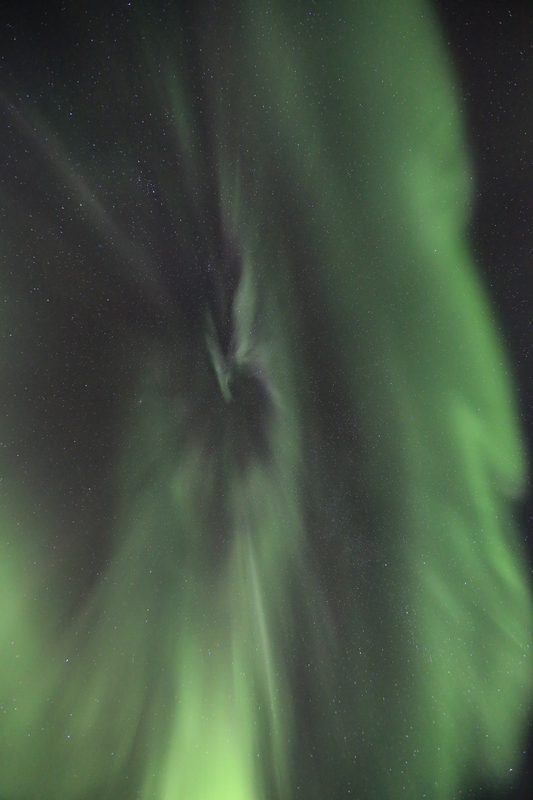 As we got onto the chair lift, and started travelling up the hill (with our cameras on chairs behind us) the aurora decided to kick off in another absolutely incredible display. 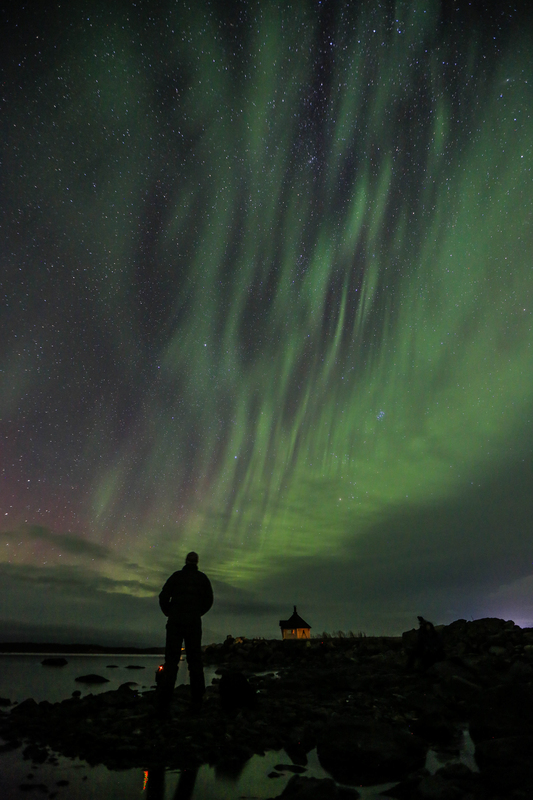 We had no choice but to sit back and enjoy the light show. 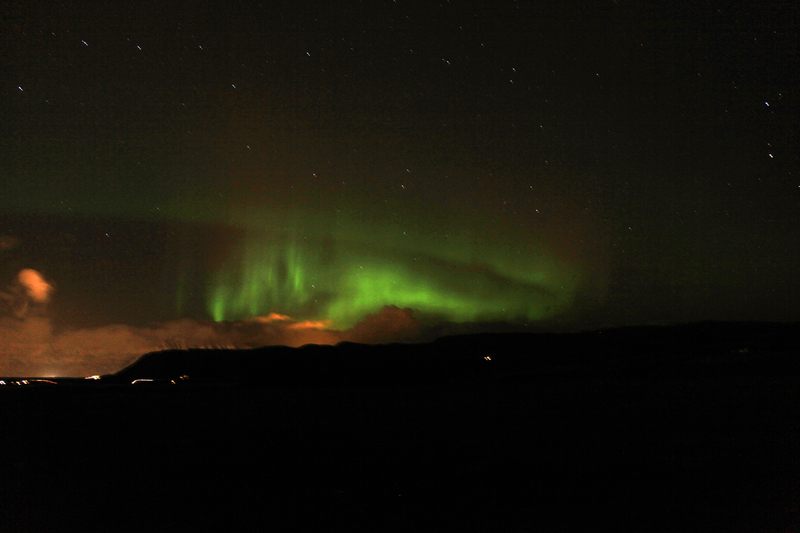 There was such a multitude of colours, and again really fast-moving auroras that just blew us away. Having reached the station, we were able to grab some photos and it was great getting different compositions, as well as a couple of other group shots / selfies again! Before we knew it, sadly it was time to head home. The memory cards had been filled many times over. 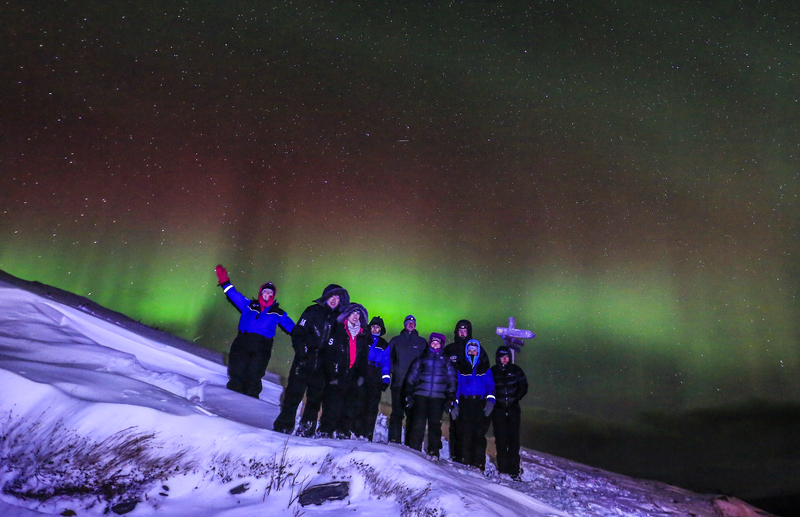 We’d been treated to some of the most amazing aurora displays I could have imagined, and met some fellow aurora-obsessed new friends. 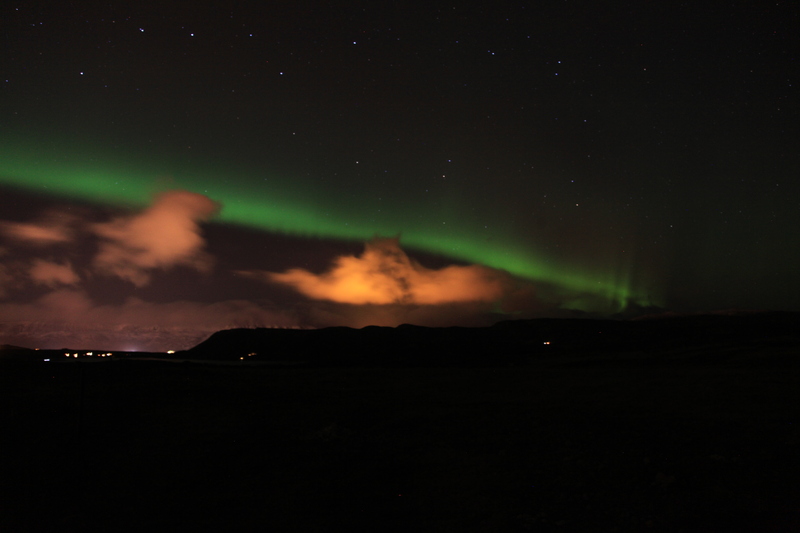 I am definitely going back for another chance to see the lights in 2015. 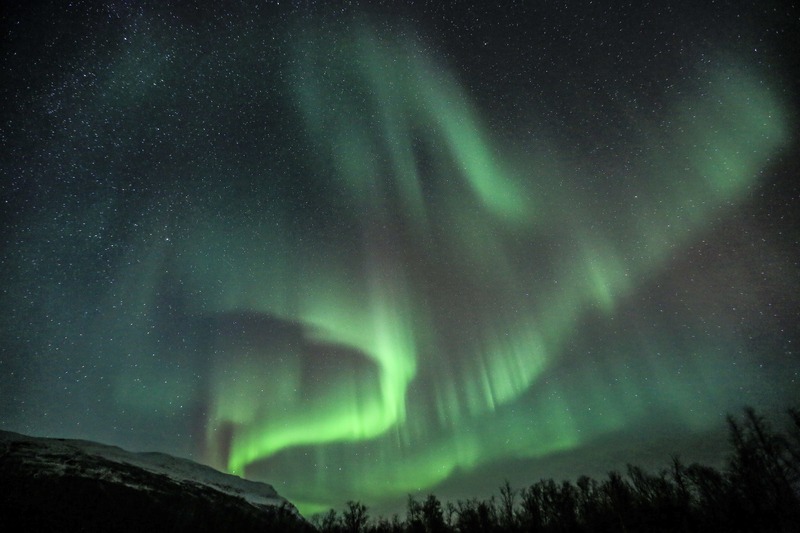 If you’ve not seen them, it seems Abisko is a really good location for them – there is a micro climate that gives you a higher than usual chance of seeing the lights. 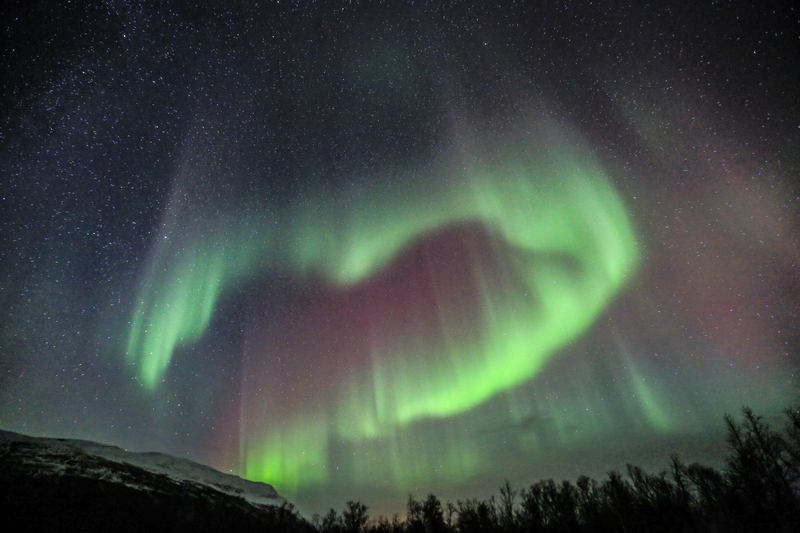 You can fly from London via Stockholm up to Kiruna, which is about 90-something kilometres from Abisko. 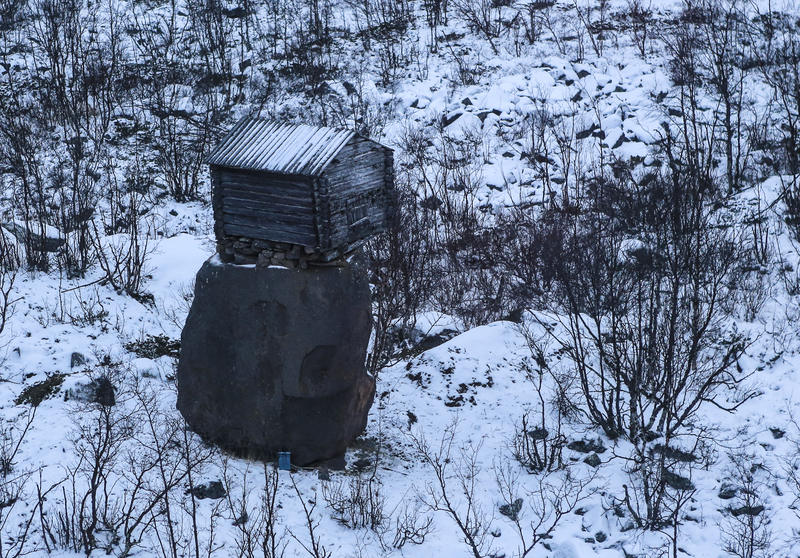 There are a couple of guesthouses in Abisko. 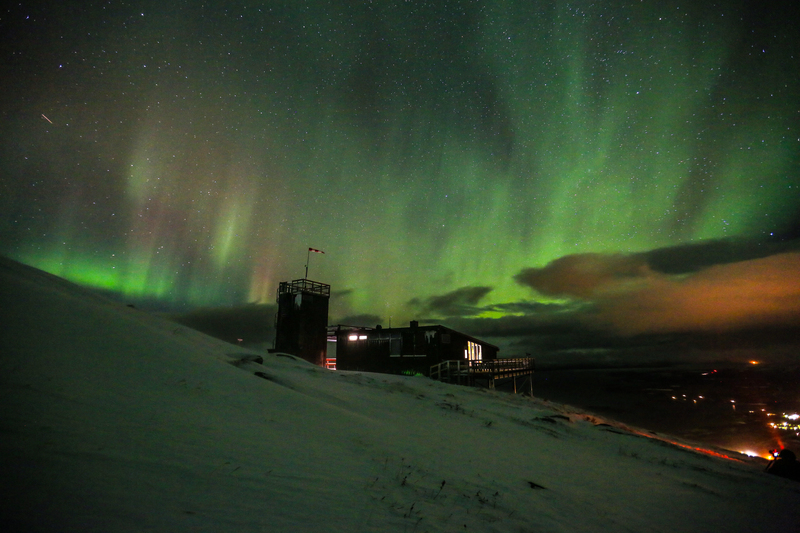 We stayed at the Tourist Station hotel, which serves fantastic food – including delicious gourmet dinners to keep you going as you head out into the cold to see the auroras! Highly recommended. 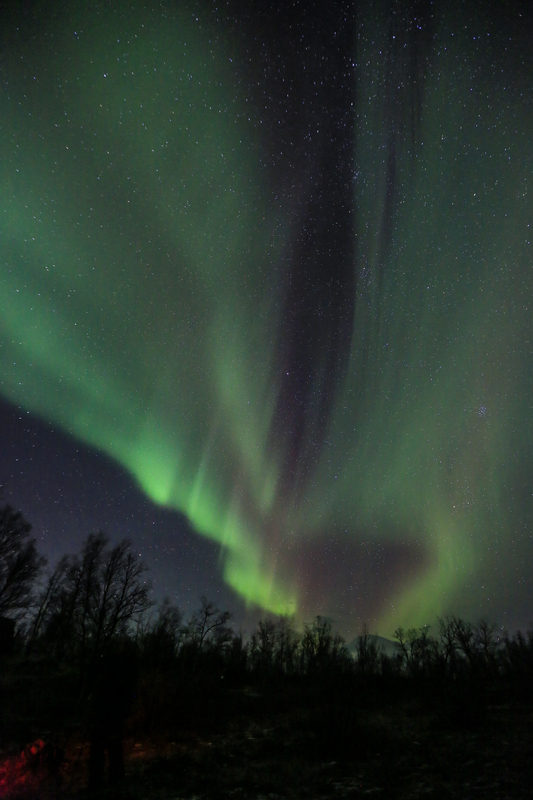 Check out Lights of Lapland if you want a high quality organised trip however, as they took all the stress away and I would say for all first timers, it’s worth the expense. Tuition so you get the best shots out of the camera, flexible evening plans so as to ensure you have the best chance of seeing the lights, and overall great hosts too! Hope you’ve enjoyed this update – feel free to ask any questions. I am rather late writing this, but better late than never. 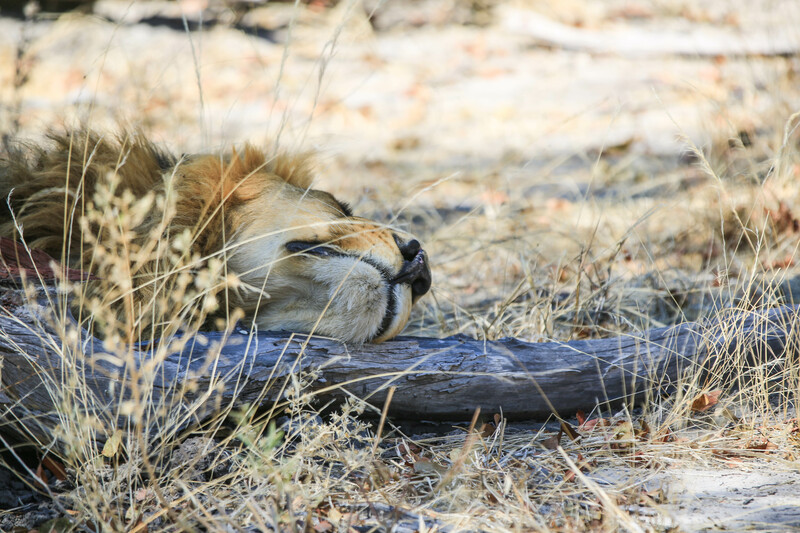 I was lucky enough to head to Botswana last year for a couple of weeks on a real safari adventure. 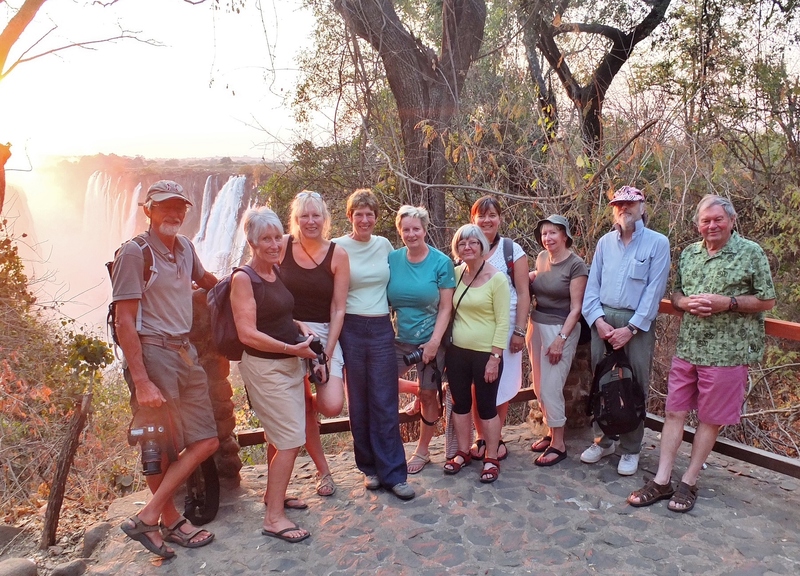 The two week tour started in Maun where we stayed overnight, meeting our fellow tour-ists, and then headed off, first spending three nights in the Okavango Delta. 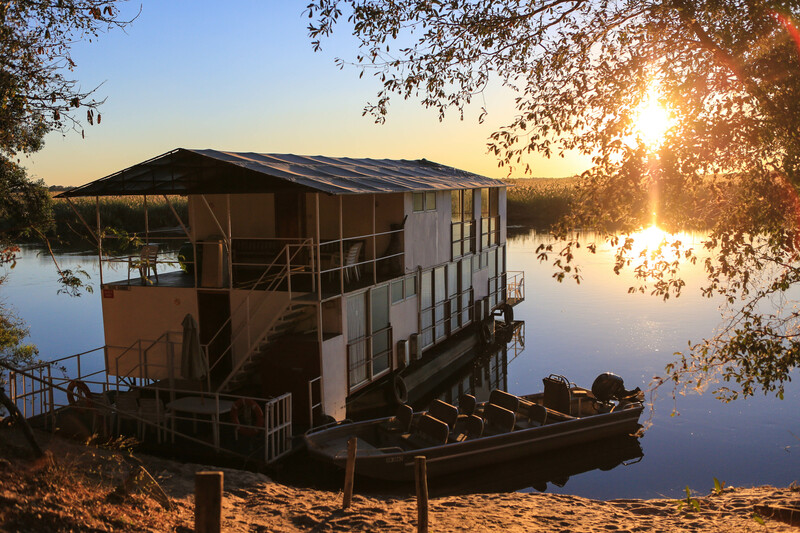 Next we headed for a houseboat where we were on board for two nights, stopped off at a private reserve for one night, followed by three nights in the Chobe River area, before we then drove over into Zambia for two nights in Livingstone. It was the most fantastic trip and we were very lucky with what we saw, and so I’ll let the photos do most of the talking. 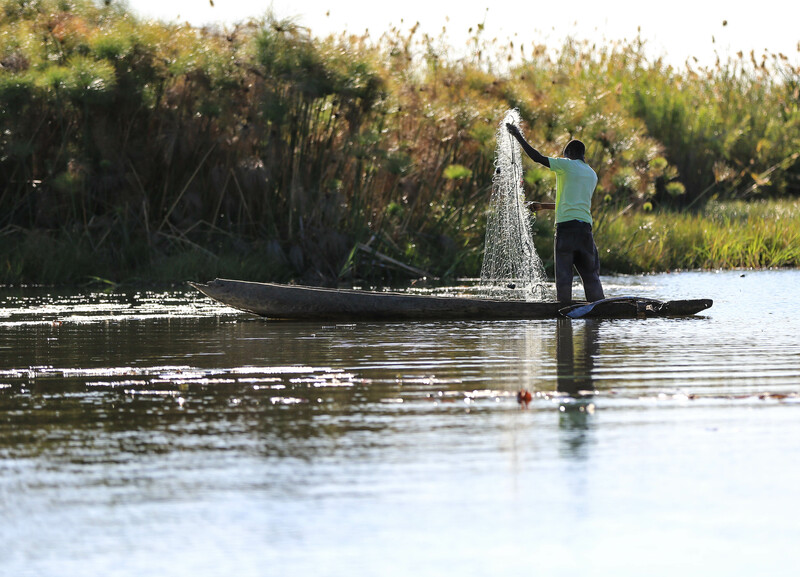 We started in Maun at the Maun Lodge, and we were treated to some traditional dancing as we discussed our trip. The next morning, we were off in our truck that would be our transport until we crossed into Zambia. 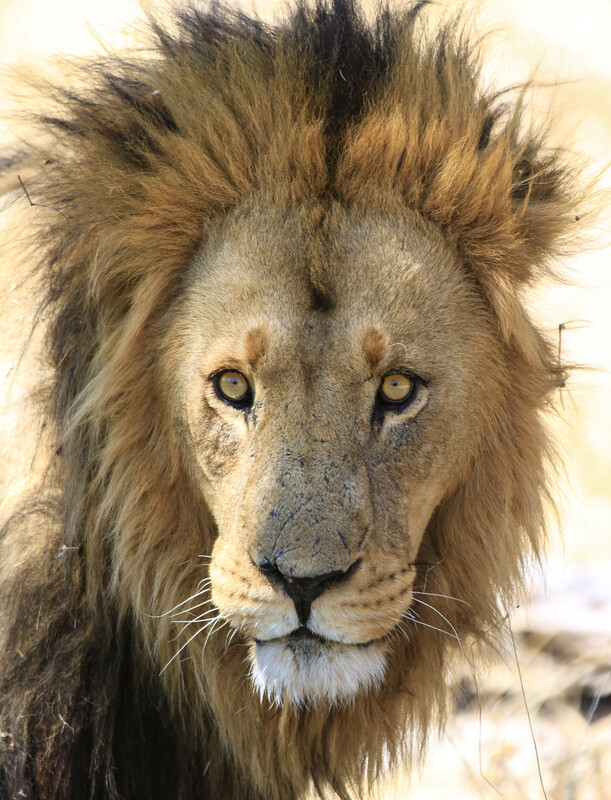 It was pretty rattley, and in the mornings there was no protection from the cold, but when you are sitting about 10 feet away from a magnificent King of the jungle, it enabled some of the best views for everyone in the it! 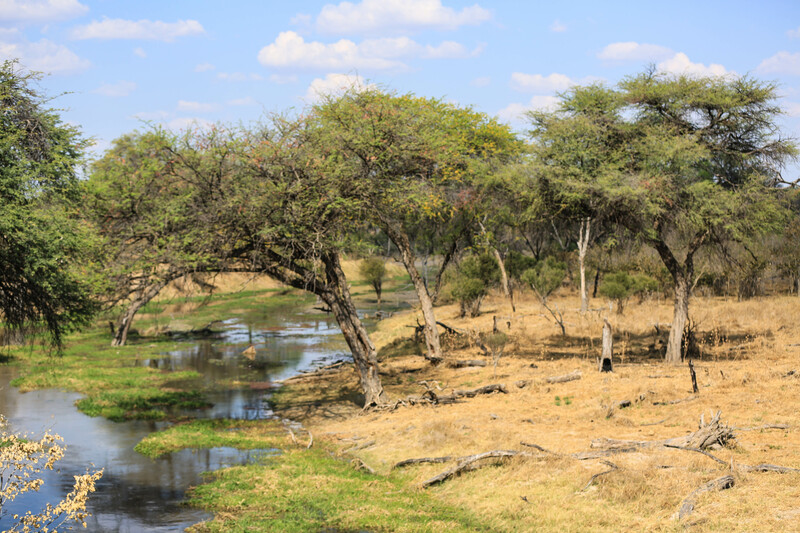 We drove off to the Okavango Delta where we stayed at the Mogotlo Tented Camp for three nights. 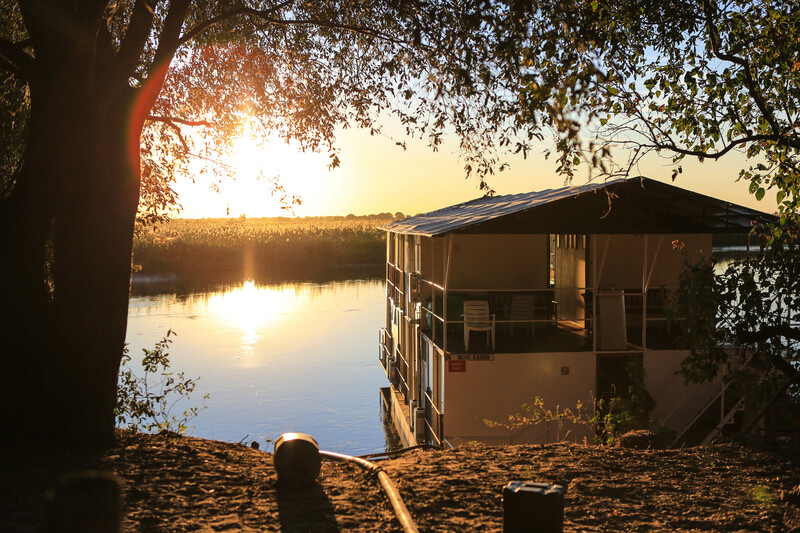 The camp was of a really high standard and the deck overlooked the river where we saw antelope come to drink, hippos bathing, leopards passing by, and some wonderful birds too. 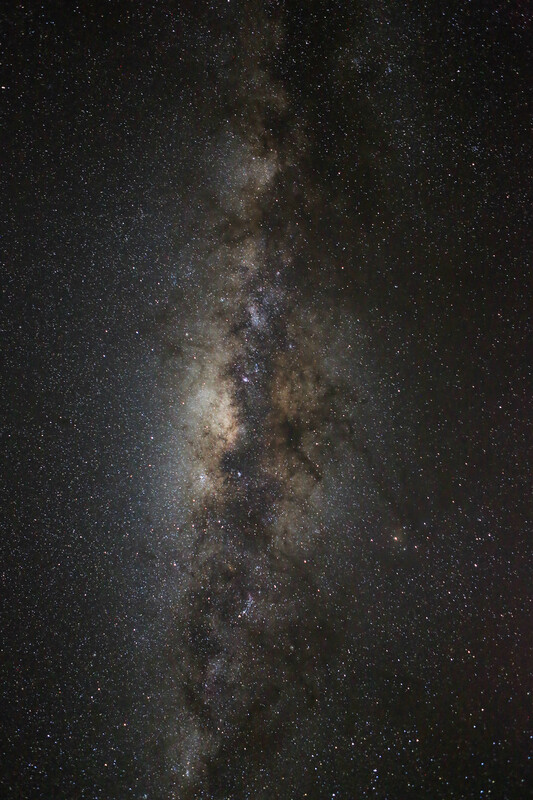 Whilst we were there, I enjoyed not only the daytime photography opportunities, but spent each evening trying to capture the milky way. The first evening, when the camp workers walked past me, they would giggle at this strange English woman standing out in the dark looking up at the sky. 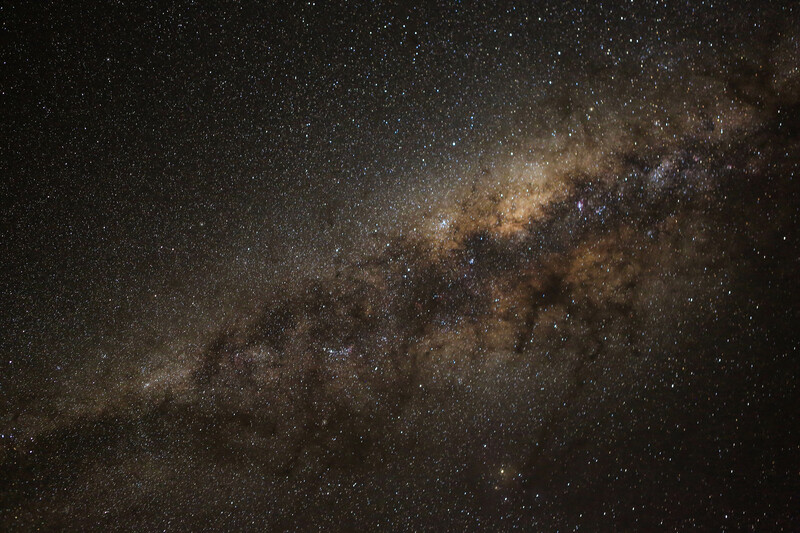 On the second night, the Camp manager asked me to show them the results of my photos, as he said they would never have seen a photo of the night sky. 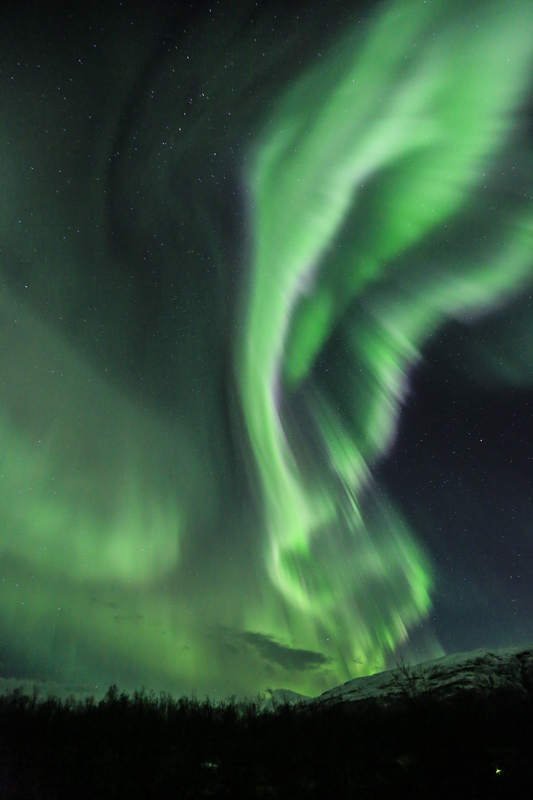 I was delighted at their reaction – most of them were totally amazed, and for the next two nights I was never alone out there, gazing up at the sky, but had at least 2 or 3 Camp workers who wanted to examine the back of my camera every time I took a shot! We had a fun experience in camp, when one of the other guests ignored all advice, and kept food in her camp. 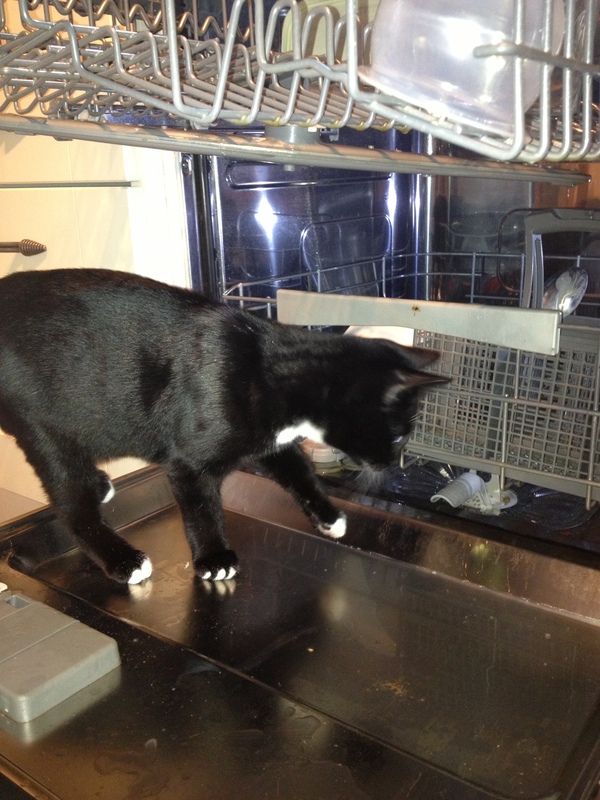 The food attracted mice … which in turn attracted a snake! 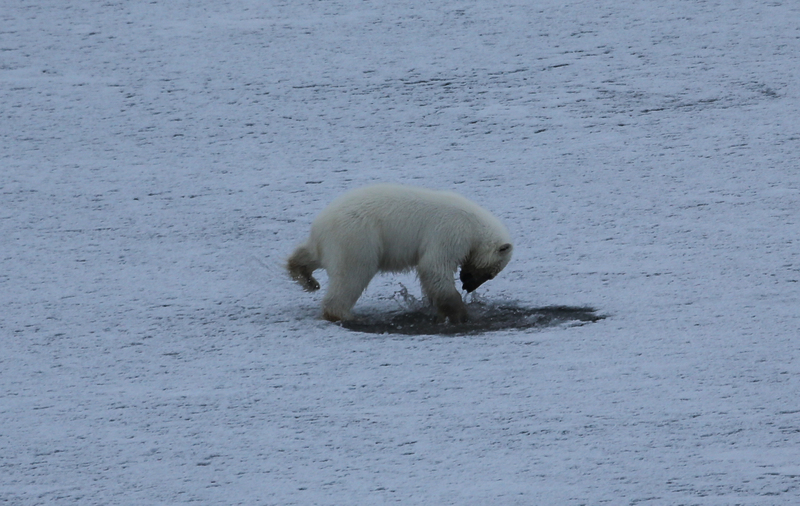 It was taken out of camp as soon as it was discovered, but not before we’d had a chance to take a photo or two! 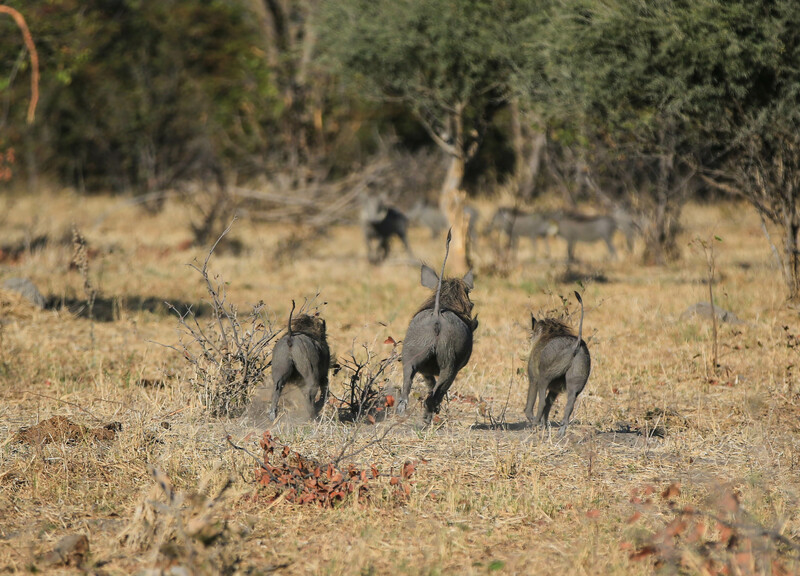 Whilst we were in the Okavango region, we saw plenty of hippos, birds, elephants, and antelope … but not the big cats that we were hoping for. 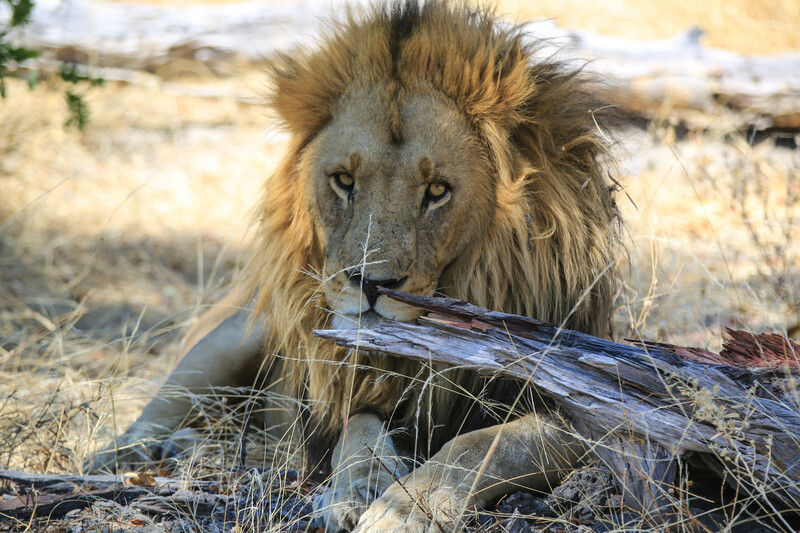 So, our guide Oli decided to take us to a reserve where he was pretty confident we’d see some lions – and he really didn’t disappoint! 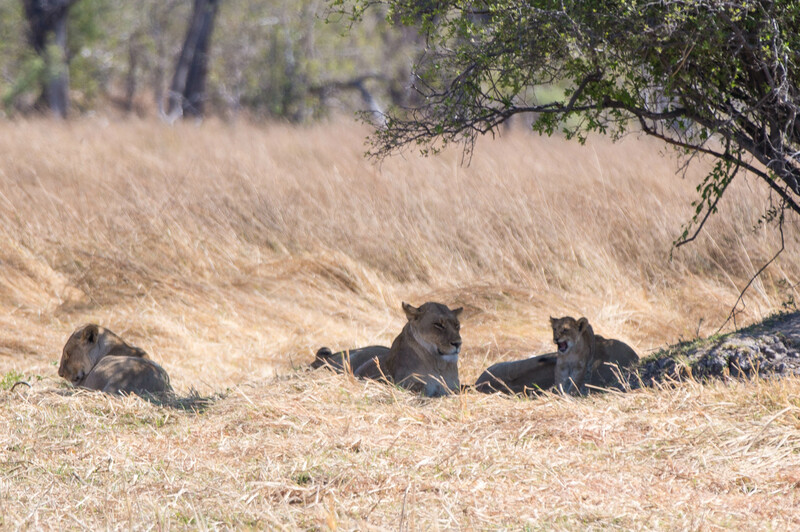 First we saw a few lionesses taking in some shade. What we didn’t realise at the time was that they were accompanied by a cub which I only realised when looking at my photos later! 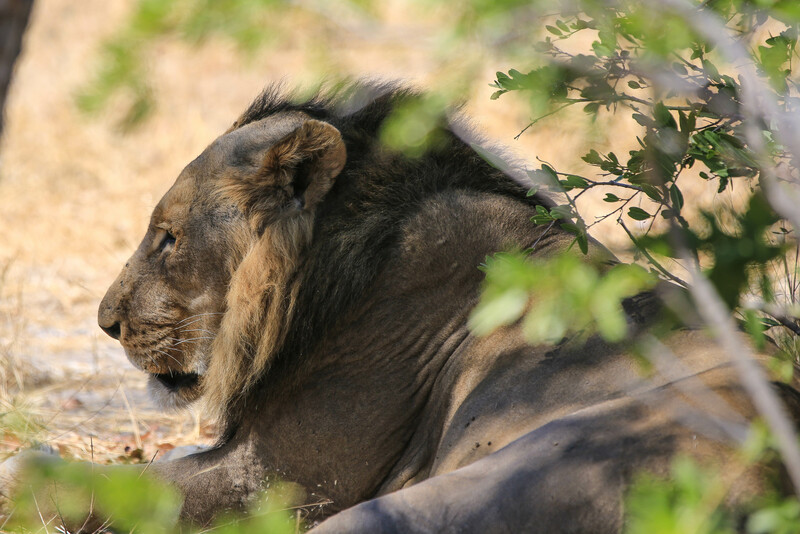 We left them after about half an hour, and drove around the corner, and came across two male lions and one female. 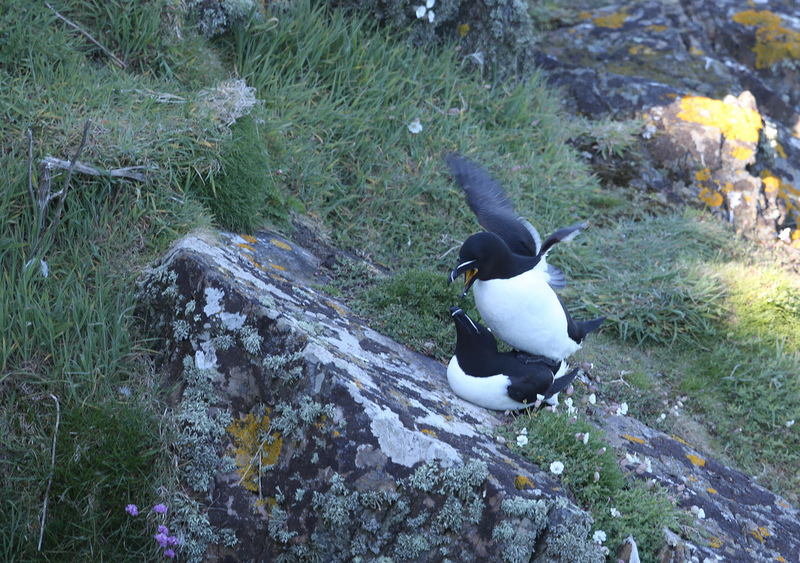 One brother (the ugly one) was definitely in charge, and happily mated with the female whilst we watched on! 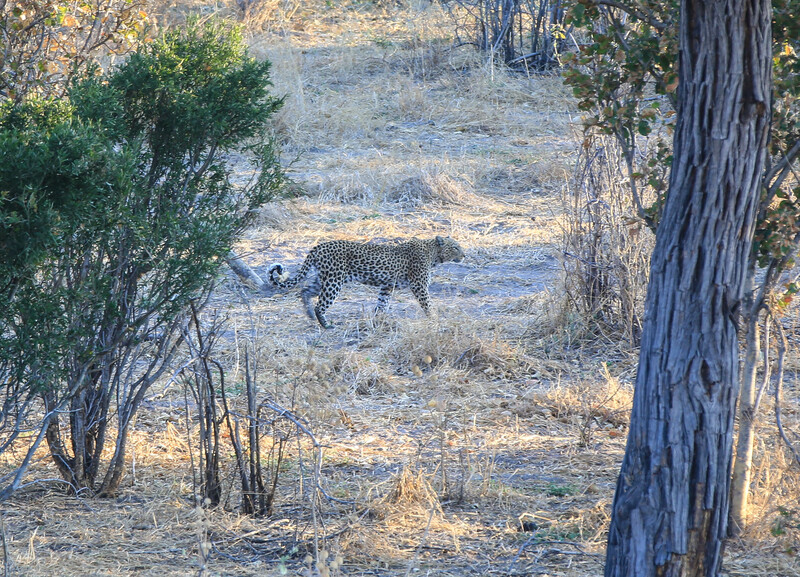 We returned to camp overjoyed, and were happily enjoying a sundowner on the veranda, when the local leopard put in an appearance too! So it was a day filled with big cats! 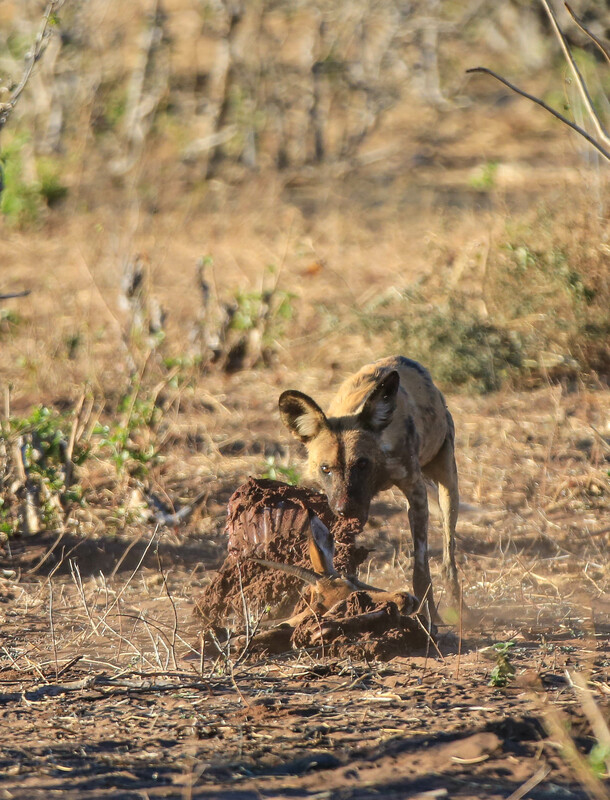 We left the Mogotlo Tented Camp, and headed off for our final game drive. 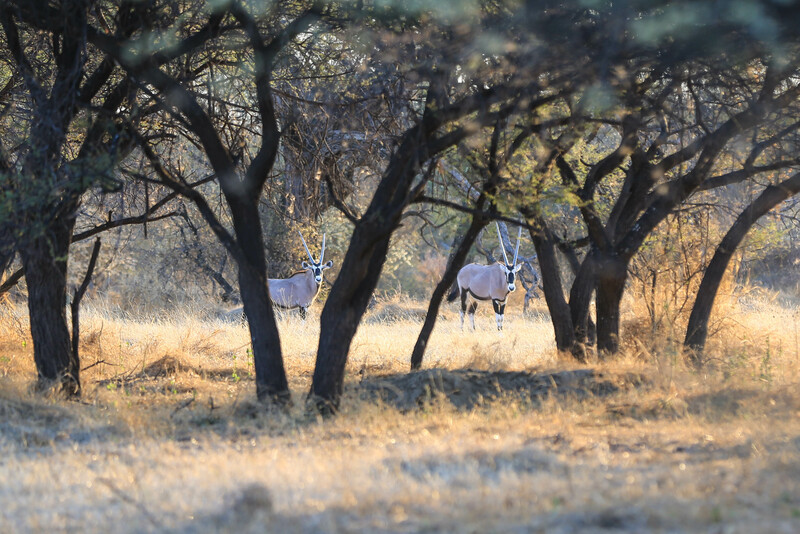 We then had a night at the Royal Tree Lodge which is a private reserve with no predators, and therefore we were able to get out and walk around the reserve. It felt really good to stretch our legs at long last. 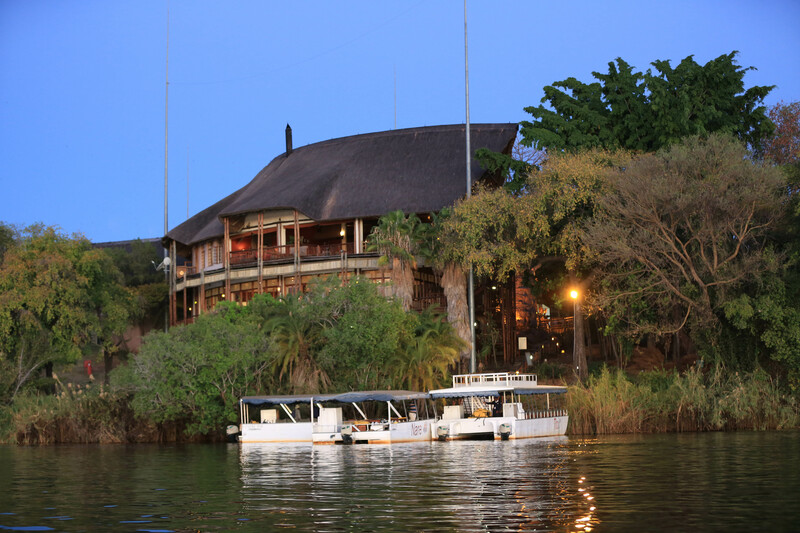 Leaving the Royal Tree Lodge, we headed back to the Okavango Delta for our two night stay on the houseboat. 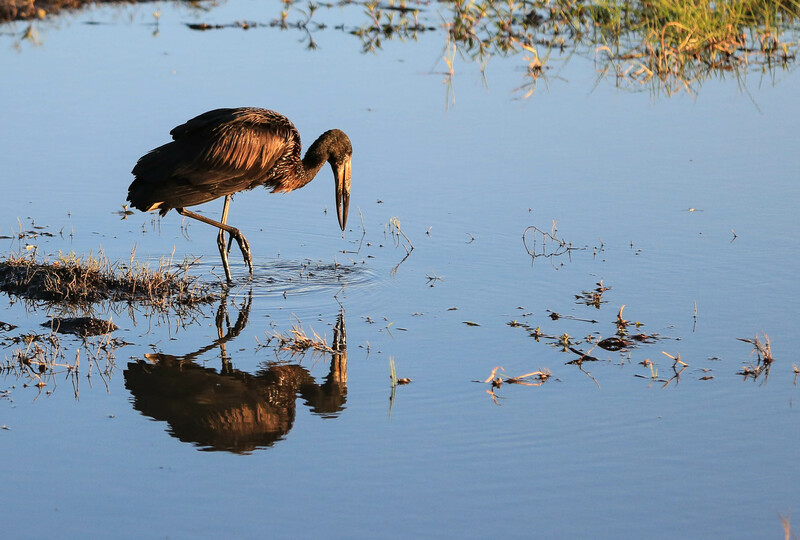 This was our opportunity to see more of the wonderful birds of Africa. The river was high enough that we were able to have a night moored further up river and really feel we were on an adventure! 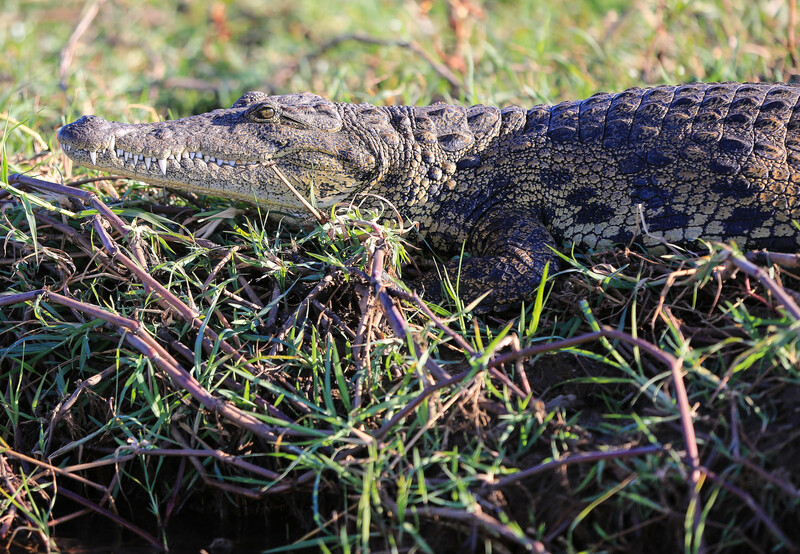 We were mostly watching birds in this area although there were plenty of crocodiles and hippos as well. It was interesting seeing people go about their work, as we relaxed on holiday! 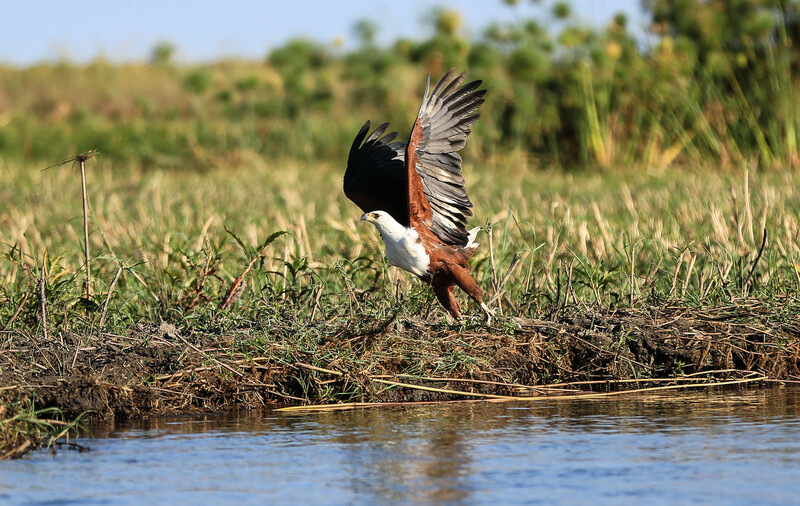 I loved seeing the African Fish Eagles catch their fish by swooping down to the river and grabbing the fish in their talons before flying off for their meal. Absolutely amazing birds. We even saw an incredibly rare Pel’s Fishing Owl. 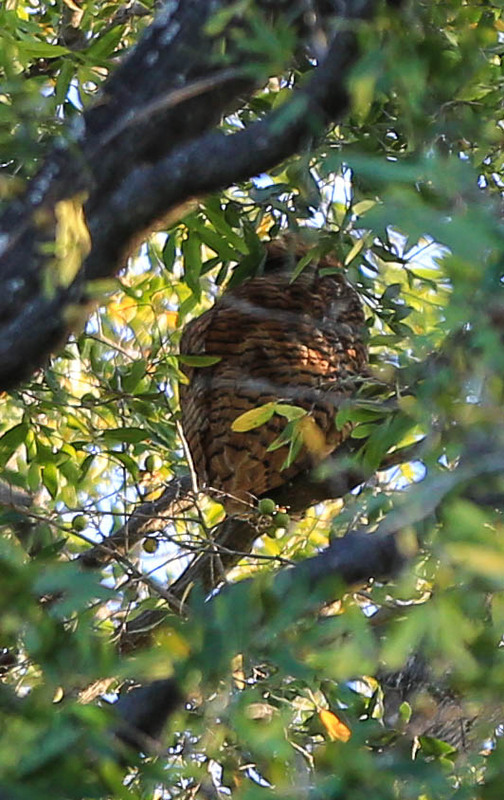 Apparently people go on 6 day trips JUST to see this owl, and we happened to slow our boat down under the right tree … it was mostly obscured, but it was there! 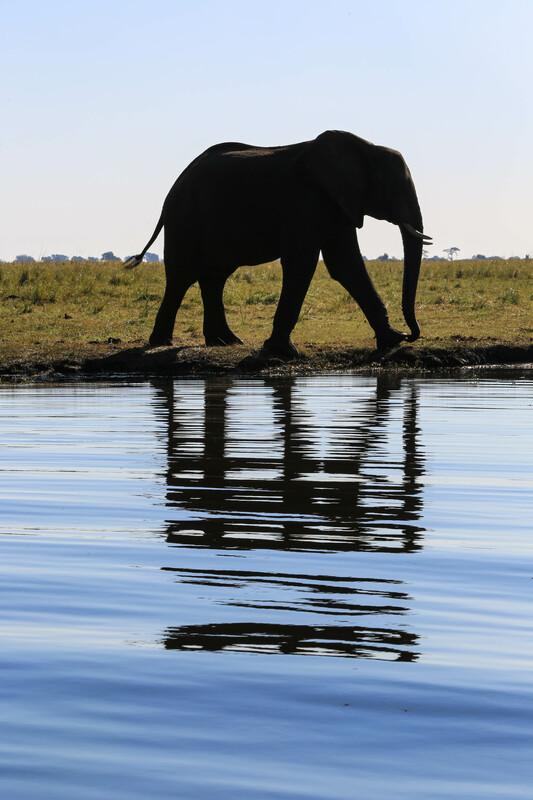 After two nights on the houseboat, it was time to head towards the Chobe National Park. We were upgraded to a lodge on the river front. From there we headed out by van and by boat. 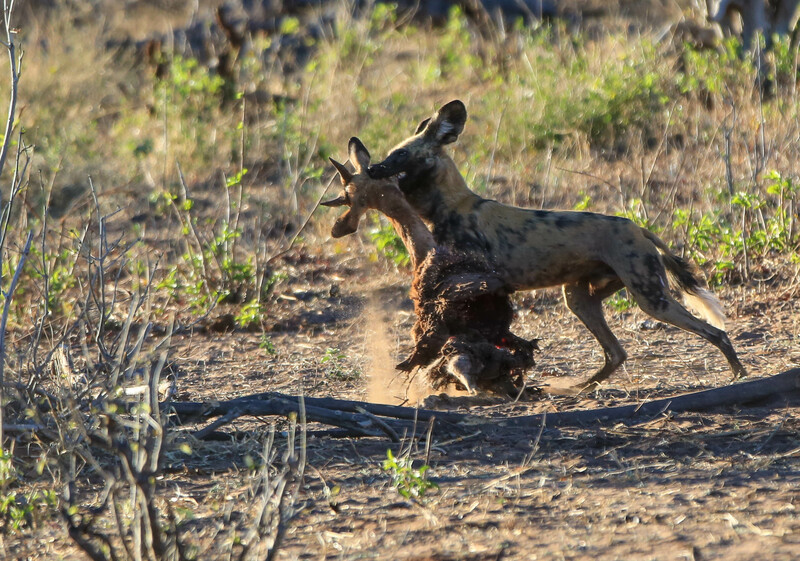 We saw an amazing African Wild Dog chase and kill. 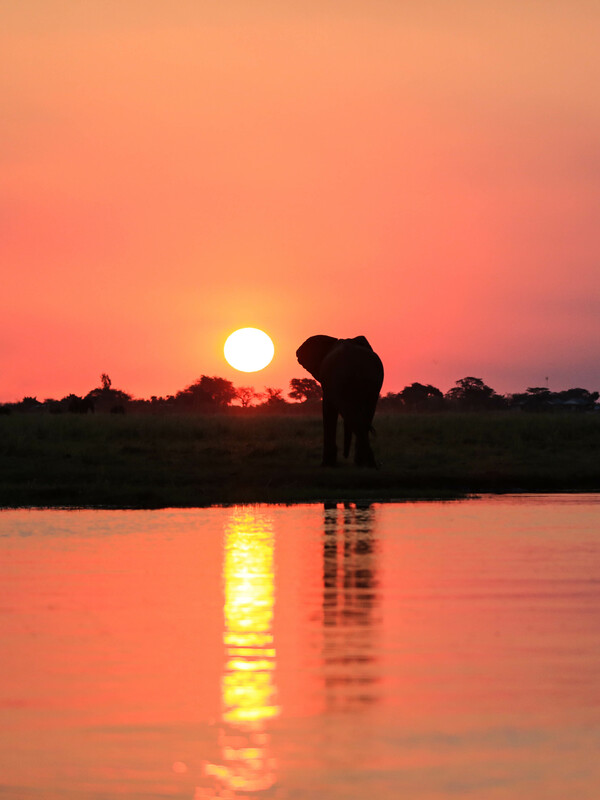 We also saw lots of elephants, who would often be pretty close to the water’s edge, feeding on the long grasses … and we even saw the most amazing elephant parade as they swam across the river from the Zambia side into Zimbabwe. 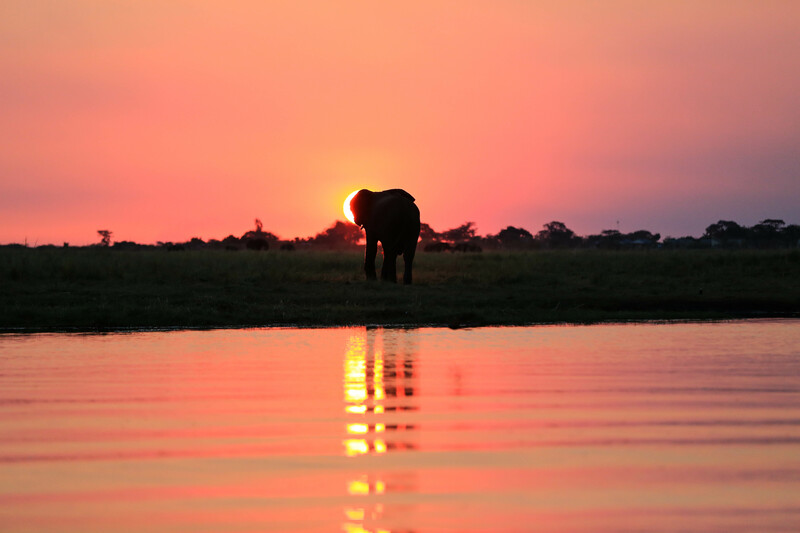 Then at sunset, we were delighted that we could see them silhouetted against the sun. 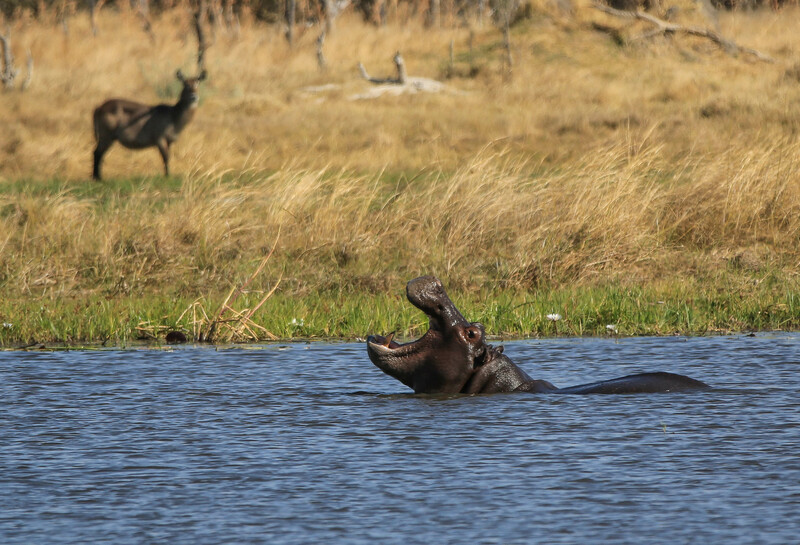 After the delights of the Chobe area, we headed off for Zambia. 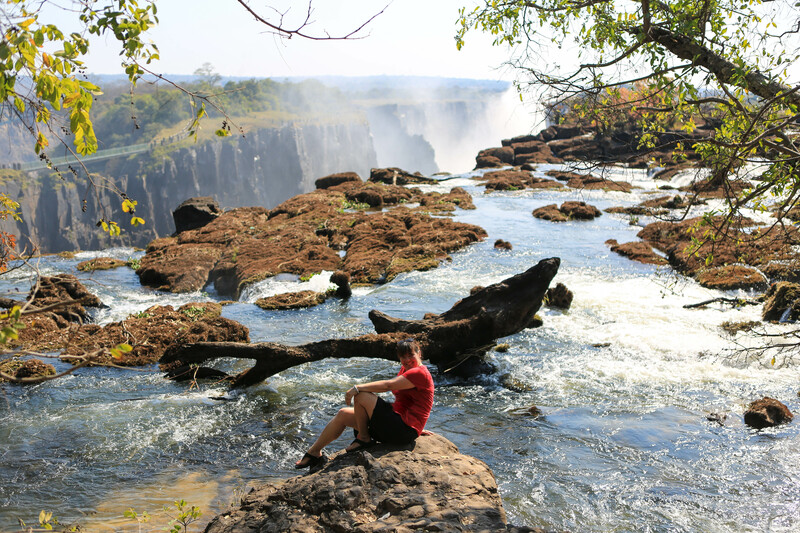 Aside from the flat tyre on route, it was a long drive to a boat, where we crossed over into Zambia, and transferred to a new vehicle, to go across the country lines, and up to Livingstone. 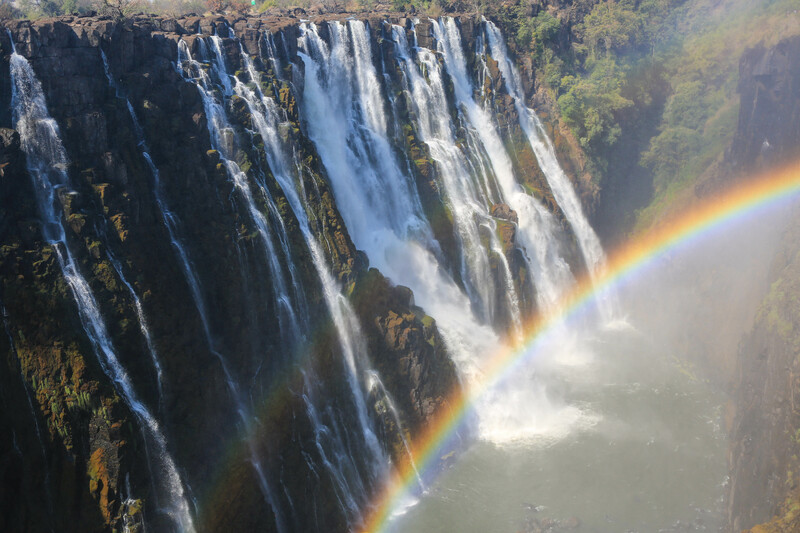 We stayed in the Zambezi Sun Hotel, where we were able to walk through the grounds directly into the Victoria Falls park. 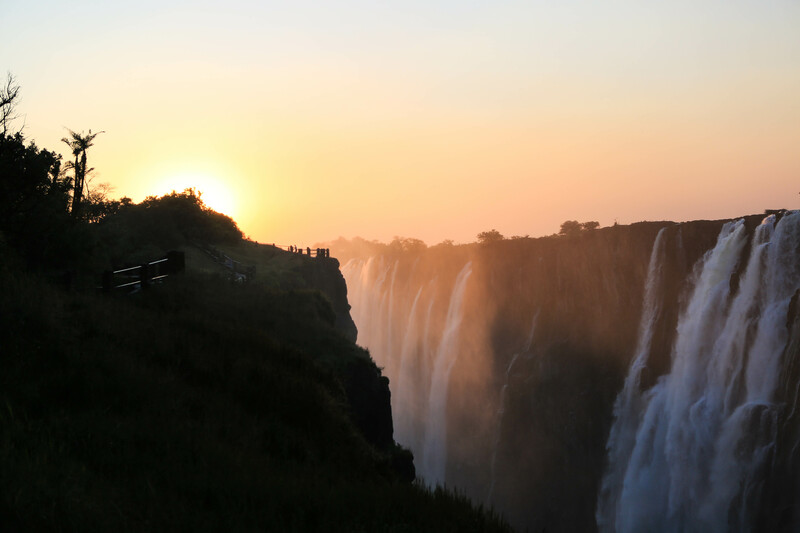 The key attraction here was the Victoria Falls … and sunrise … sunset … and all the times in between! 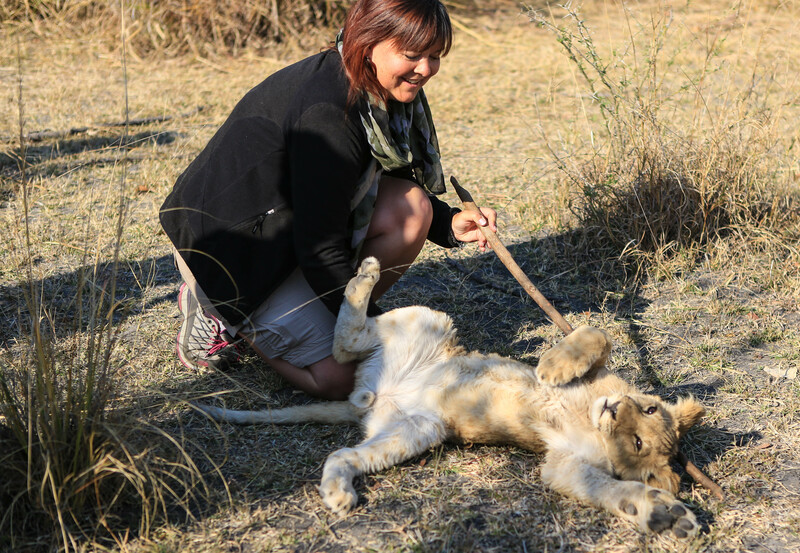 But we also took the opportunity to “walk with lions” which supports a charity who rescue orphaned cubs in a 5 step programme to ensure that the second generation of cubs will be re released to the wild. It was the most incredible experience and one that I will not forget. 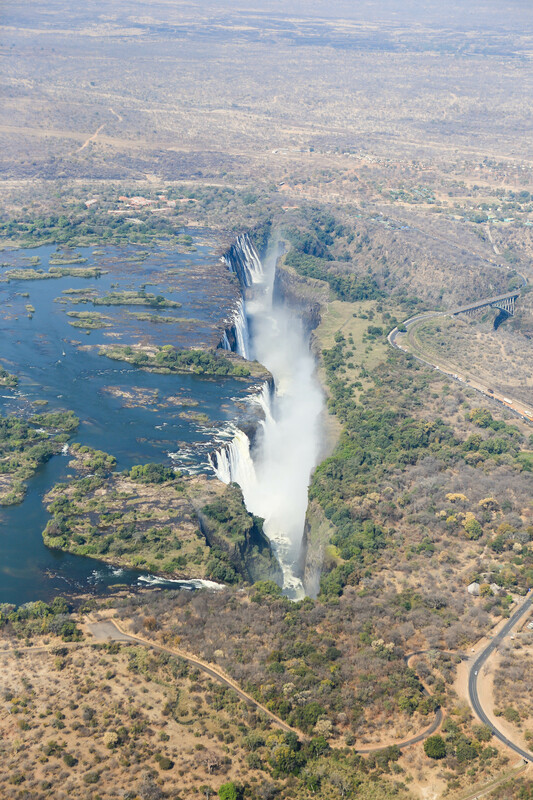 The second thing we did that was an incredible experience was a helicopter flight over the falls themselves. The helicopter was like something that you could imagine flying in and out of ‘Nam! 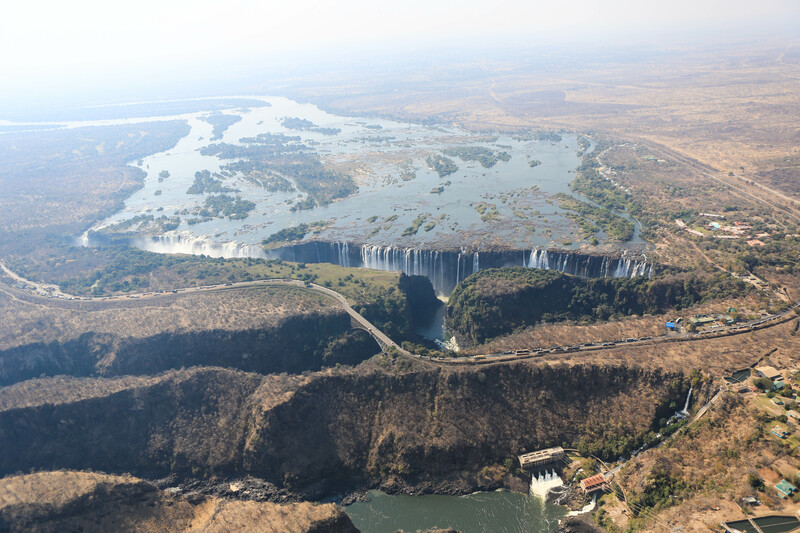 I sat near the back, with an open door, holding on to the roof as we banked over the falls to stop myself from slipping off the seat out into thin air! 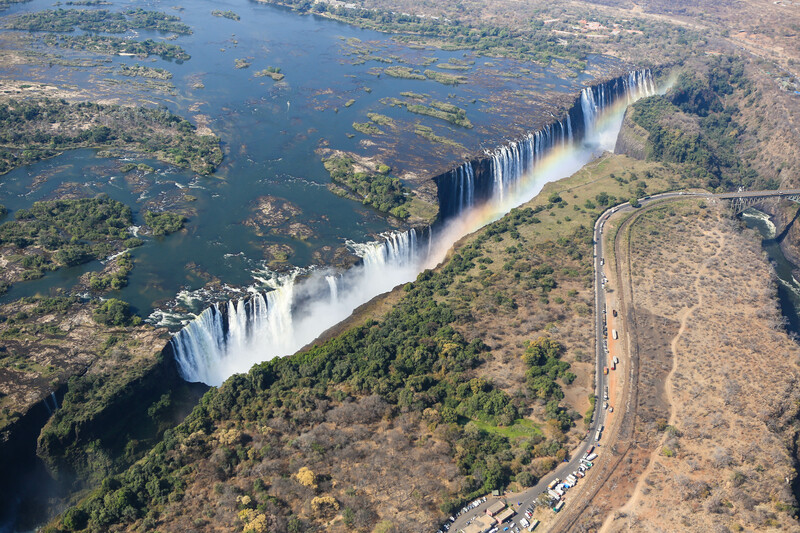 Very exhilarating and simply awe-inspiring to see the falls from that angle! 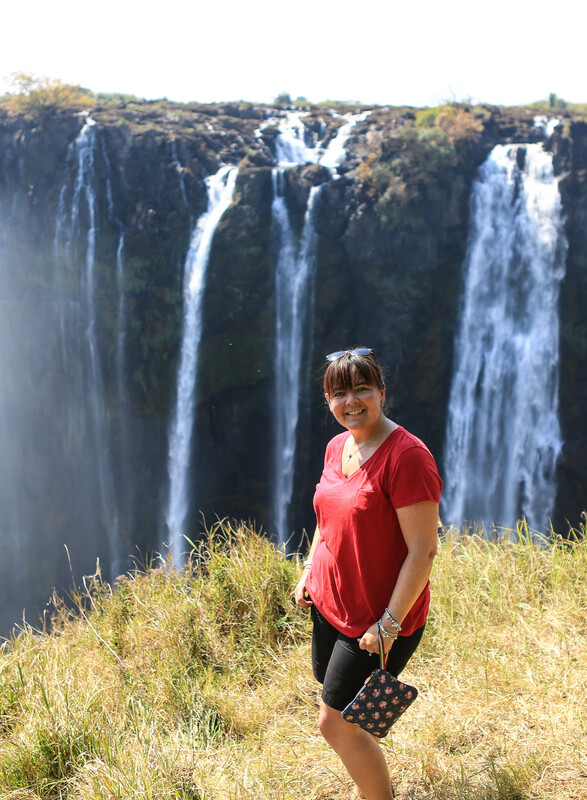 Before I knew it, the tour was over and I was headed home with a bag of full memory cards, a head full of incredible experiences, and some new travel friends to boot! I didn’t mean the monkeys … I meant these guys …. !! 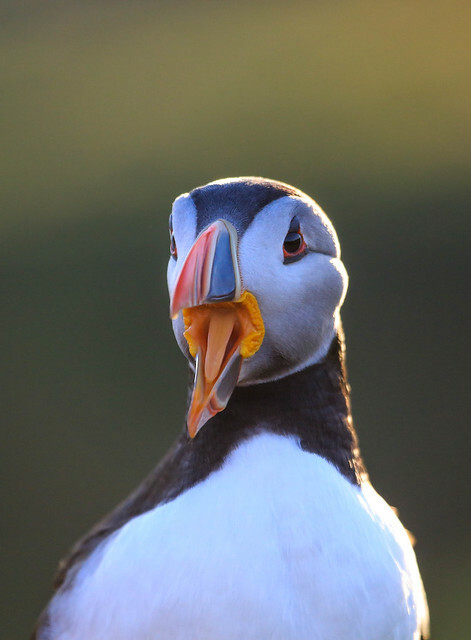 I’ve really enjoyed photographing Puffins for the last couple of years, and had thought about going again this year, but hadn’t really had time to organise anything. 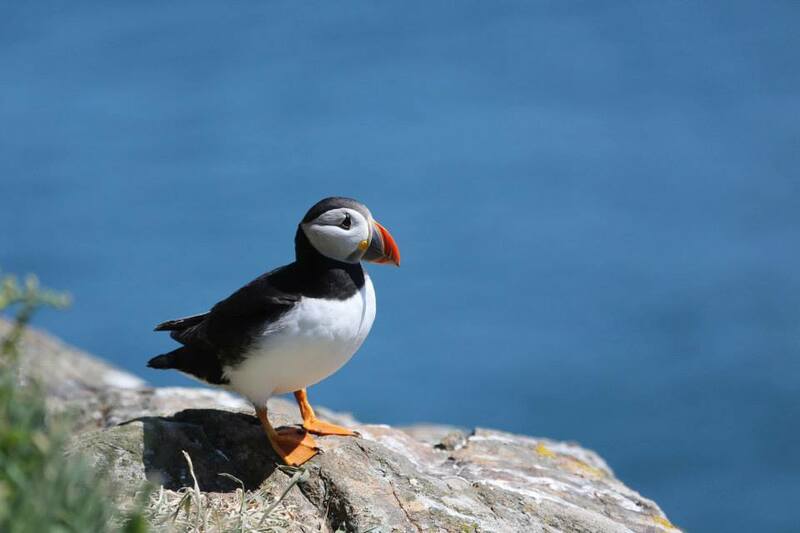 Then I saw a post on Facebook from the Skomer Island page saying they had had a cancellation in their hostel, and there was space for a 2 night stay in mid June which is prime Puffin time! 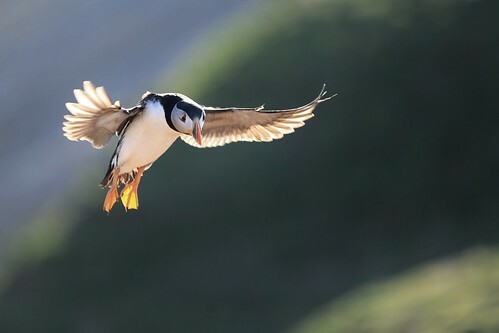 I reached out to some friends and within a couple of hours, we’d made the decision to go and stay on Skomer for 2 nights. 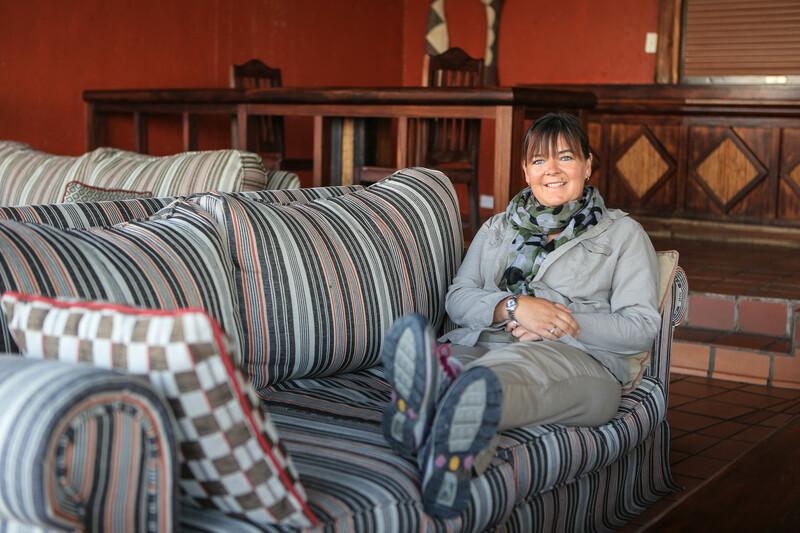 It’s definitely something I would recommend – although it does come with the proviso that you have to be prepared for “hostel” type accommodation. No heating in the rooms, shared bathroom, single kitchen for use by all 16 guests, bottled gas for everything so you should only boil the water you need not just blindly fill the kettle etc. You have to take everything with you and carry it yourself (there is a tractor that will take your bag from the jetty to the hostel). On the list of things to bring are things like sheets, tea towel, all food and drink you need for your stay plus extra incase the weather changes and you can’t get off the island! Etc etc etc. But if you can see beyond that, you have two full days on the island, with very few other visitors – especially if you can manage to include a Monday in your stay, as the Island doesn’t have any other visitors on a Monday unless there’s a bird watching walk (about 15 people staying for an hour or so) – which means you get the island to yourself on Mondays. We arrived Sunday, and managed to cover pretty much the whole island during the course of the day. It’s a beautiful island, and the flowers were out in abundance. We literally just wandered around, stopping to photograph whatever we saw, and enjoyed the warm sunny weather. 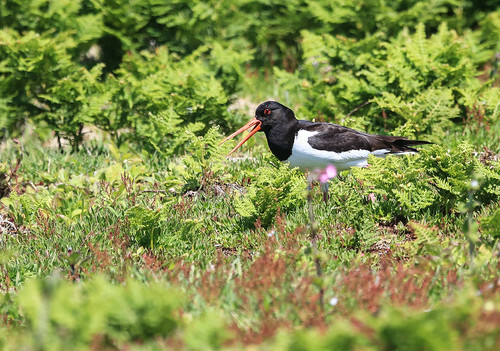 There were all sorts of LBBs (little brown birds) … there were stunning Oyster Catchers, curlews, and choughs, there were buzzards, a peregrine, little owls and short eared owls. 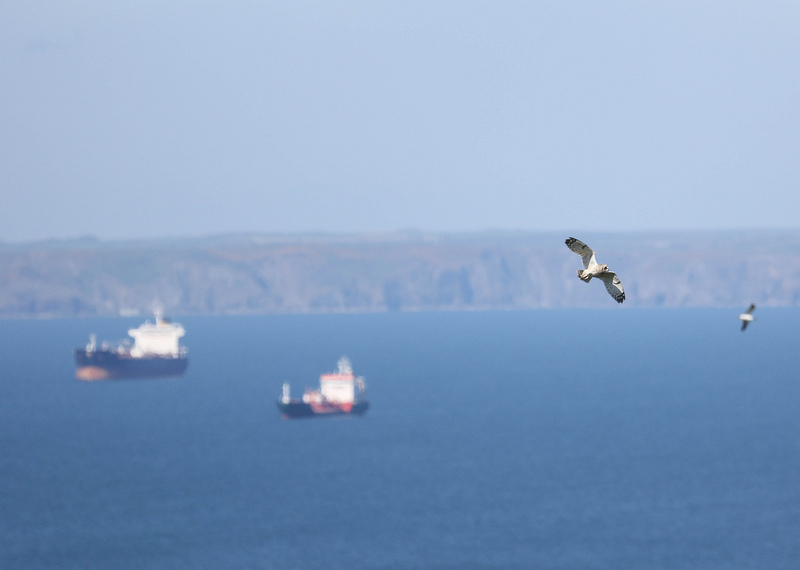 Then there were kittiwakes, razor bils, guillemots, black backed gulls, gannets and of course PUFFINS! We even went out at night to hear (and just about see) the manx shearwaters whilst being treated to a great display by the glow worms! 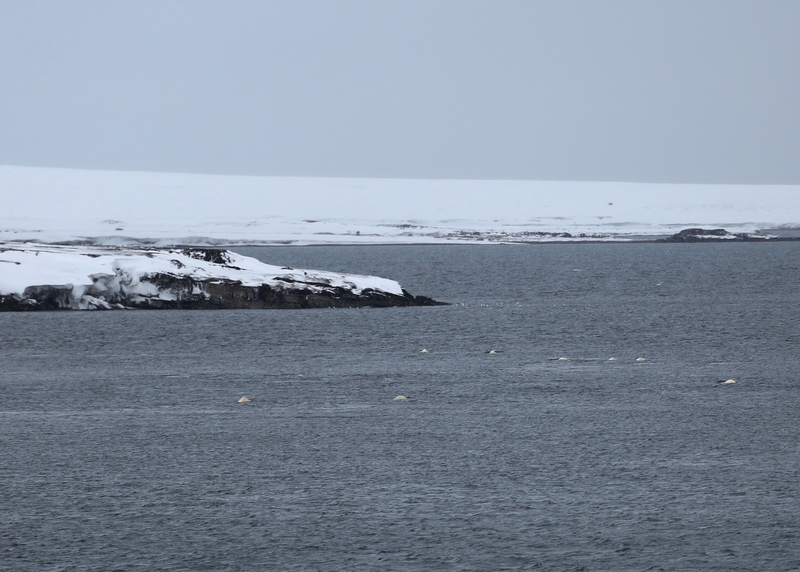 We also saw seals in a couple of the bays around the island, and porpoises as well! It really was an amazing trip and definitely something I could see myself repeating. Sitting on the Wick (for those who haven’t yet visited Skomer, the Wick is where many of the puffins have their burrows so it tends to be covered in puffins coming and going) as the sun went down, with a glass of wine in hand, enjoying the calls, flirts, and flutters of the puffins all around me was something incredibly special. 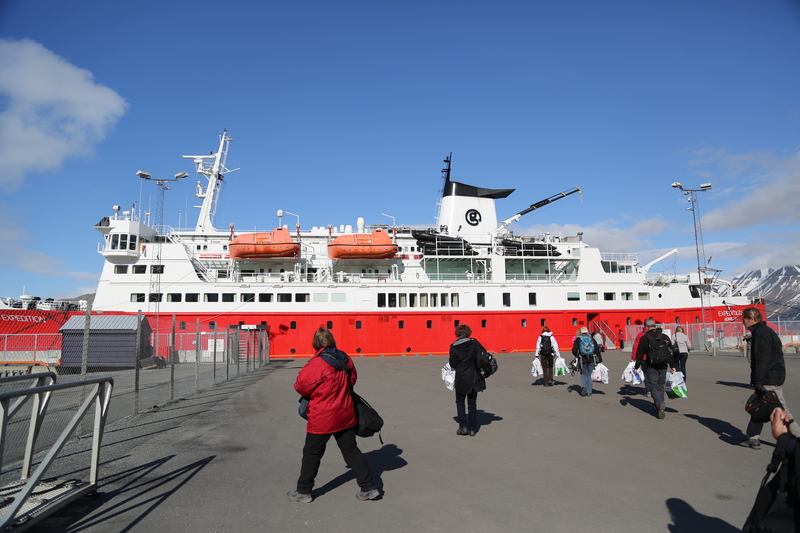 This year I decided to return to Svalbard for a week long holiday on a boat. 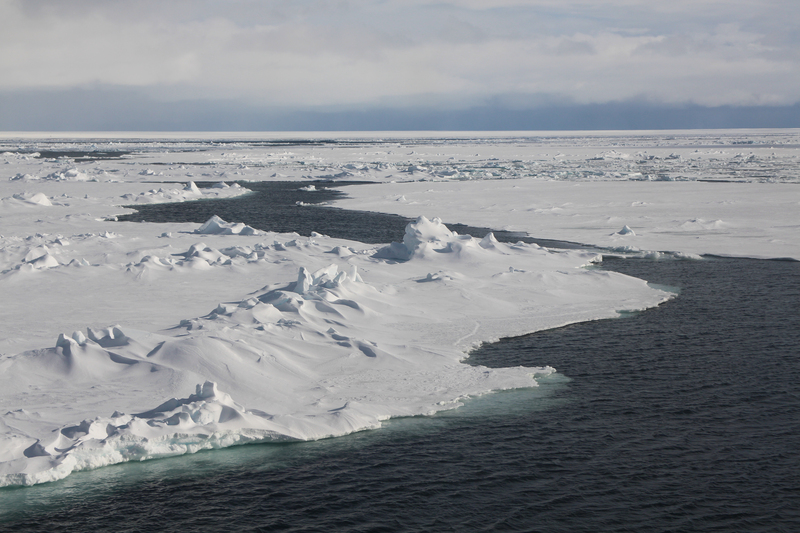 The goal of the trip was to circumnavigate the islands, but of course, all things are weather dependent, and on arrival we were told that it was about 95% sure that we would not be able to get very far around to the North due to the amount of pack ice that there was still in the area. 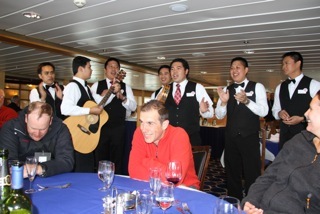 But, being that I had booked on an adventure, I was happy with whatever our expedition leader, John, decided for us. 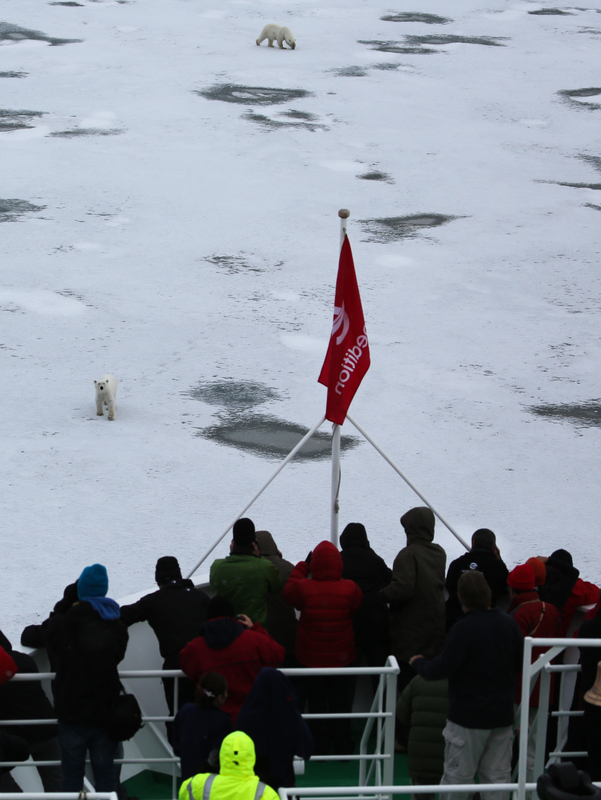 After all, pack ice meant a higher chance of seeing polar bears, as they live on the ice edge, so there were advantages to too much ice! 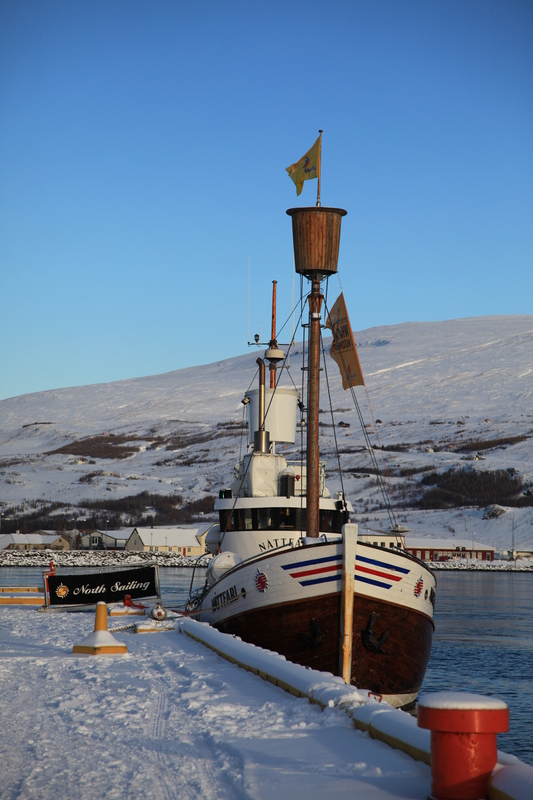 We left the interesting town of Longyearbyen on a sunny afternoon, with temperatures above freezing and light winds. 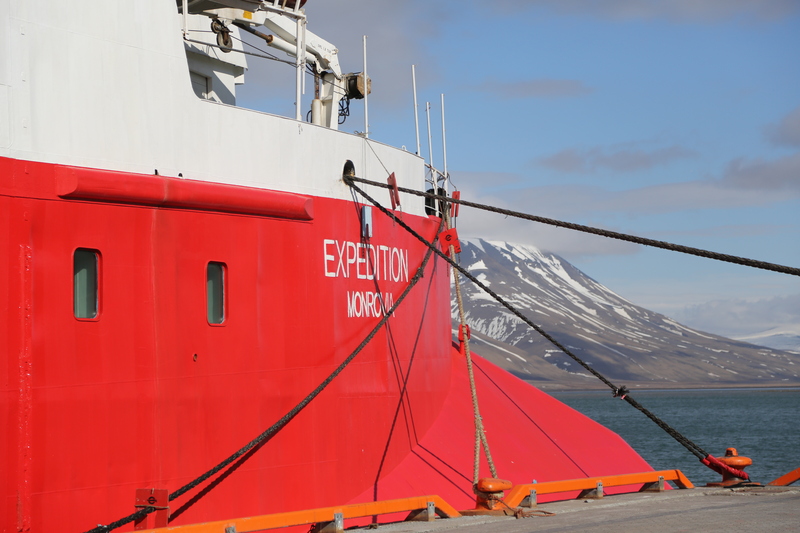 We were to be based on the M/S Expedition for a week – it’s a converted ferry that makes its way from Antarctica, up the West coast of Africa, and on up to Scotland, Norway and finally Svalbard. 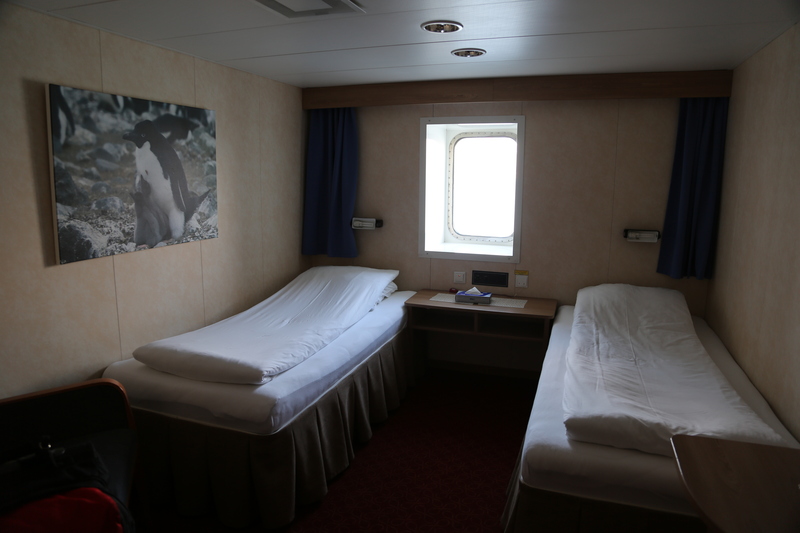 Although you could see the tell-tale signs of its old life as a ferry, the boat had been totally overhauled by G Adventures, and our cabins were spacious, and very well looked after! 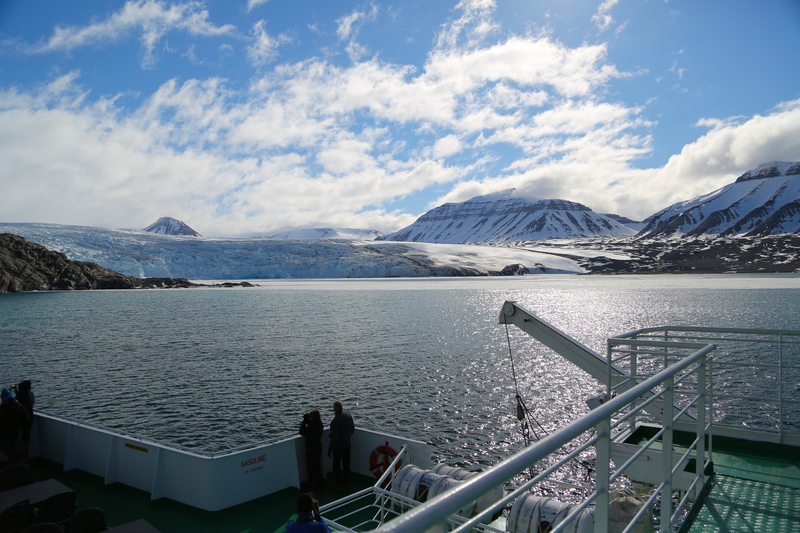 We headed up towards Nordenskioldbreen, the glacier in front of which we anchored for the night! What a view over dinner and from our cabin porthole! It was a great start to our trip. 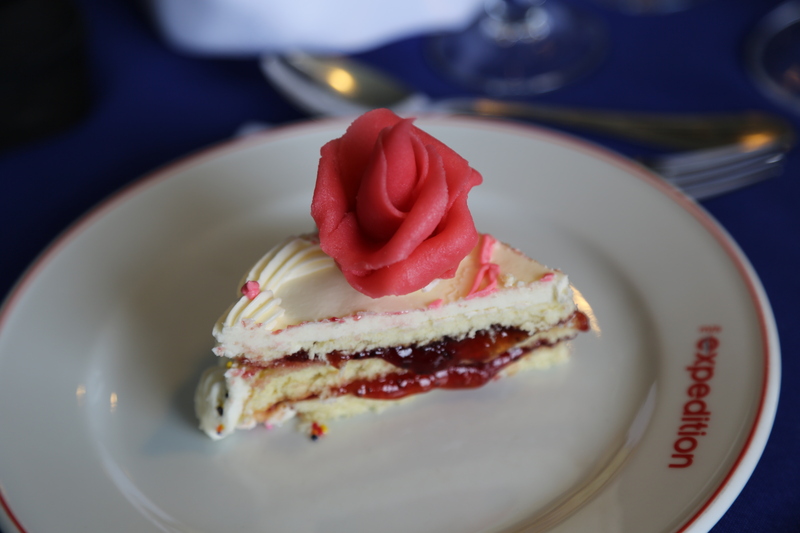 It was actually my birthday on that first evening, and I was presented with Champagne and a cake at dinner time, and also had all the wait-staff sing to me … they then queued up to give me a hug and a kiss! It was an embarrassing but great way to start my holiday! 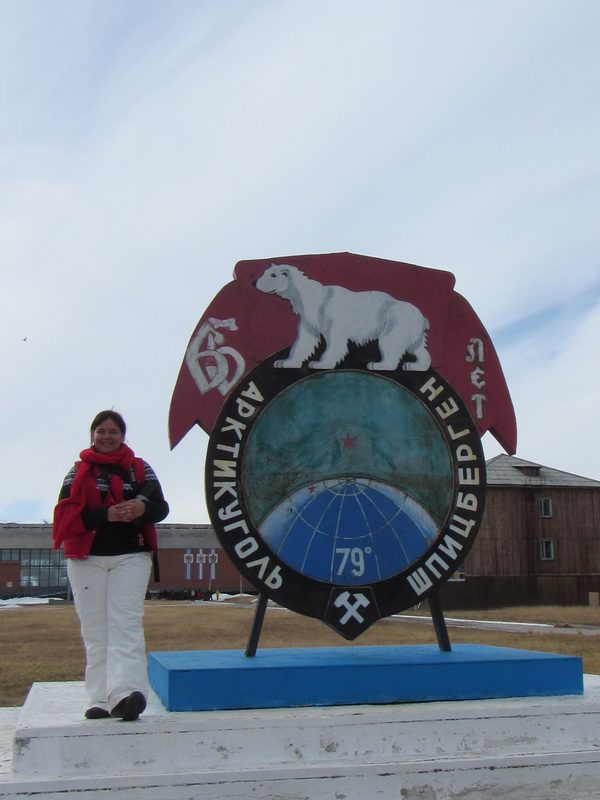 The next day was another pretty sunny day, and we headed over to Pyramiden which is an abandoned Russian mining town. Well, mostly abandoned. 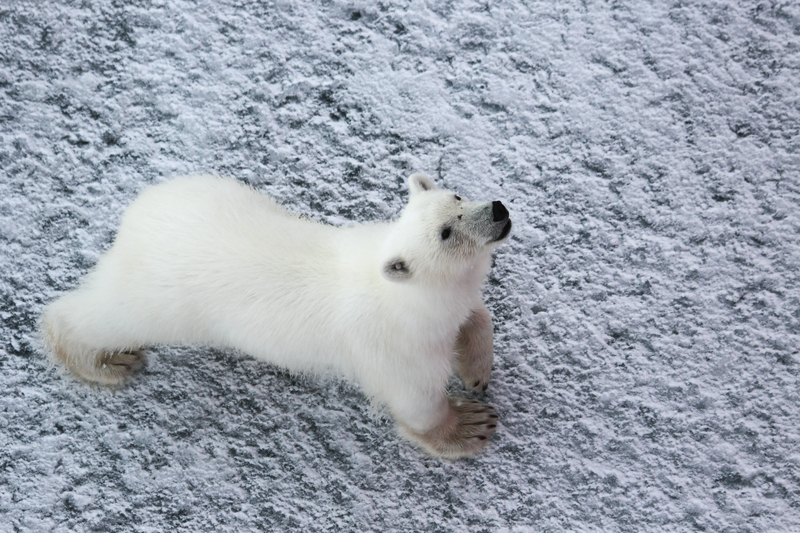 There are still a few Russian inhabitants, and they are always delighted to share a glass of vodka with you, and tell you all about the mother polar bear and cubs that wandered through the town the previous day! 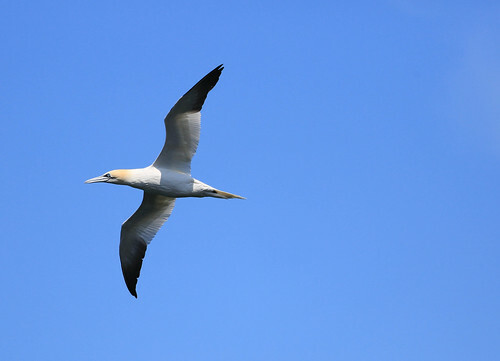 Many of the buildings have also become key nesting sites for the birdlife too. 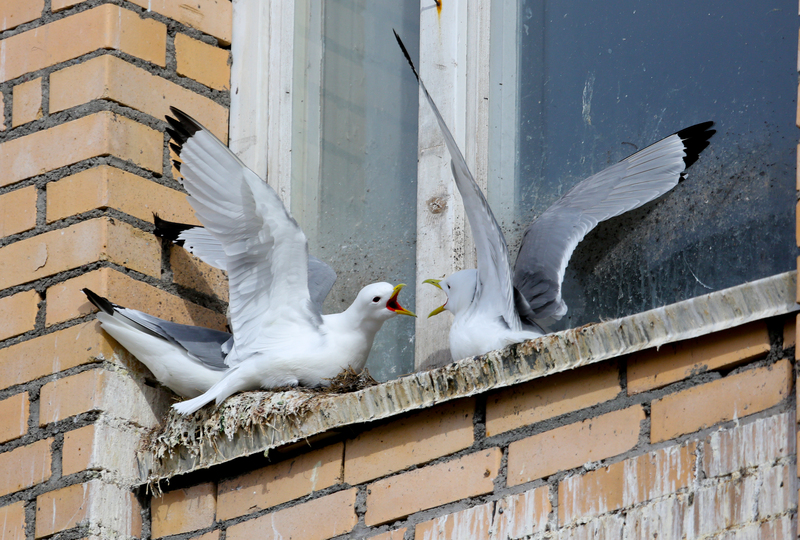 Kittiwakes have made nests on air conditioning boxes, window sills, airbricks, and anywhere that there is a small hole to perch on! They are very noisy neighbours, and in summer, that is potentially 24 hours of noise! 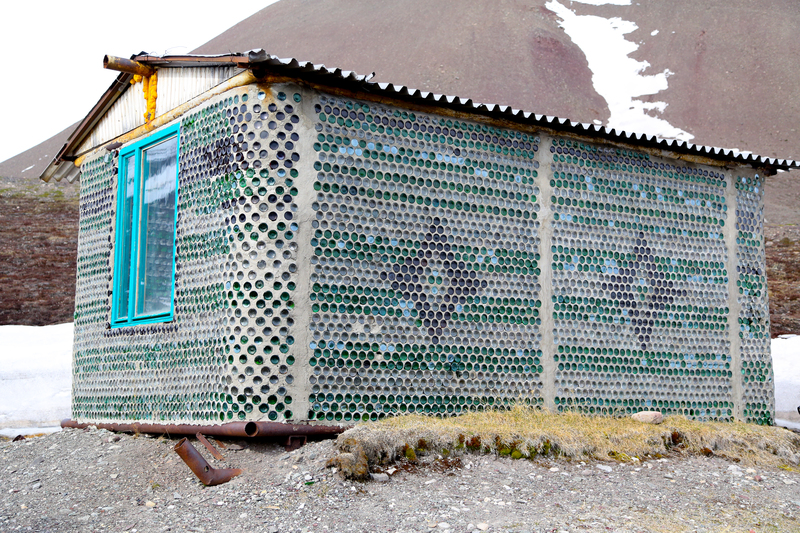 The Russians always ensure there are a few people still at Pyramiden, and we discovered what they do to keep themselves occupied during the winter polar nights (where the sun never actually breaches the horizon) … they build houses … out of what they have to hand … and it seems they have a lots of bottles to hand! It’s amazing to be in a place that is effectively a small town, with only a handful of residents. 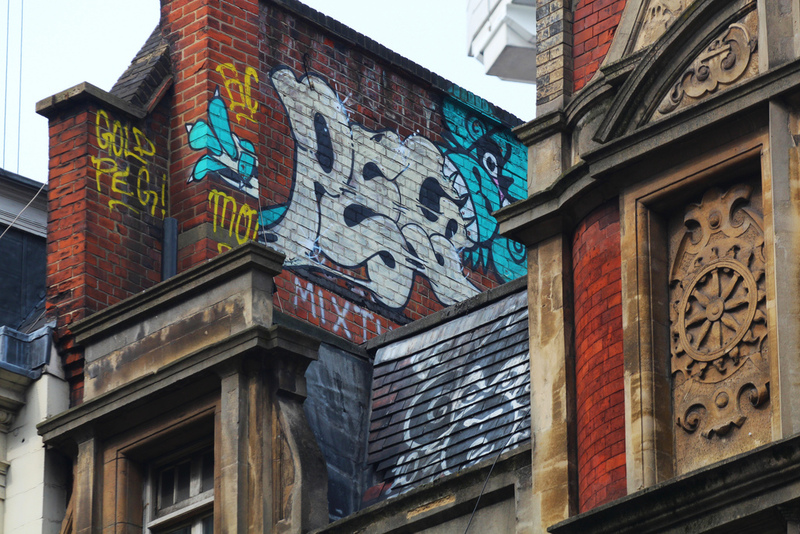 It’s feels a little like we were urban explorers! 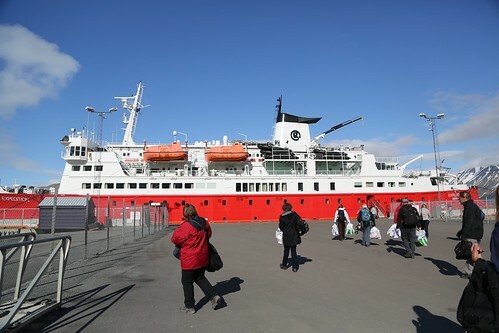 The next day, we headed off out to sea, going North up the coast to find Magdalenefjorden, which we were told was a place with lots of bird and wildlife. 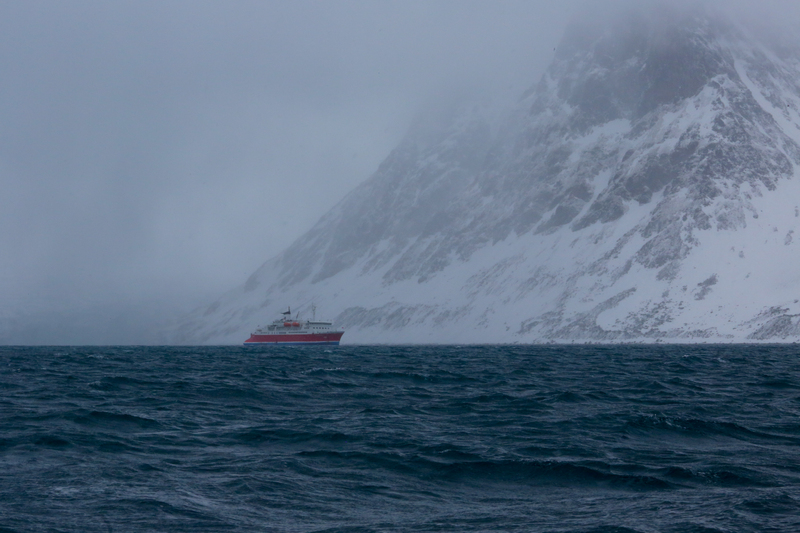 As we got out of the shelter of the fjord, the visibility really closed down, and we were travelling in temperatures of around freezing, and we had both fog and snow to contend with! How different to our first day! 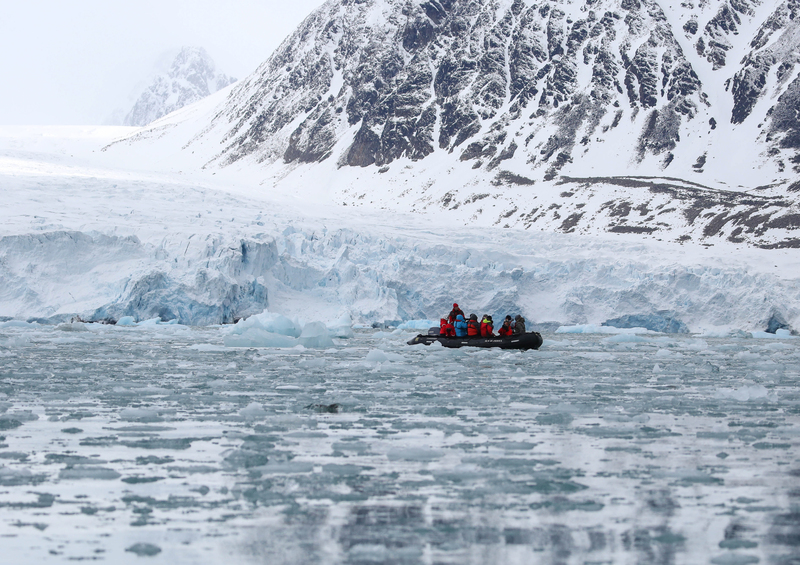 We did however brave the zodiacs, and had a cruise along the tidewater glacier to take a closer look at the little Auk colony (otherwise knows as Dovekies). 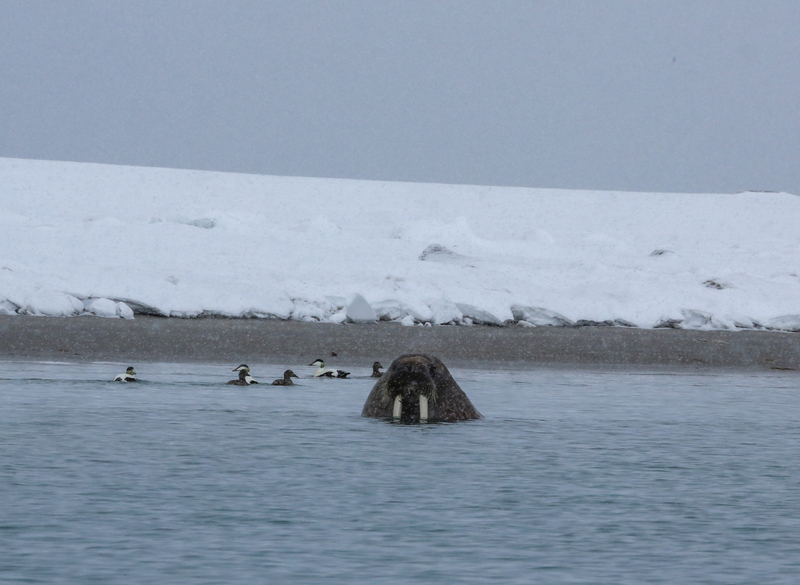 We then had our first ice-based large wildlife sighting … of a bearded seal. 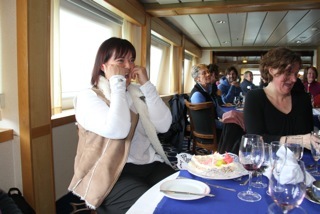 The captain, Thomas Roder, slowed the boat down, and we crept forwards as quietly as a large ferry can! We managed to get pretty close before the seal decided he’d go for a long swim! 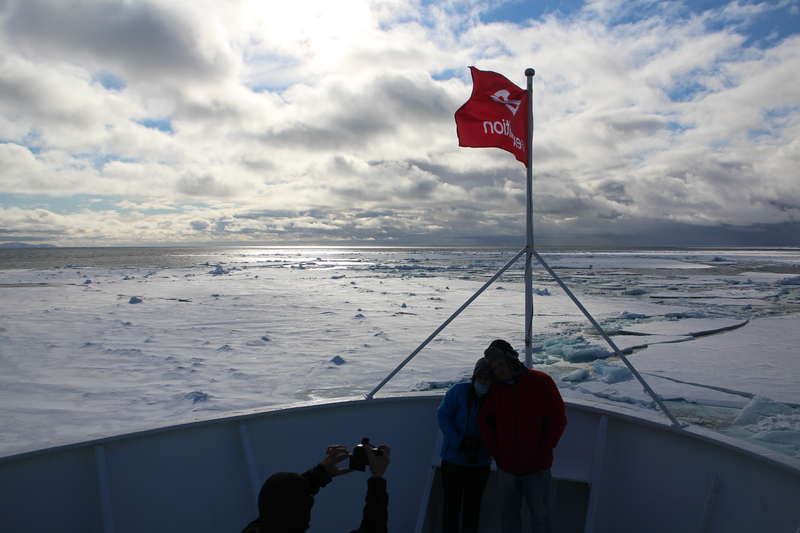 Later that day we reached our most northerly position of 76° 57.76′ N. We cruised along the Polar Ice Cap. 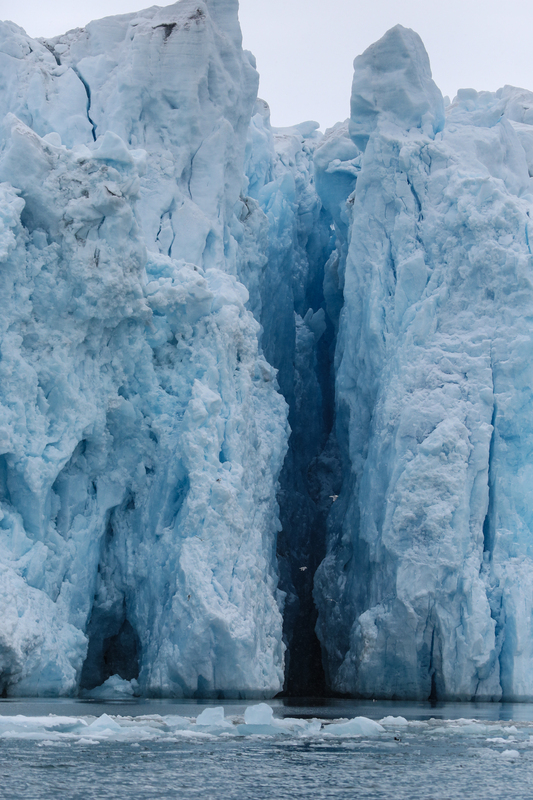 Everywhere we looked there were sheets of ice in all directions. 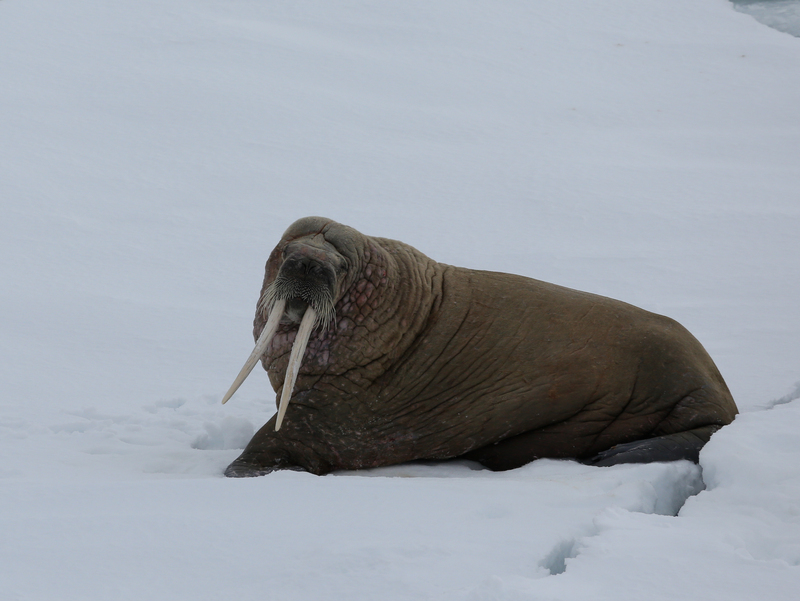 The next day, with good visibility and temperatures of about a degree and plenty of clouds in the sky, we continued along the Ice Cap edge, and saw a huge walrus who was kind enough to wait for us to approach before abandoning his resting place! 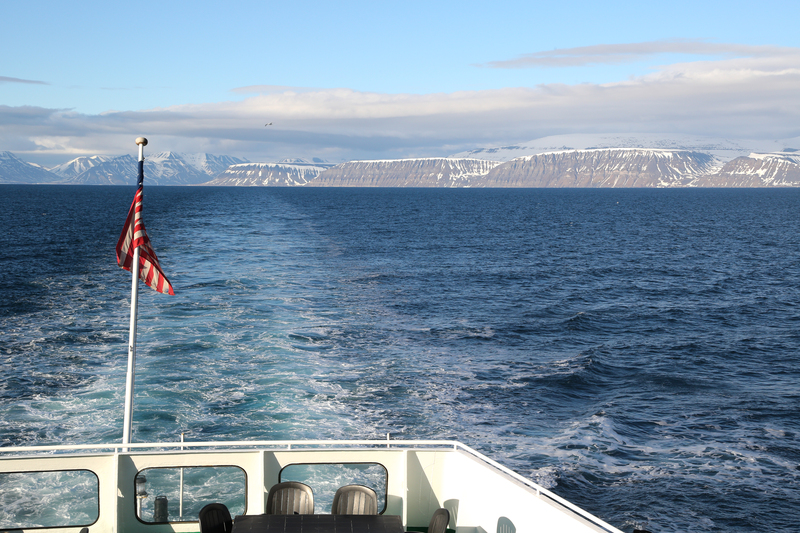 We then decided due to the lack of available routes to continue East along the top of Svalbard, to head down into Woodfjorden. 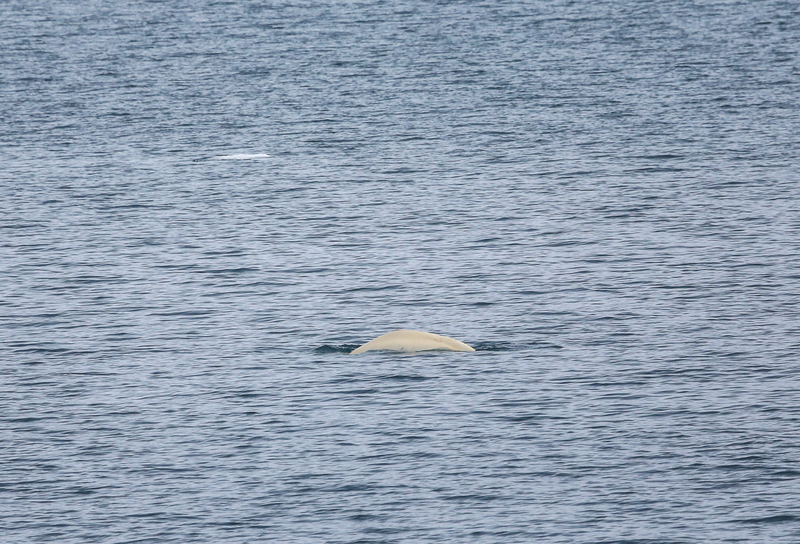 We came into the area known as Reinstrandodden, and were excited to see a pod of around 100 beluga whales. At this time of year they are very yellow, and that is because they need to exfoliate! 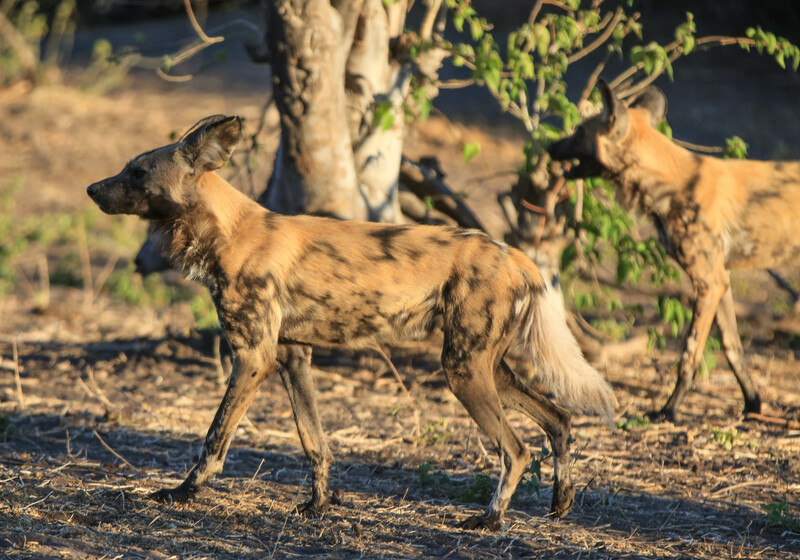 Usually around July time, they will find somewhere that is fairly shallow, where a river empties out into a larger body of water, so that they can rub off their old skins, and return to their paler white colour. But for the time being, they are yellow! 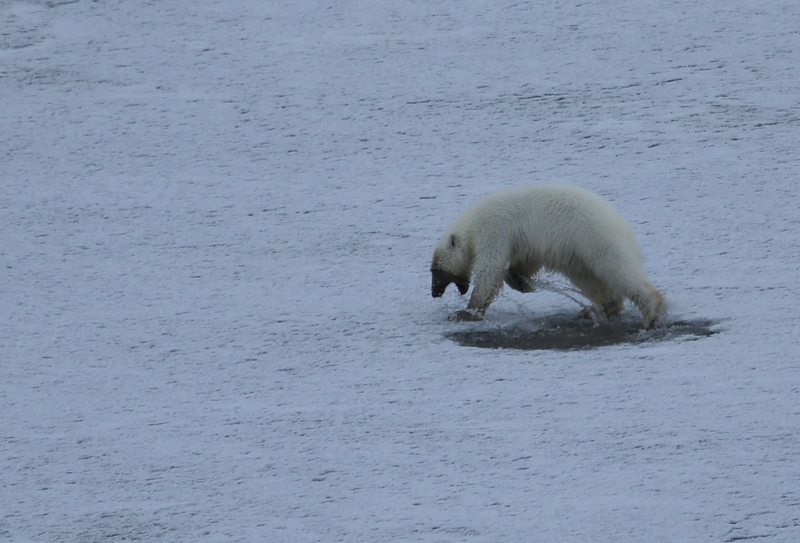 Our expedition staff were very excited by this sighting, as they are a rarer sight even than polar bears! Going by this revelation, we were getting pretty excited about our chances of seeing a bear! 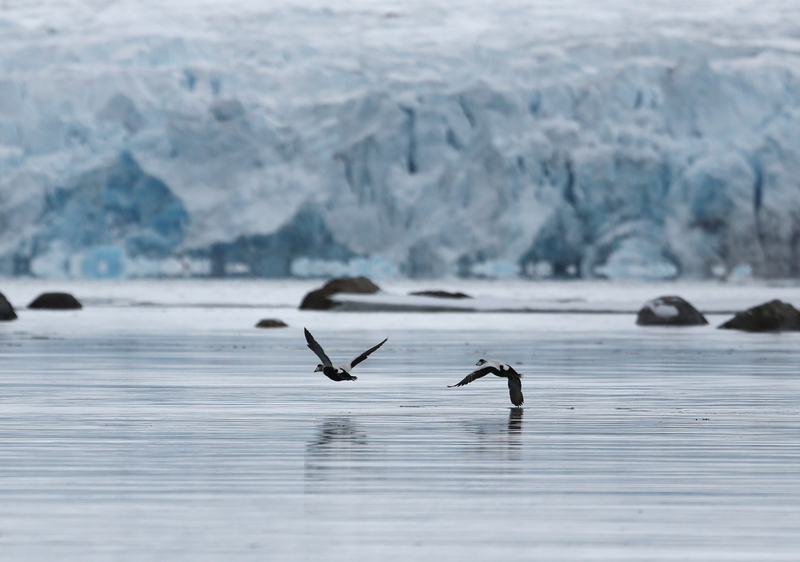 We followed them for a while, but as they continued to move away from us, we left them to their journey, and carried on further into the fjord. 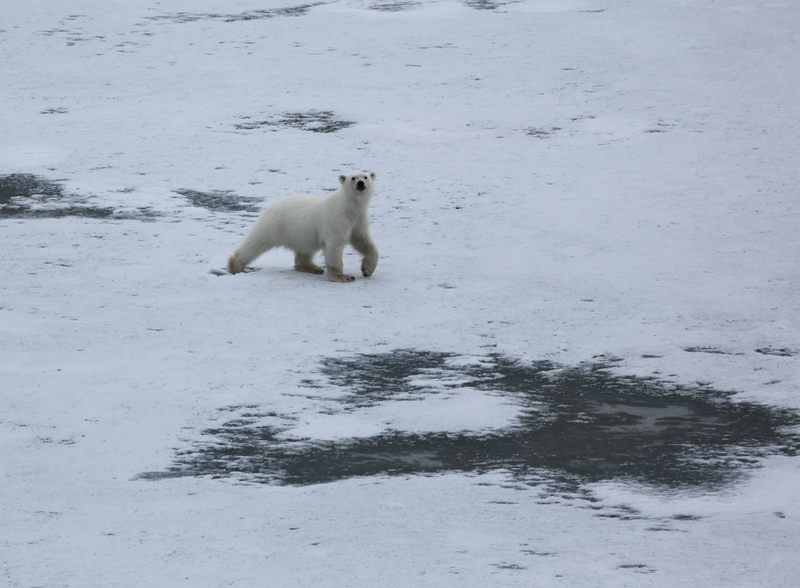 Then Katharine, our expedition musician, shouted out that she had spotted a Polar Bear on the ice at Lemeroyane! Our first bear! 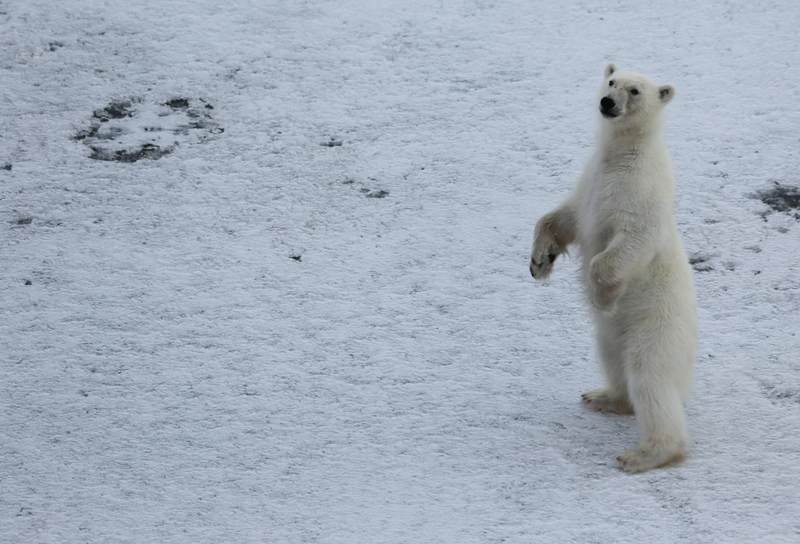 It was our fourth day, and we’d seen a polar bear! 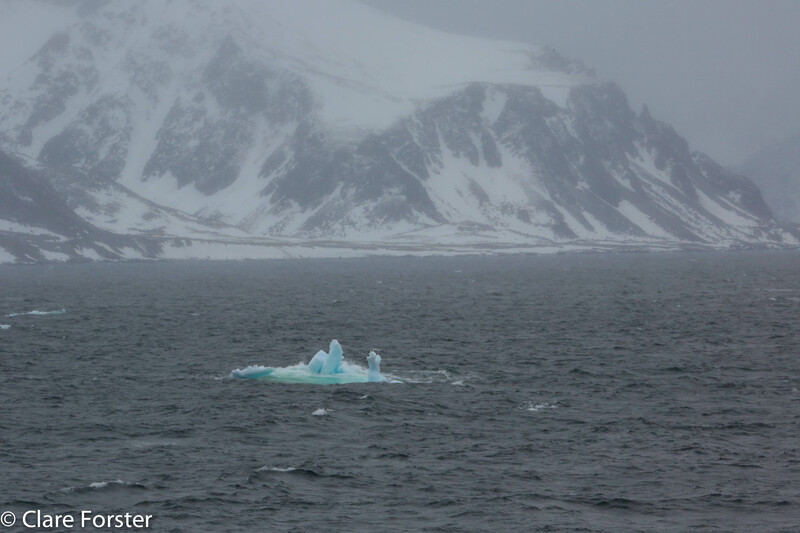 It was a long way off, and in an area that was incredibly hard for our captain to maneuver the boat, so although we watched him for a while, it was pretty hard to see him. 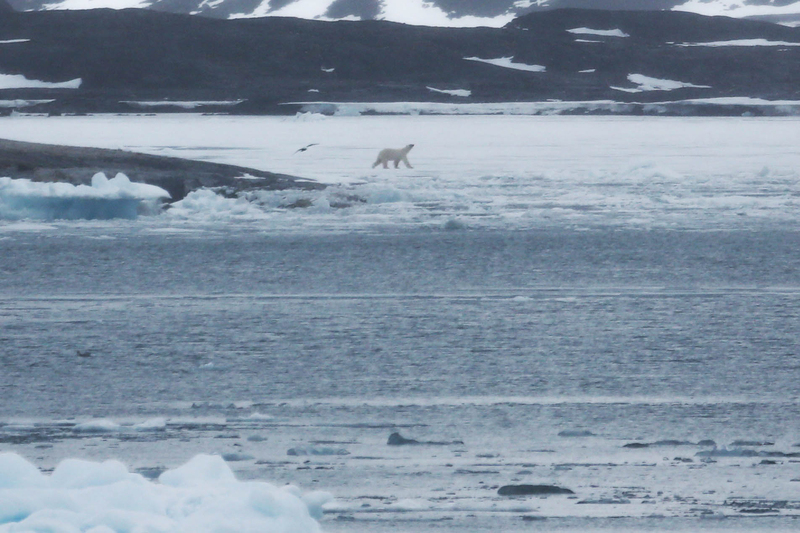 It was a very exciting time, but we decided to move on as the fog came right down, and it became increasingly hard to see the bear as he walked across the ice. We knew where he was, so could always return and scout the area again. 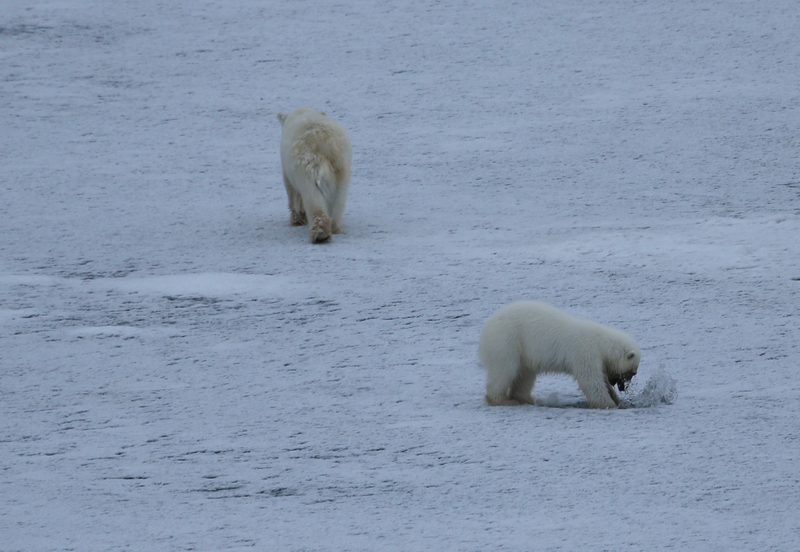 We continued down into the fjord, and came down to the Emmabreen glacier, where we spotted two polar bears – a mother and her young cub. It was very hard to be able to see if it was just a bear, or a bear and cub, but eventually through comparison of various photographs, we figure out there was indeed a cub present. So we were up to THREE bears, all on the same day! 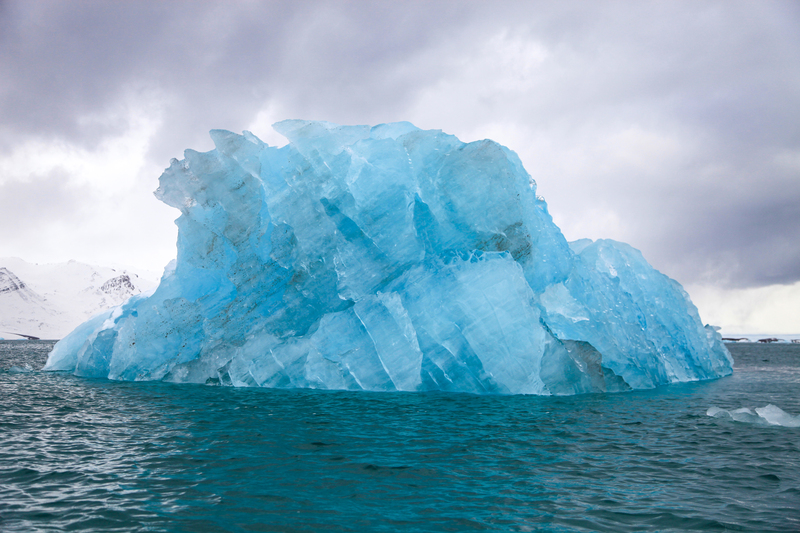 Next stop, was to head down to Vulkanhamna, where the ice was classified as 10/10 which basically is the thickest ice, and would need an ice breaker to move through it. 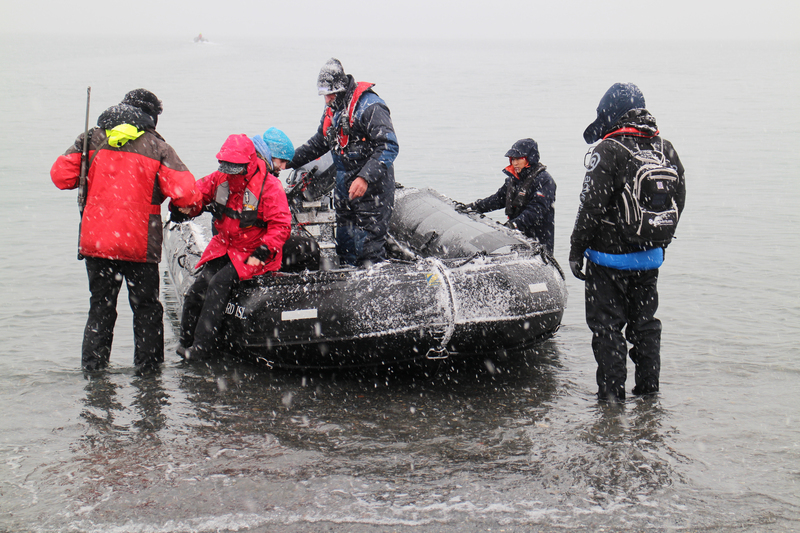 Our boat was only “ice strengthened” which means we could get out of trouble, but couldn’t break through large quantities of pack ice. 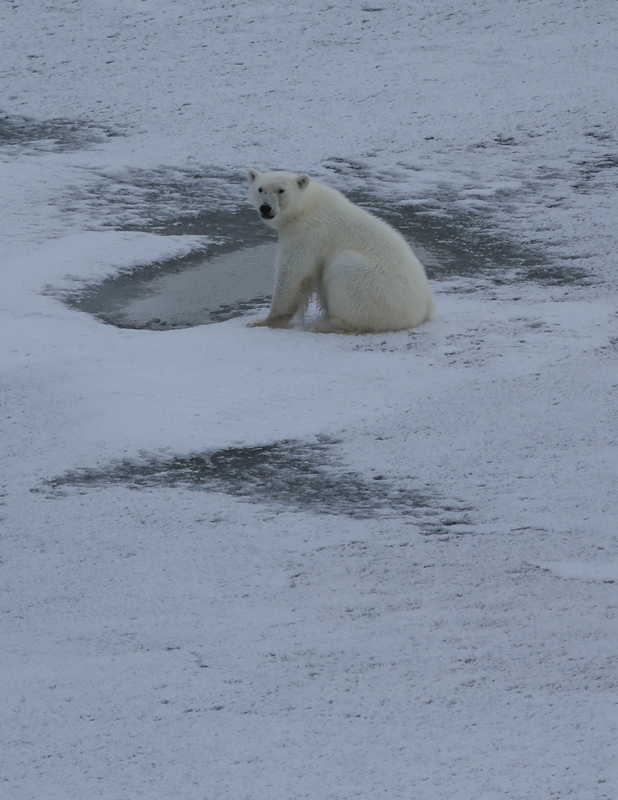 We came to rest a short distance into the ice at Vulkanhamna, as there had been ANOTHER bear spotted! 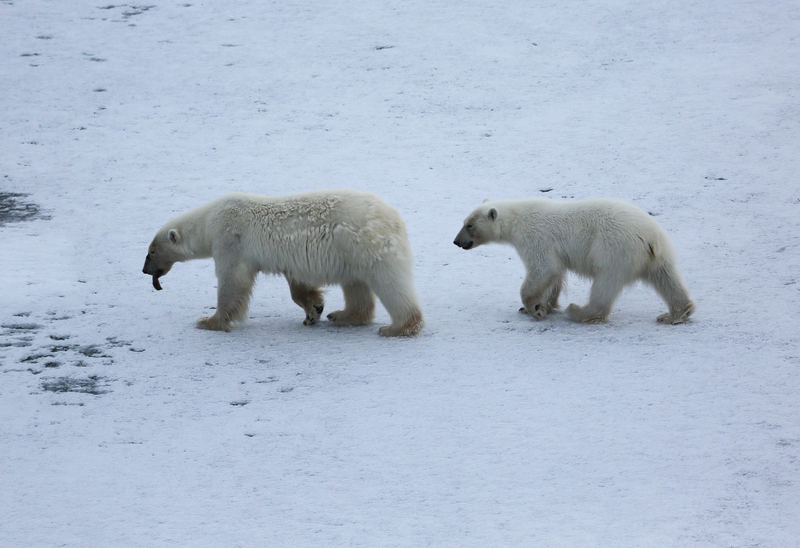 This time, it was a mother and her yearling, and she was hunting the seals who had pulled themselves out on the pack ice. We were all out on deck watching the hunt unfold, as the fog rolled down and it became almost impossible to make out the distant shapes of the mother and cub. 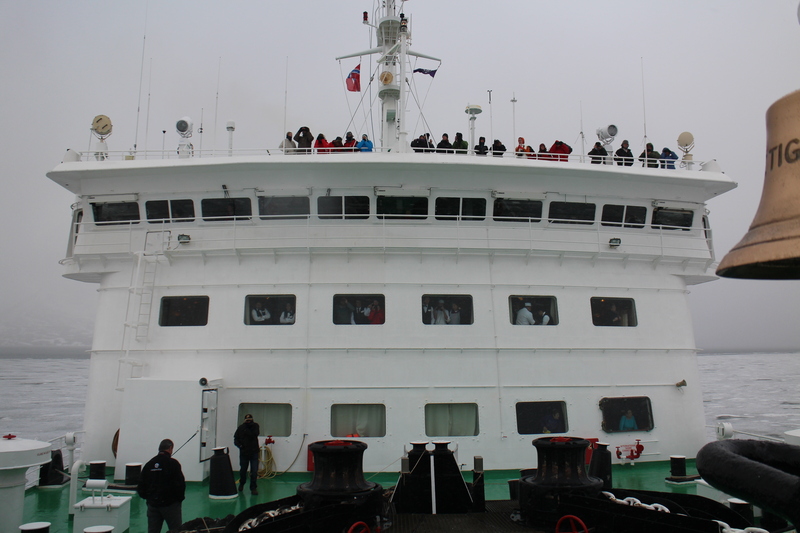 Everyone was trying to watch either from the main deck, the top deck, or even from the dining room! But we couldn’t see anything! So, we all went to have some dinner, as although it looks daylight in the photo, it was about 8pm by now! 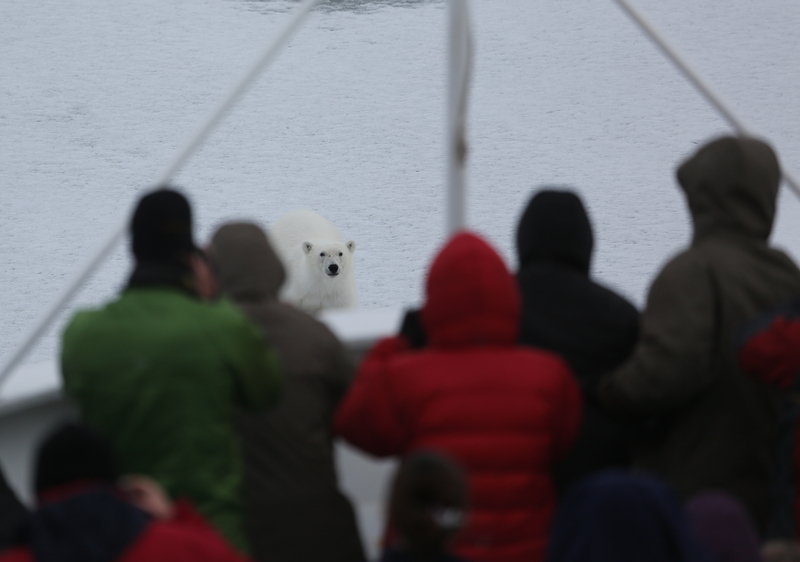 Needless to say, after dinner, everyone was straight back out on deck to see whether we could see the bears, and to see whether they had been successful with their hunt. 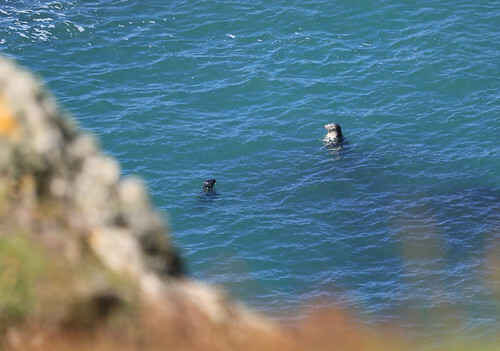 Sadly, they hadn’t managed to catch the seal (apparently the stats are that only about 1 in 20 hunts are successful). 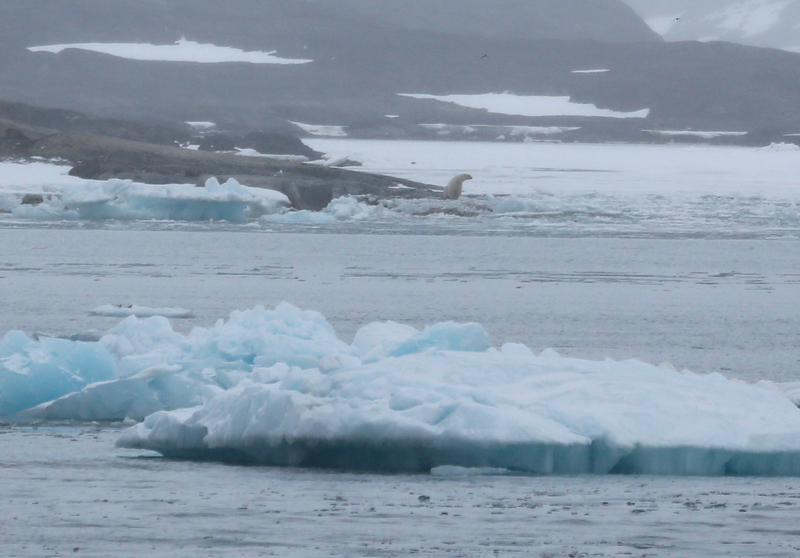 We watched them for a while, and then suddenly we noticed that the cub was obviously bored with waiting for the seal to appear, and had decided our boat was far more interesting. He was making his way slowly towards us. 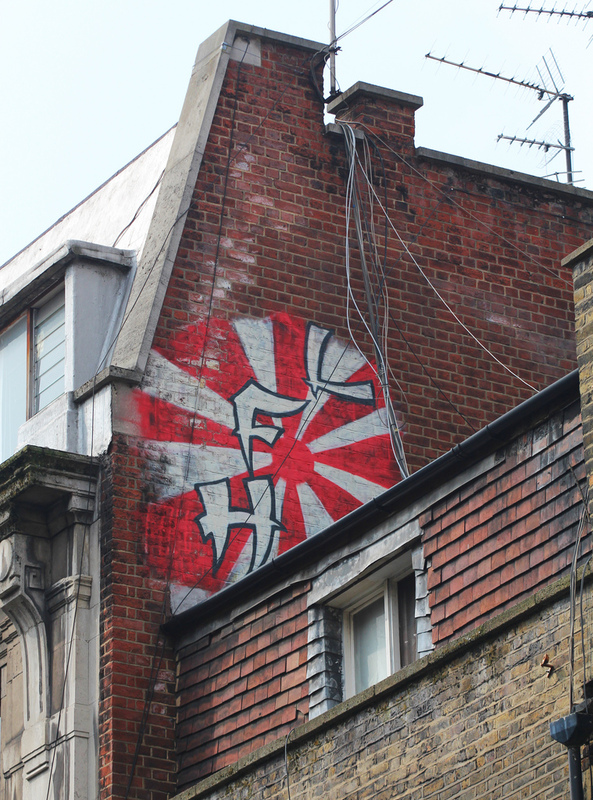 We had been instructed about sightings like this. 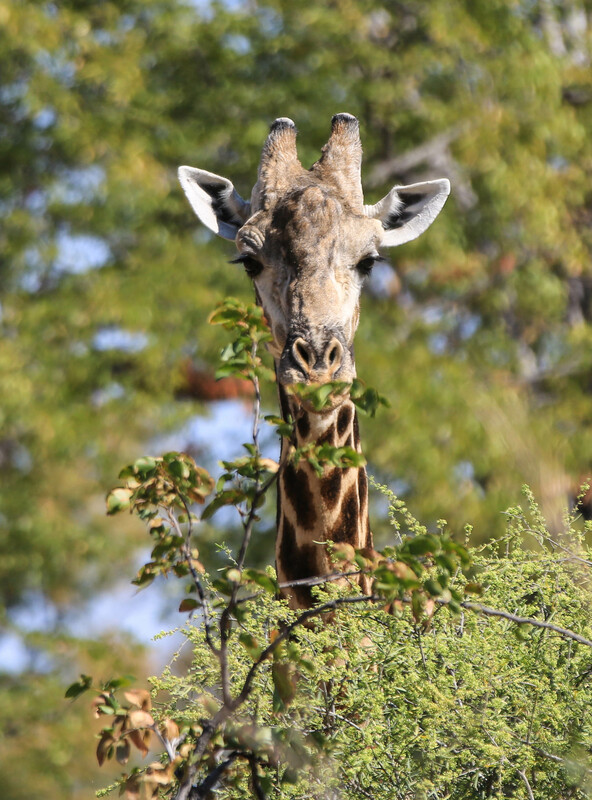 We had to remain calm, quiet and above all NOT make any sudden movements. 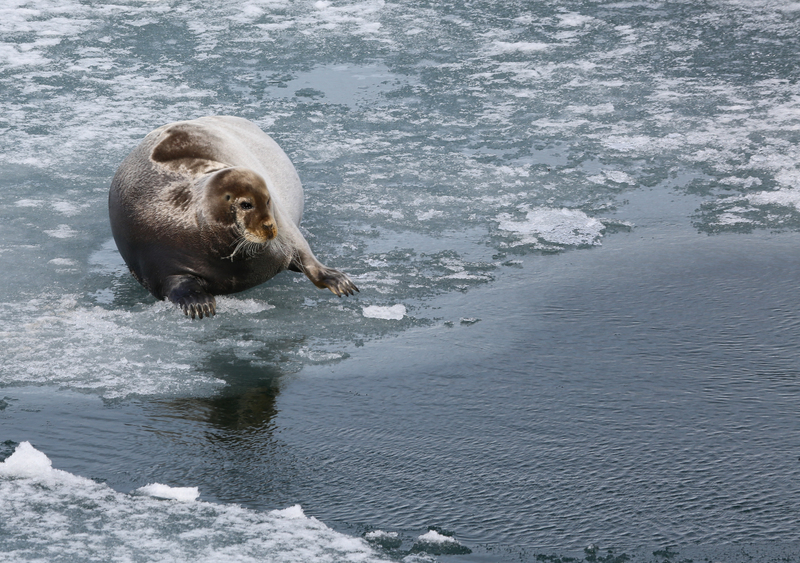 We all watched, not daring to breathe, as he made his way across the ice, getting closer and closer. This was AMAZING. 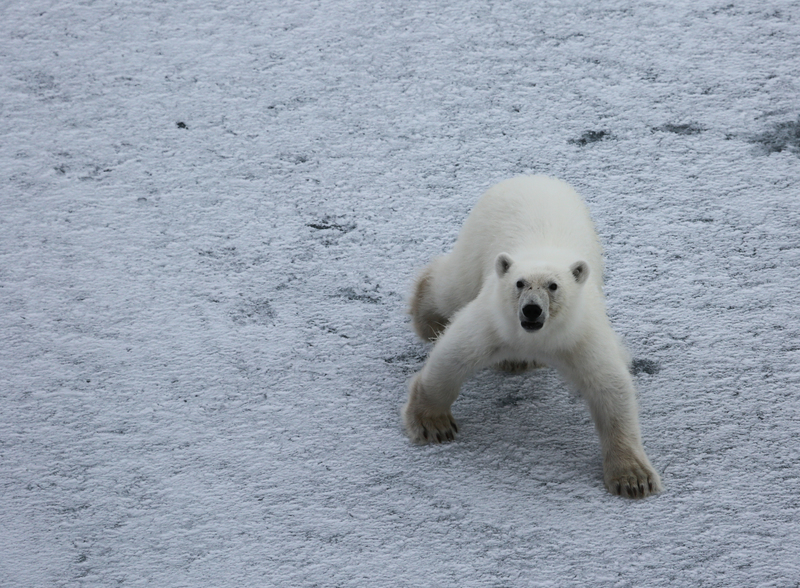 He just kept getting closer and closer, whilst we were all rather stunned! 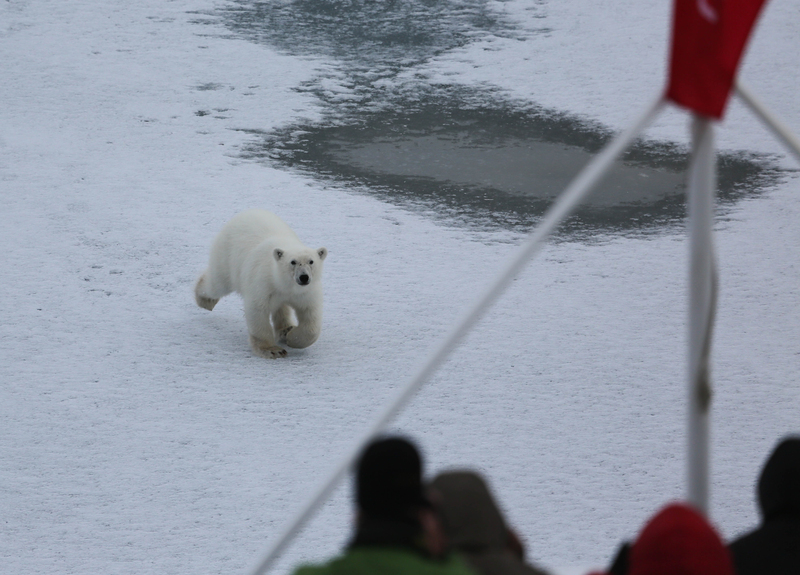 The expedition staff were going (silently) crazy as this was the best sighting most of them had had! As he got closer, his Mum followed him at a distance, happy that he should make his own way, but being close enough on hand to keep an eye on him! The view from the top deck was by this stage slightly obscured – so the photo below is courtesy of a fellow passenger Chris Westwood who was kind enough to share his photo of the trip with me! 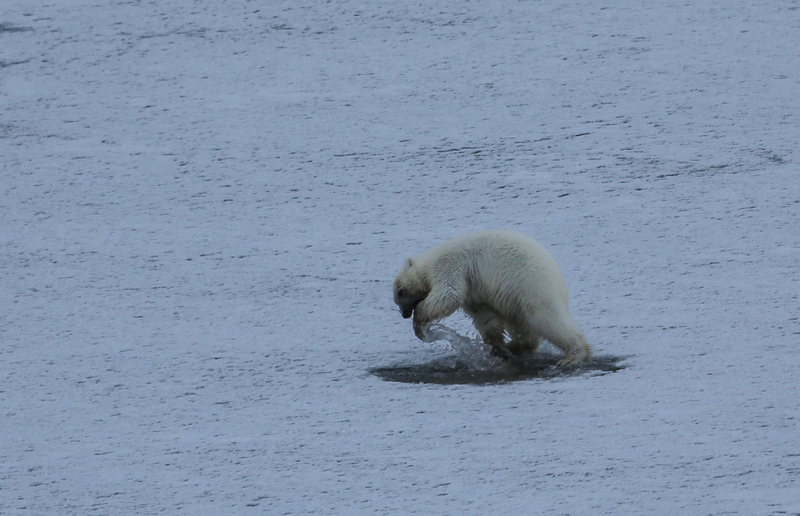 Then Mum called him away again, and this time was more successful at leading him a short distance away. There was a lovely moment where he sat down and looked back longingly at us. 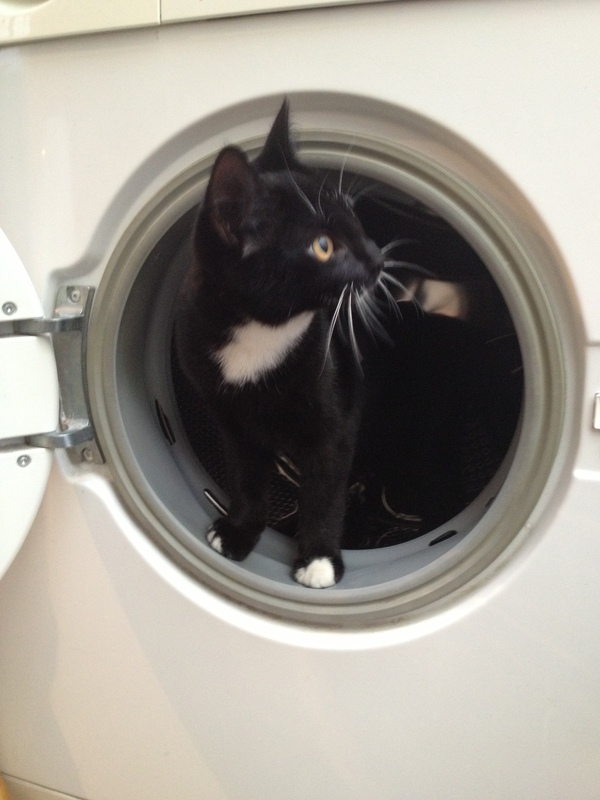 I wasn’t sure if he was thinking we were dinner, or just potential playmates! 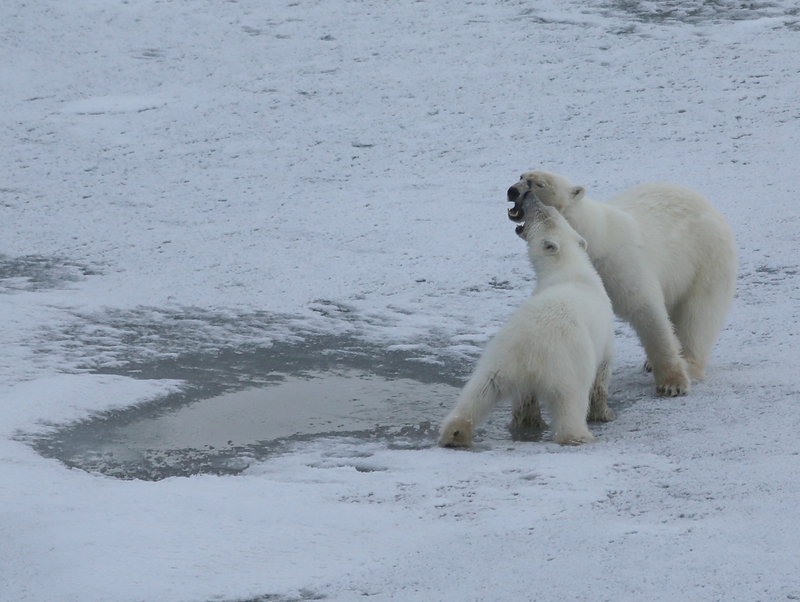 Then I took my favourite shot of the holiday – a wonderful moment of interaction between Mum and cub, where you can see their affection for each other, which will only really be present for another 6 months maximum before the cub heads off to lead his own independent life. As she led him away, it became clear just how much of a child this HUGE bear was – his behaviour was like any child who spots puddles … he just needed some wellington boots! 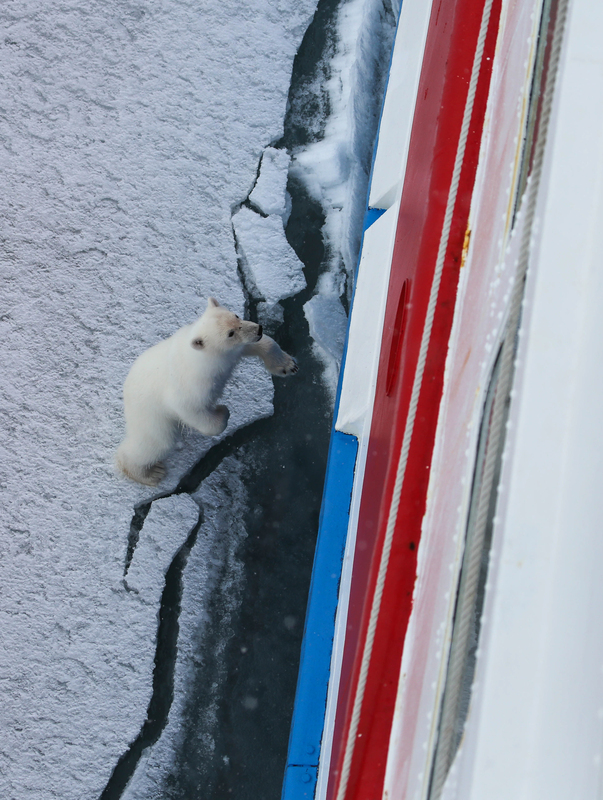 Once he’d stopped playing in the puddles, he followed his mum who walked around the boat to investigate where we’d broken through the ice. 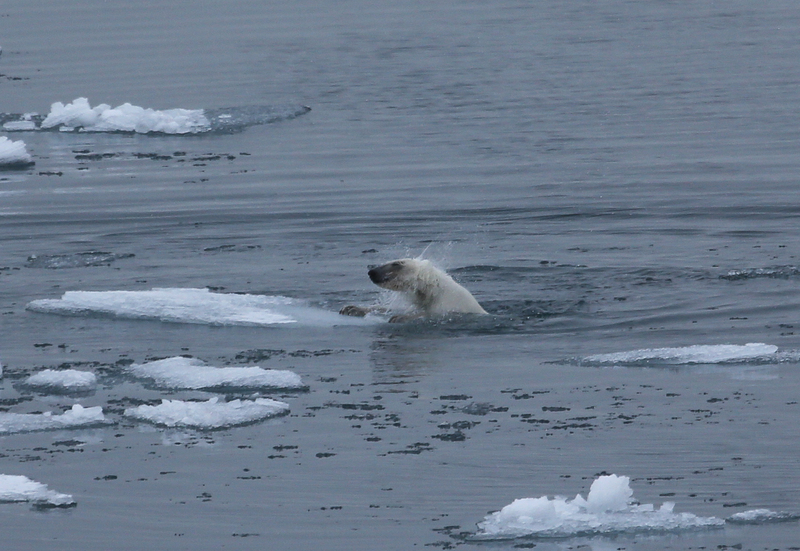 The cub used it as an excuse to jump in and have a swim! 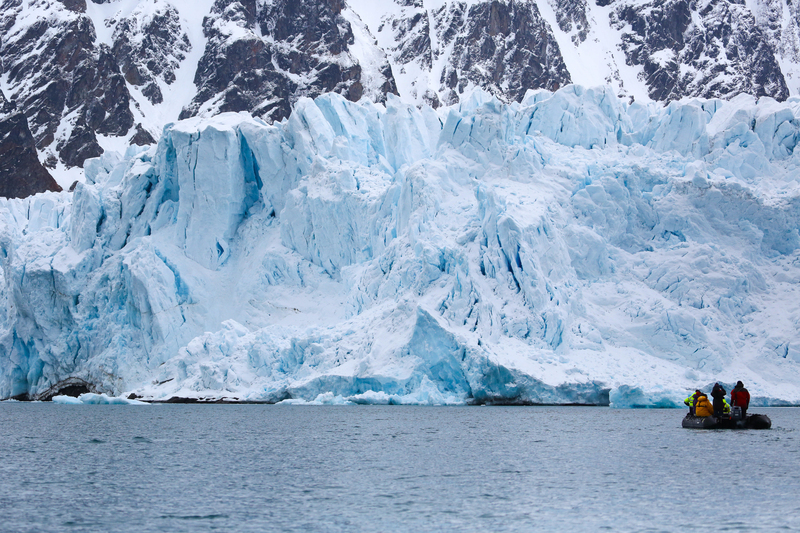 Eventually, they walked off up the ice edge and disappeared into the wilderness. We all retired to the bar to celebrate our incredible experience and stayed up far later than was wise which I blame partially to the fact that even at 2am, it is bright daylight! 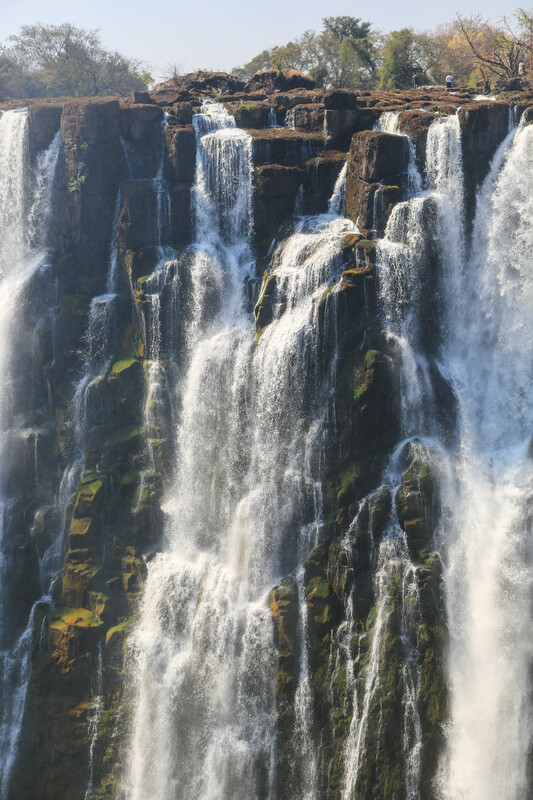 After that amazing experience, it was hard to imagine how the next day would top it. 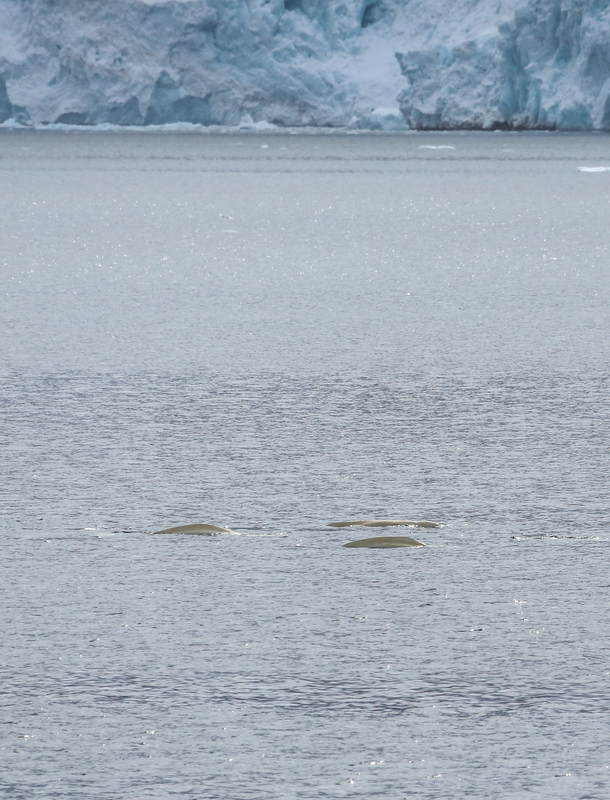 We had remained in the area overnight, and so we headed out to see Monacobreen up close in zodiacs, first passing the face of Emmabreen to see whether we could see the mother and cub from the previous day. Emmabreen was a particularly beautiful glacier, and the weather had cleared up considerably enabling us to see a lot more clearly compared to the day before. The water was calm and glassy, and Dr Tom was out scouting for bears! 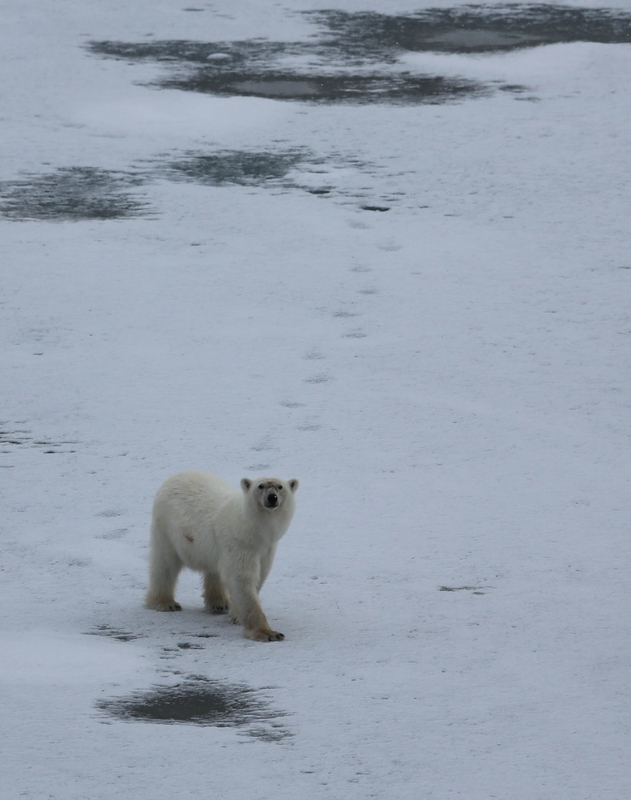 He found a lone bear on this area of ice – bringing our total sightings to SIX. 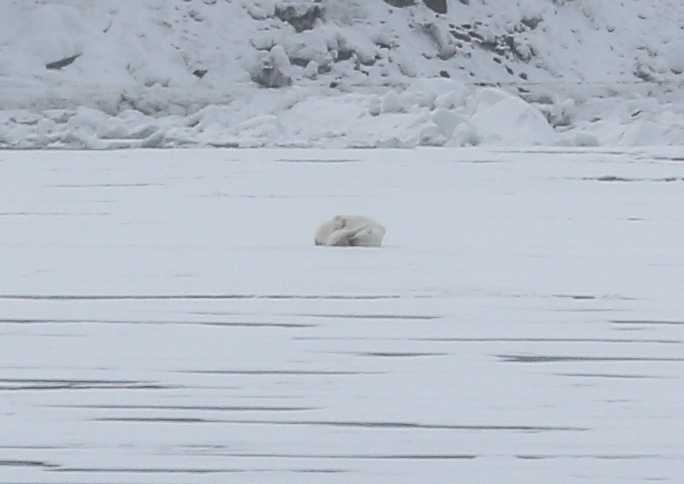 However, the bear was a long way off – so even if I pointed out where on this ice he was, you’d be unlikely to see him! 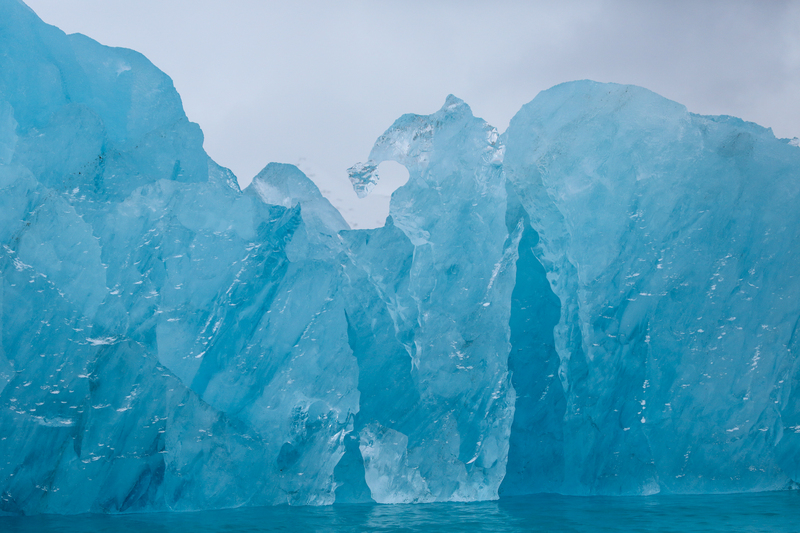 We then headed south and cruised along the Monacobreen – a stunning glacier that looks in places like a castle. 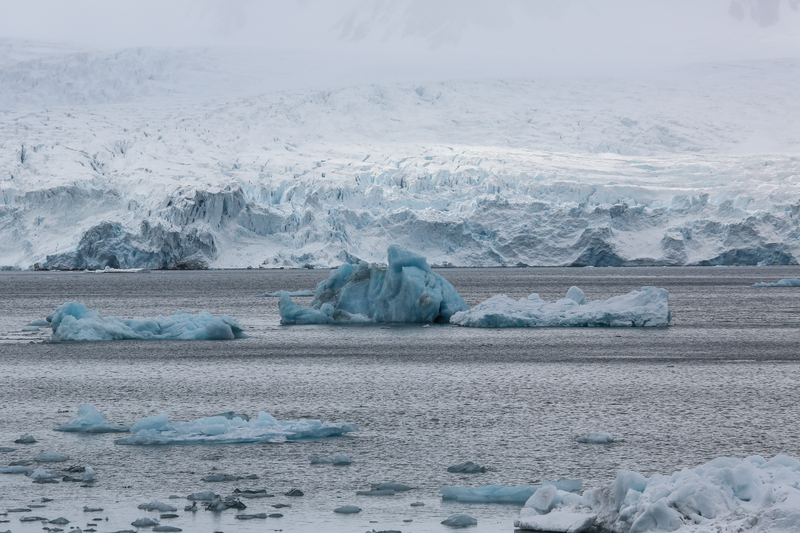 After getting up close and personal with some icebergs in the iceberg field in front of Monacobreen, it was time to move on, heading north up Woodfjorden. 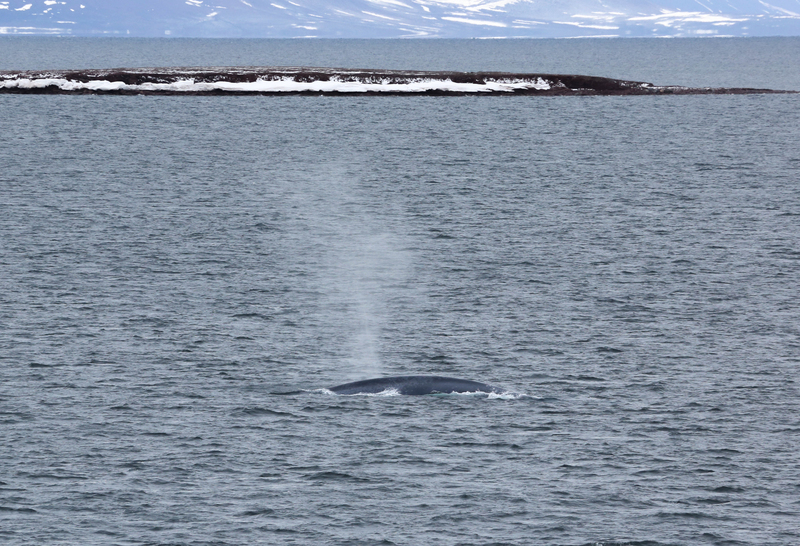 As we headed North, the expedition staff again became very excited, as there was a sighting of a blue whale! For those of you have have visited the Natural History Museum in London, you will be aware of the size (and rarity) of these mammals. 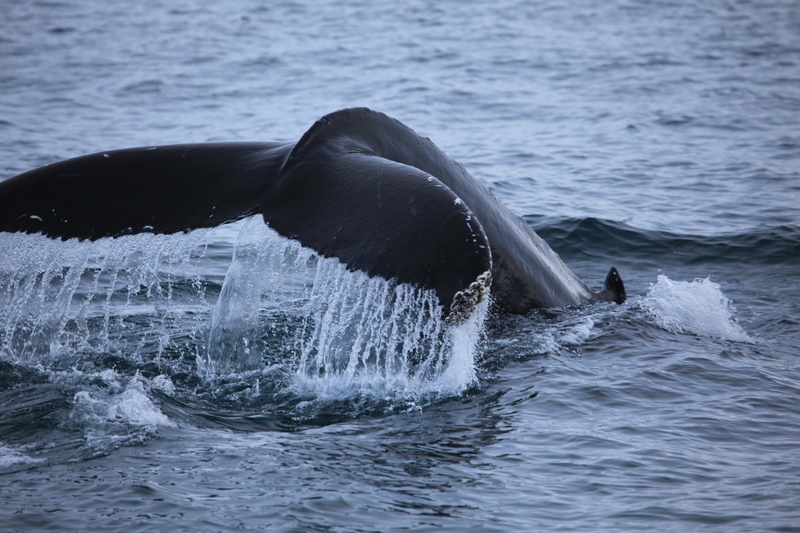 And here was one swimming in front of us! 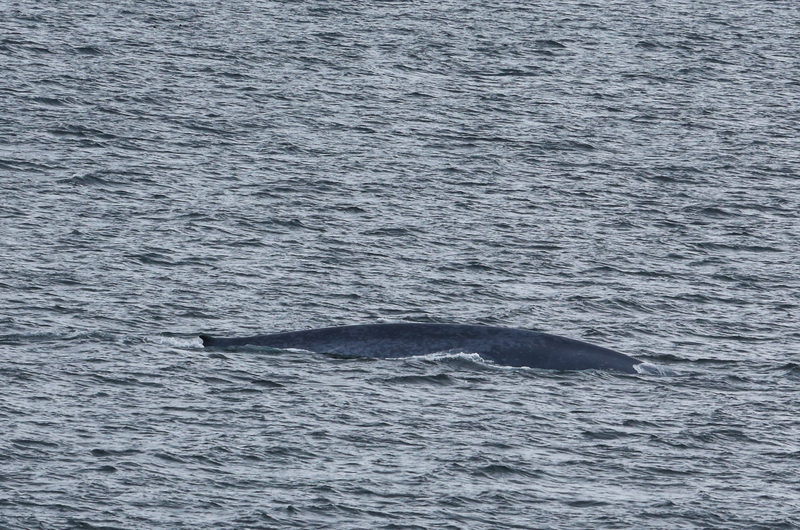 Along side the blue whale was a fin whale, and some minke nearby too. What a collection of whales! 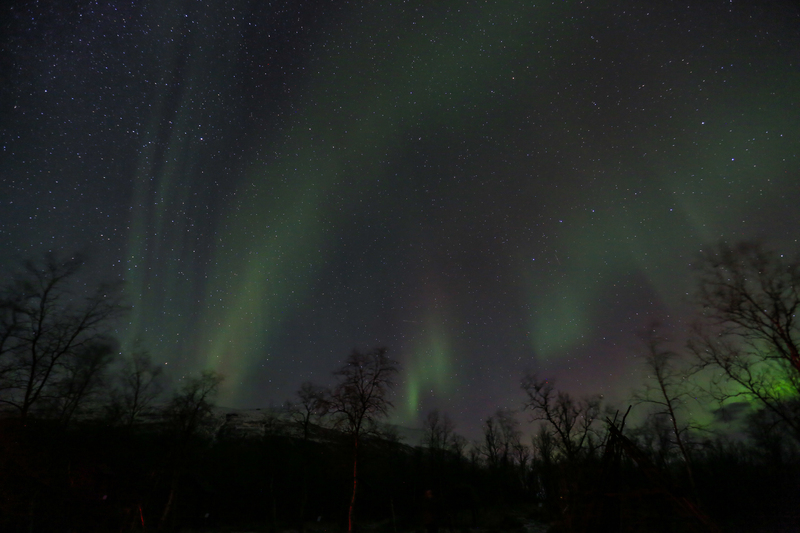 And a great way to end another day in the Arctic! 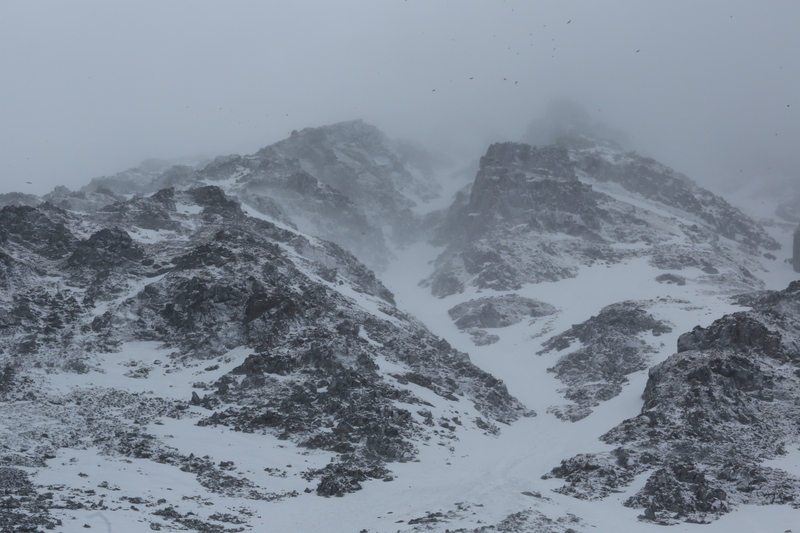 Next day, the weather had taken a turn for the worse again and we had fog and snow to contend with! 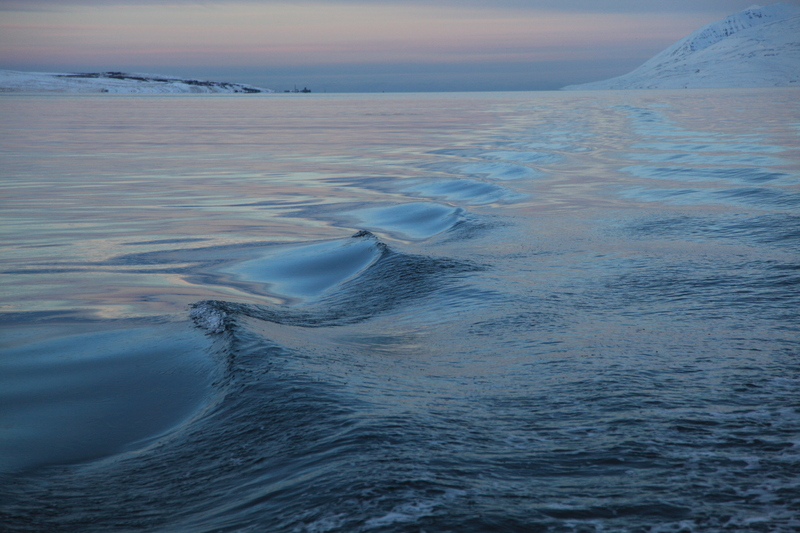 However, it didn’t stop us from cruising along between Hambirgbukta to Sjettebreen in the zodiacs. 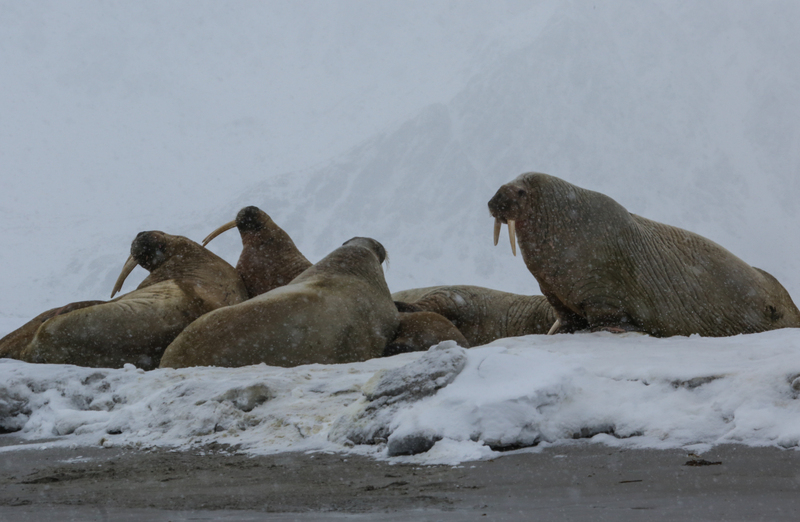 We passed more little auk colonies, and then found a small bay where 6 walrus had hauled out for a rest! There was also one in the water as well! 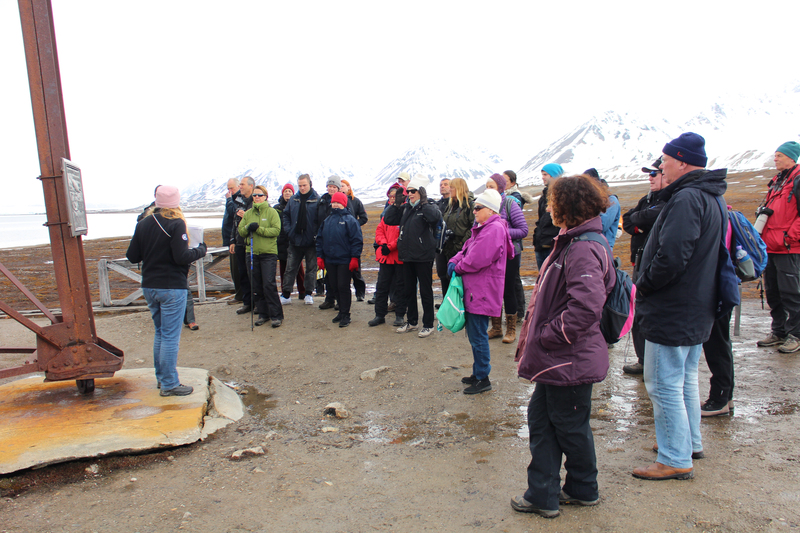 After that, we headed back to the boat, and cruised along to Ny London, where we landed in pretty miserable conditions, but were able to walk around and stretch our legs, whilst hearing of the history of the place when it was a marble mining town. 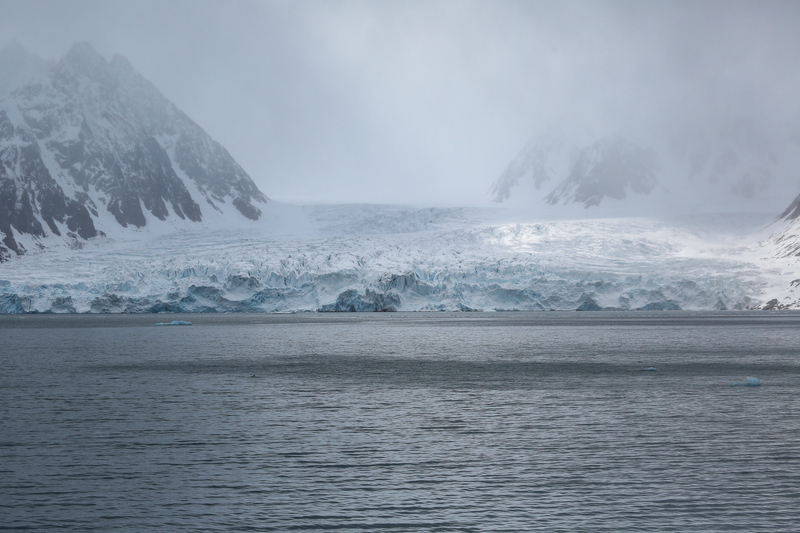 The next day was our penultimate day of exploring, and we headed further south to Ny Alesund in Kongsfjorden and had reasonable weather – a balmy 4 degrees! 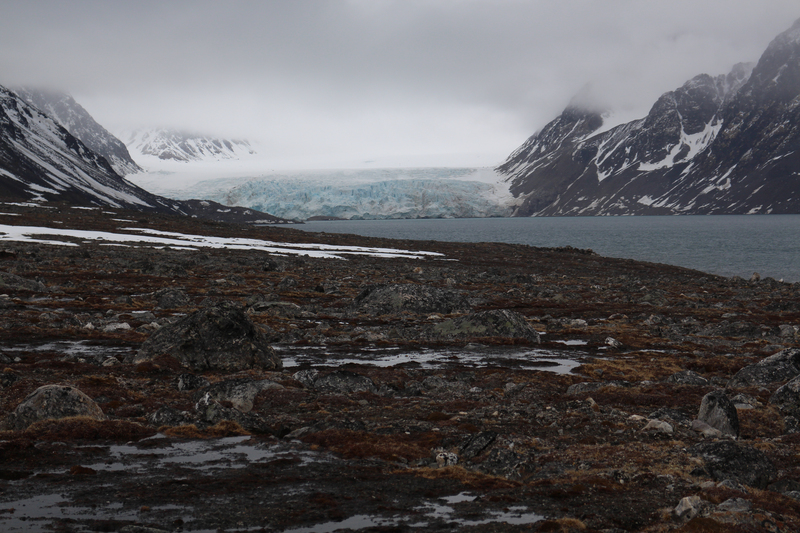 Ny Alesund is historically important as it was not only the location of Nobile’s airship attempt to fly over the pole, but it was also a coal mining settlement and still has polar research facilities. From Ny Alesund, we were able to send postcards from the “Most Northerly Post Office” in the world, and get a stamp in our passport! 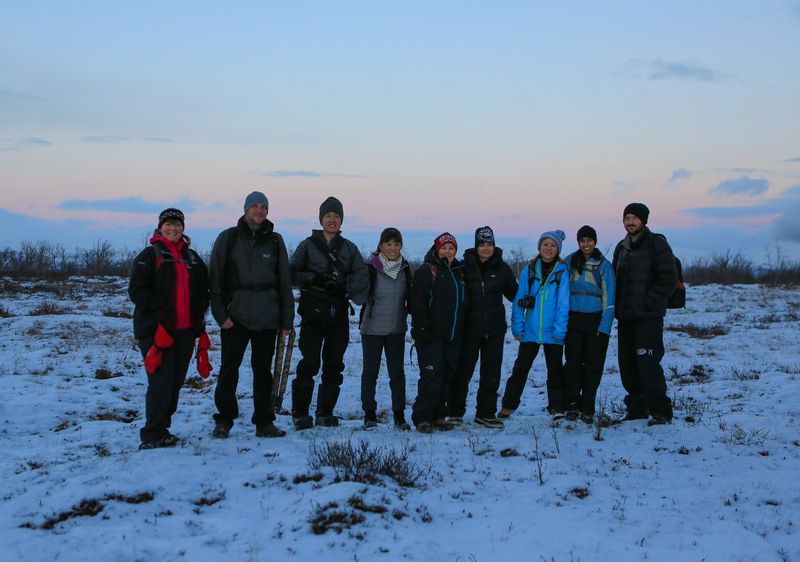 After we left the town, we headed off to Regnardneset to go for a walk along the tundra, which again allowed us to stretch our legs, and attempt to find our shore legs after 7 days on a boat! 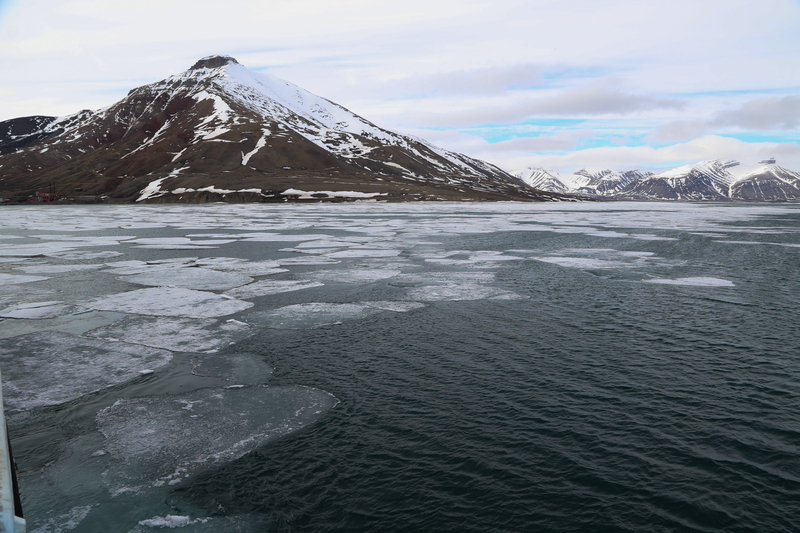 As we headed off from this position, to start our return journey to Longyearbyen, it was clear that the ice situation was only getting worse, and we had a few issues exiting the fjord. 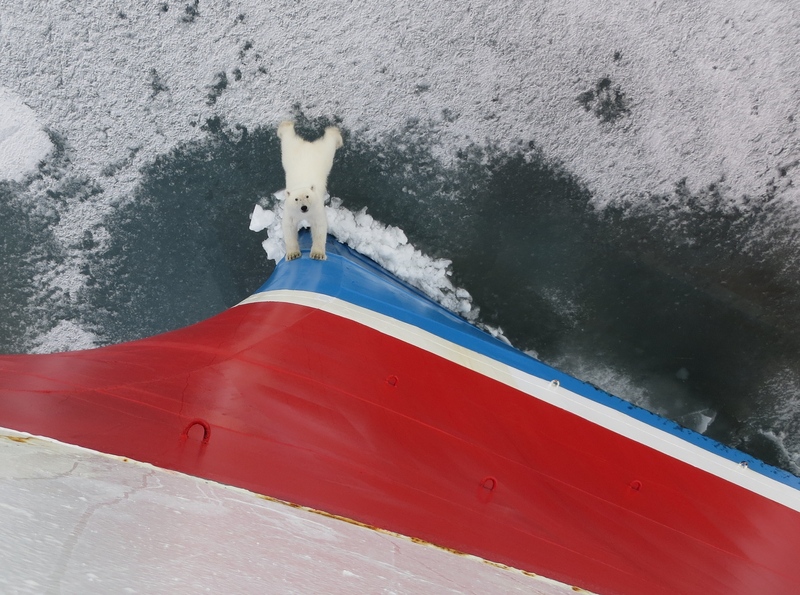 Luckily for us, our captain was an Ice Master, and he really proved himself getting us out through the pack ice, even if it took him several hours to achieve that! That night, our last night on board, we again got caught out by the forever daylight and found ourselves in the bar way beyond 2am. 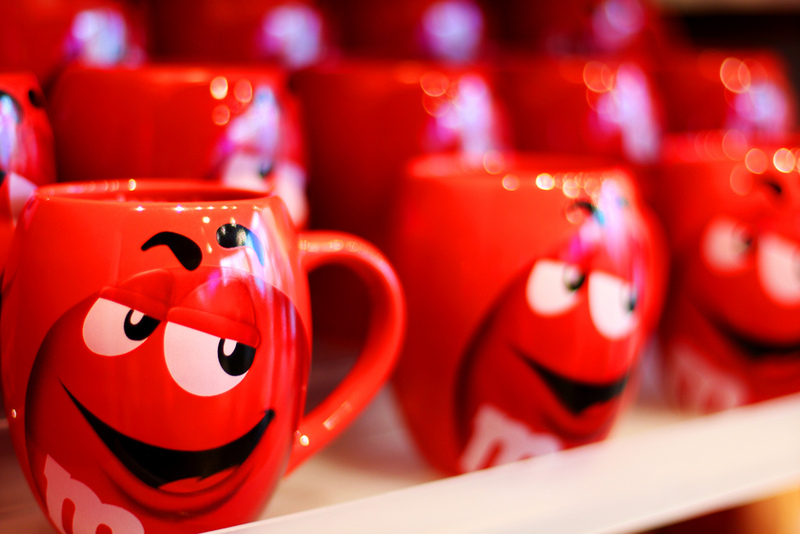 However – you’d never know it! Hope you have enjoyed this post. 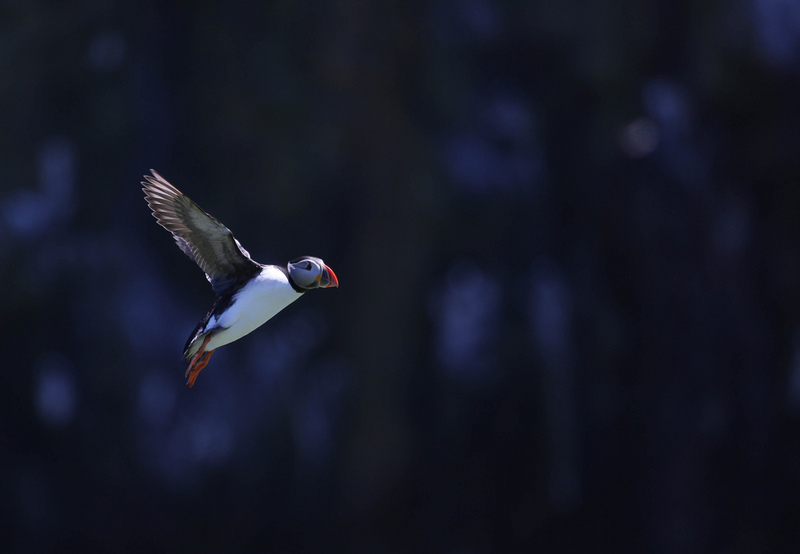 This weekend saw me on a long awaited trip to Skomer Island to find some puffins. 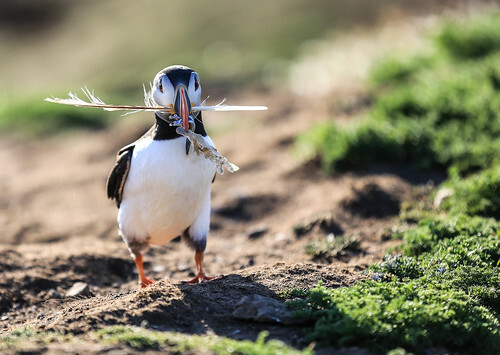 I had been lucky enough to see puffins a couple of years ago on Farne Island, so I was excited to see them again somewhere new. We drove down to Pembrokeshire for the long weekend, just hoping that the long range forecast of rain did not ruin our trip. We arrived to a beautifully sunny evening and went exploring in the last of the sunlight. 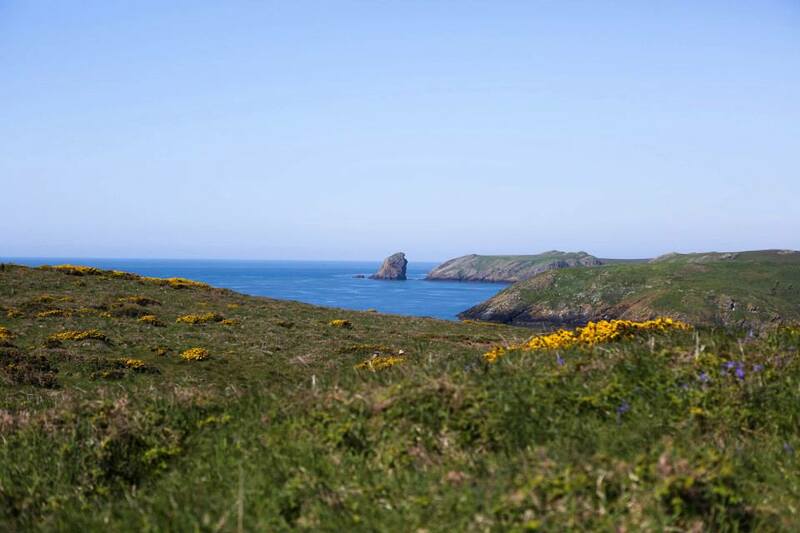 Pembrokeshire is beautiful and I’d love to explore the coastline more sometime. The next morning, we arrived at the time the ticket office opened, to find a long winding queue of people already there. 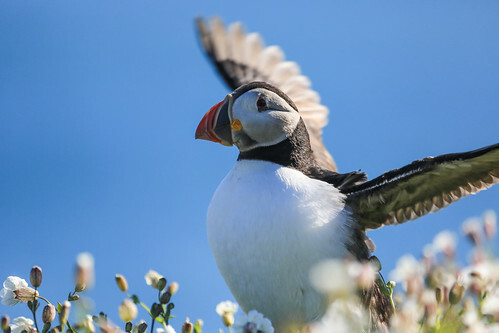 Unlike Farne Islands, where you can pre book your boat tickets, at Skomer you have to buy your landing pass at the ticket office (£10 per adult) then pay for the boat once on board (£11 per adult). I was rather gobsmacked to see someone paying the boatman with a card … so if you are reading this with a thought to go yourself – go armed with cash! Please! 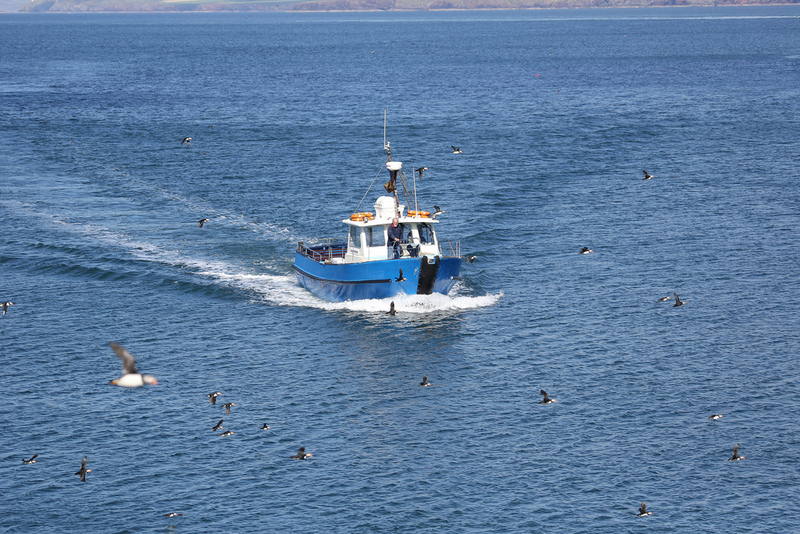 You’re on a boat … they don’t carry card machines around with them! 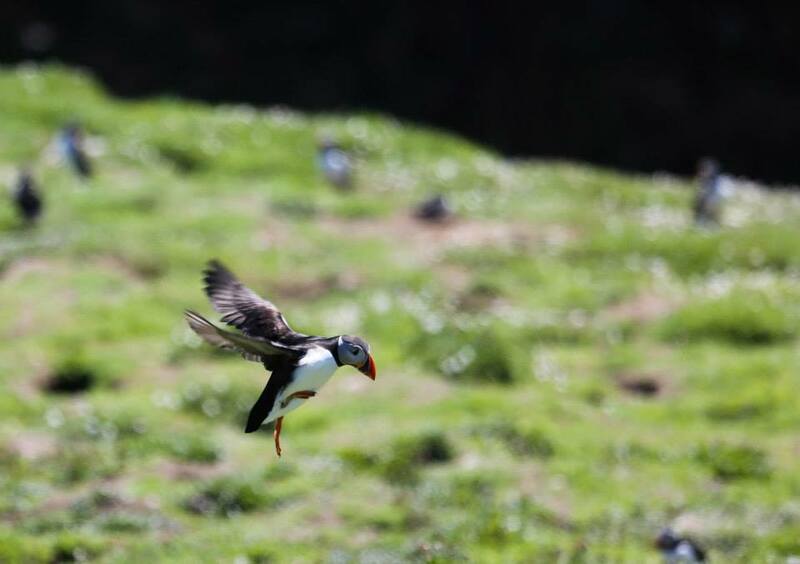 We arrived on the Island after a short 10 mins boat trip, and before we even got off the boat, we were surrounded by puffins, taking off and landing in the sea all around us. 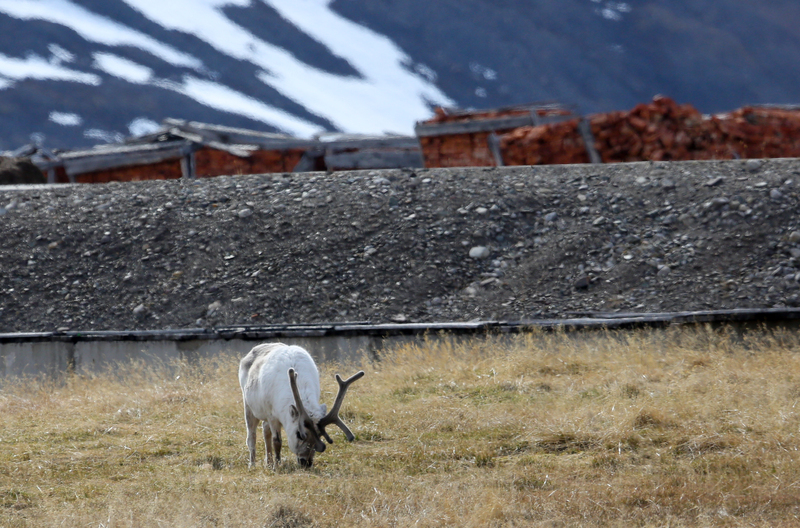 They were on the cliffs as we climbed up to the welcome centre, and appeared out of their burrows all around us. The welcome from the volunteers was great – there was a big map showing all the best bird spotting areas, as well as where the facilities were etc. Then off we went. 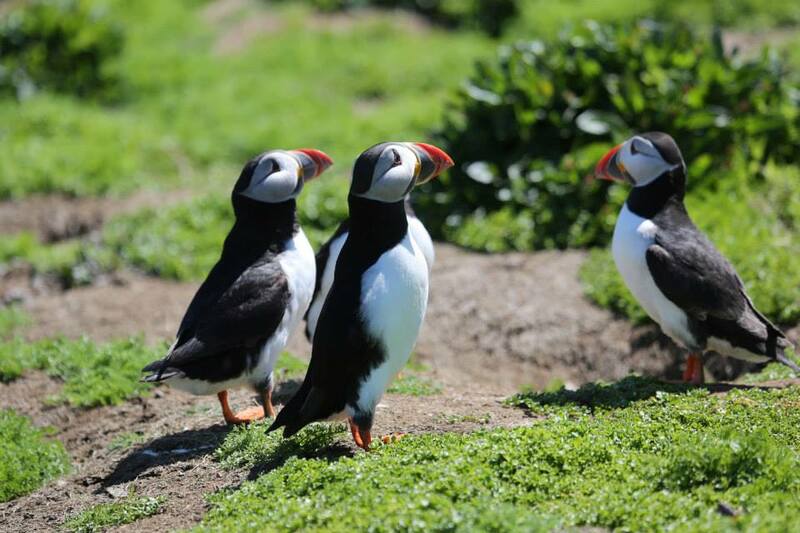 We had about 5 hours at our leisure on the island … so we headed straight for where the puffins were reported to be! If you have never seen a puffin before, I would imagine that the picture you have in your head is of a bird about the size of a penguin. Well, imagine a much smaller bird! 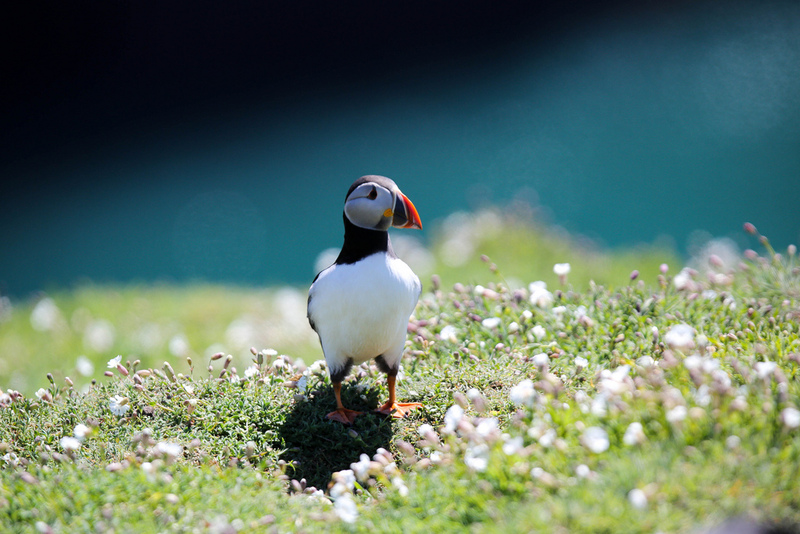 Puffins stand somewhere between about 20 and 30cm tall. 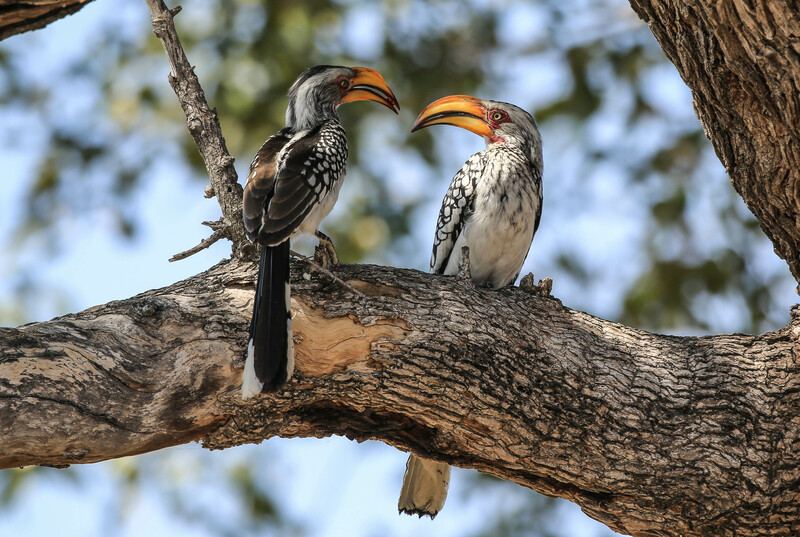 Their beaks are beautifully bright with red, orange and black stripes. 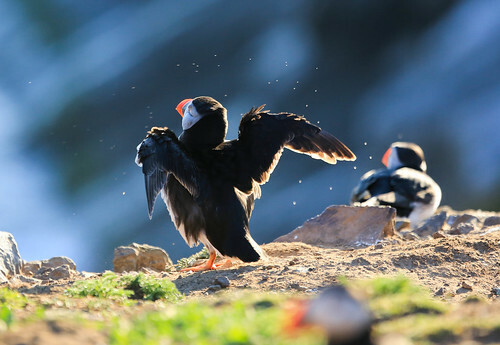 At the moment, it is mating season, so there is a lot of head tossing going on – where they stand tall, and quick toss their beaks into the air. They make a very specific noise – which is hard to explain, but sounds a bit like they are saying “Ohhh-hhhh-hhh”. 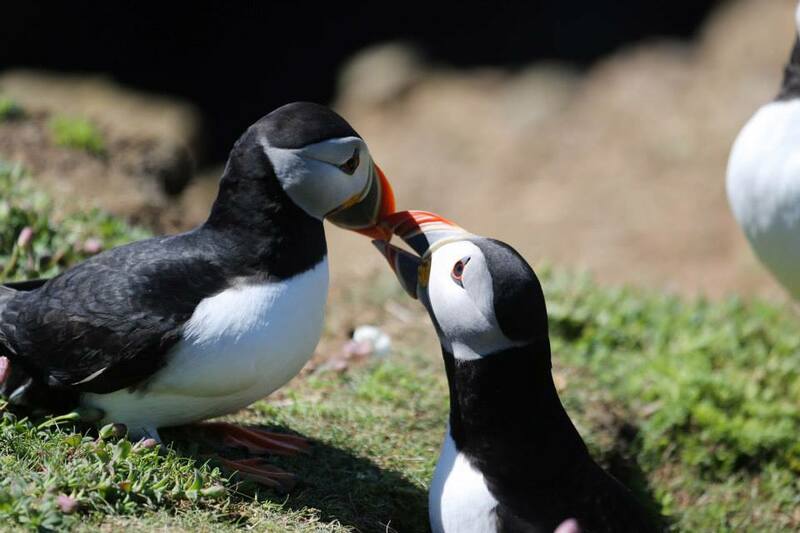 Find a bird app online that has the mating call of a puffin! It’s brilliant. 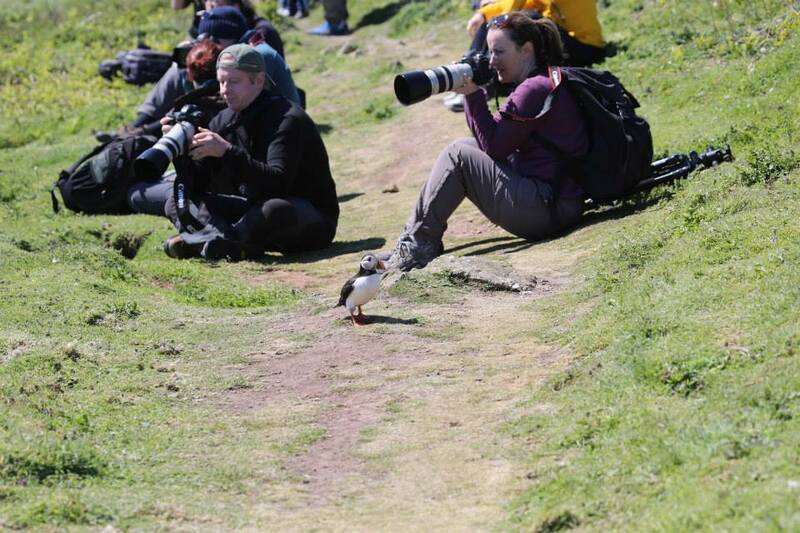 They really are the most photogenic birds, with really comical behaviour – it appears they like to walk up and down in front of the photographers, posing! Or maybe they are just wondering if there is any food to be had! 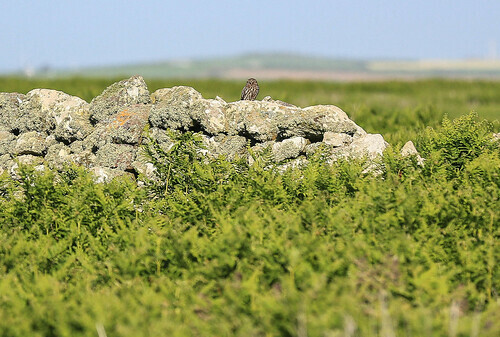 They are currently nest building so we saw a lot of birds gathering suitable materials to line their nests so that once their single egg is laid,they have somewhere warm and comfy to incubate it. 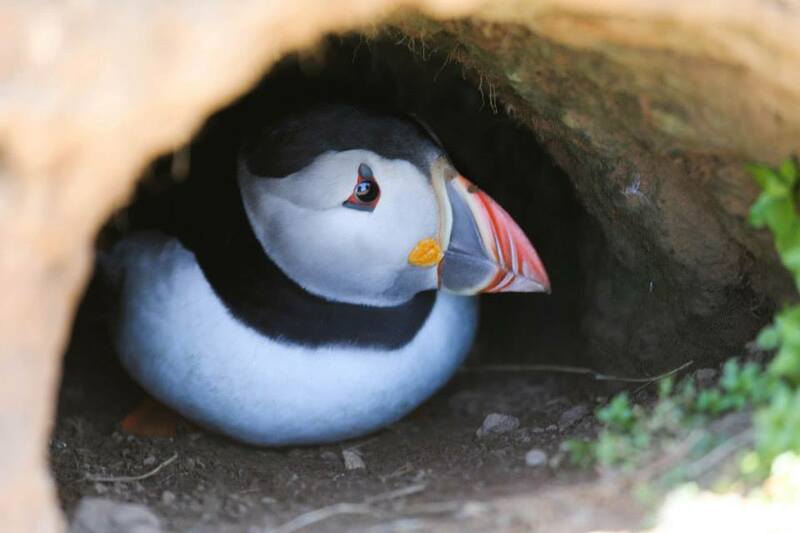 Sometimes the burrows are old rabbit warrens, otherwise the puffins use their feet to dig out new burrows in the soft earth. 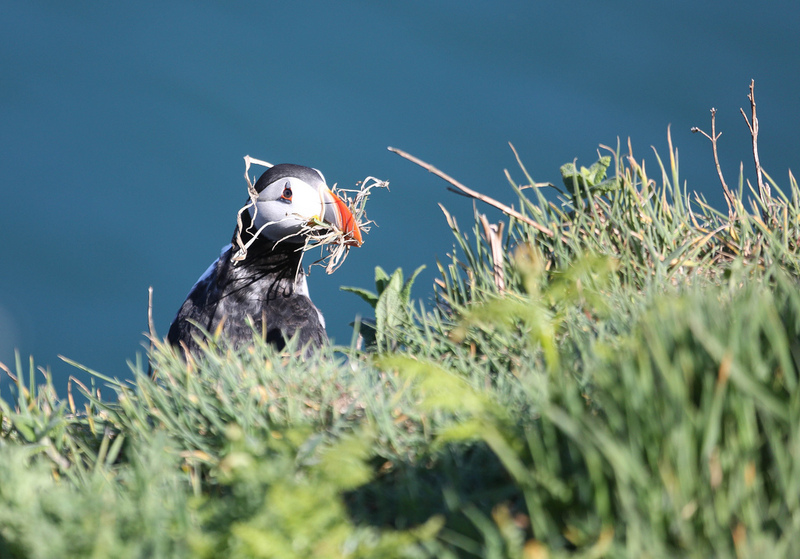 Because they are not yet rearing their young, it is too early to see them flying in with several sand eels hanging out either side of their beaks, which I was lucky enough to see in Farne (I was there later – around middle / end June). 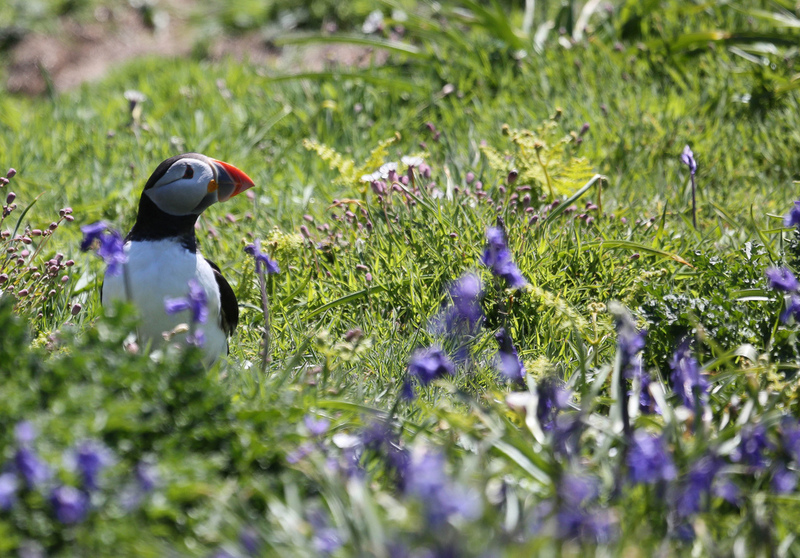 However, the advantage of the trip this early, was that due to the late arrival of the bluebells this year, we saw puffins in bluebells which is incredibly rare. There were so many puffins flying around, I had plenty of time to practice getting birds in fllght – which proved tricky at times, but I didn’t mind spending time just relaxing in the sun watching the puffins all around me, and taking lots of photos to practice my birds in flight (BIF for those photographers amongst you). 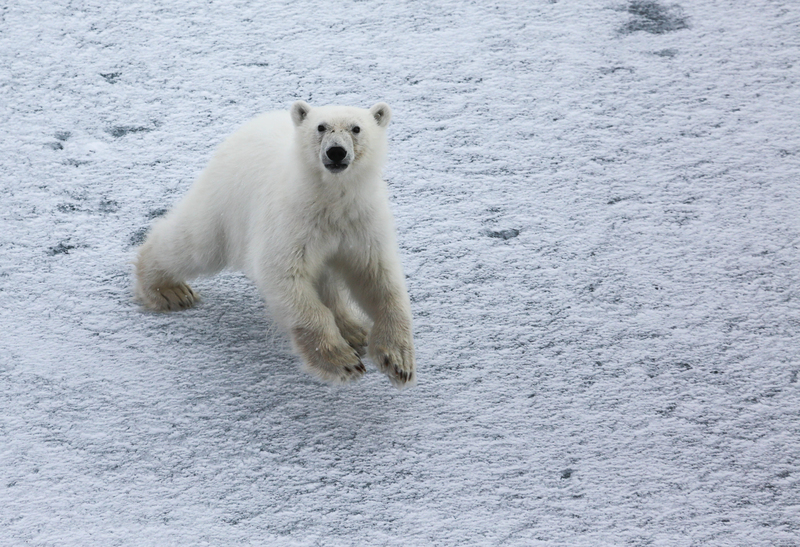 This is one of my favourites – it looksl as though he is about to jump a hurdle! 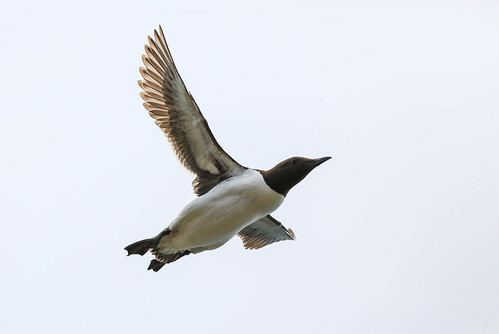 Also not forgetting the guillemots, swallows, buzzards, and gulls of all varieties! 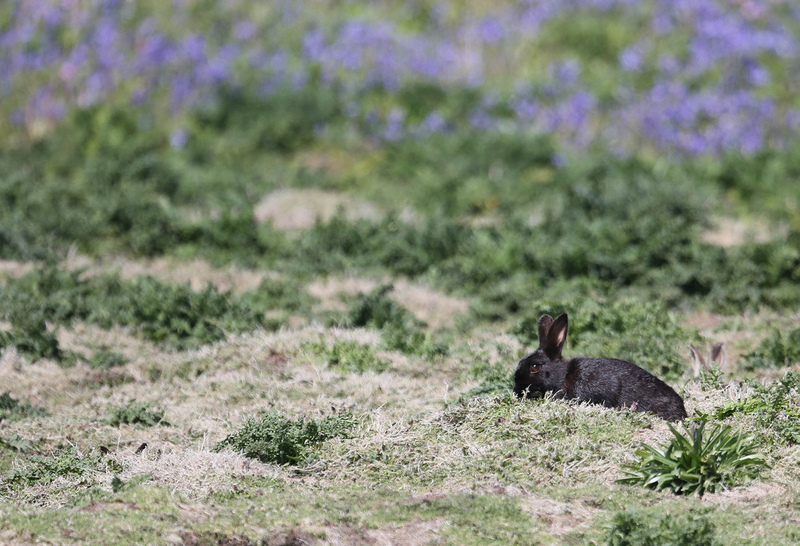 There are also some beautiful bunnies to be seen too! 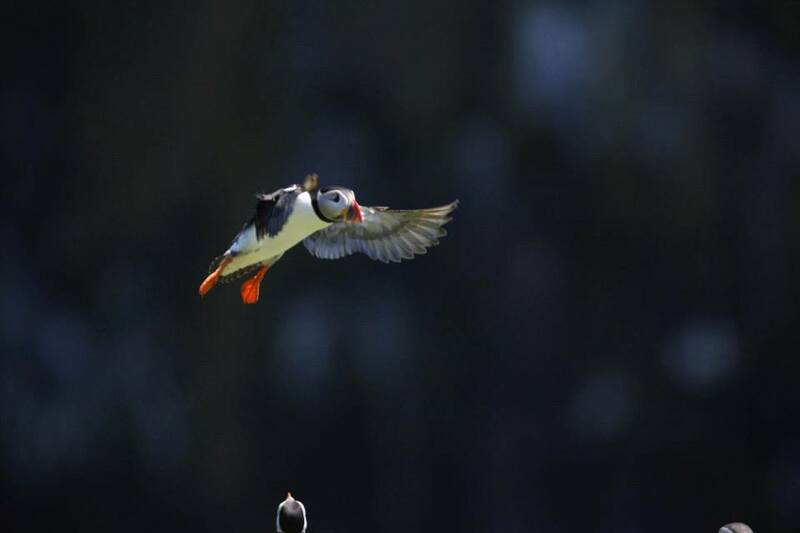 It has to be said, there is plenty to see on the island in terms of birds and wildlife, and we were very lucky seeing the short eared owls, but the main attraction was definitely the puffins. 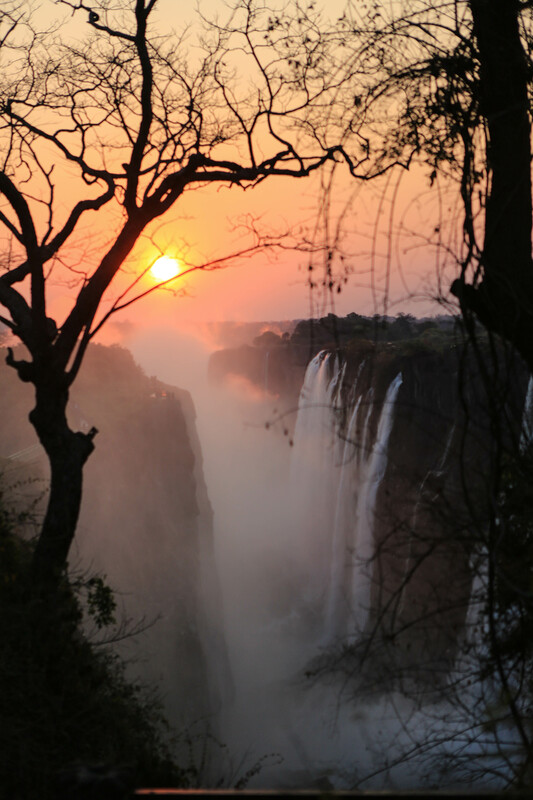 So I will leave my post with one more photo … I hope you have enjoyed reading this post, and perhaps it will inspire you to get out and explore! About six weeks ago, I bought the Canon EOS-M in a wonderful bundle that included both 22mm and 18-55mm lenses, and the little flash. I also opted to buy the adapter ring, so that I could try out my other Canon lenses as well. 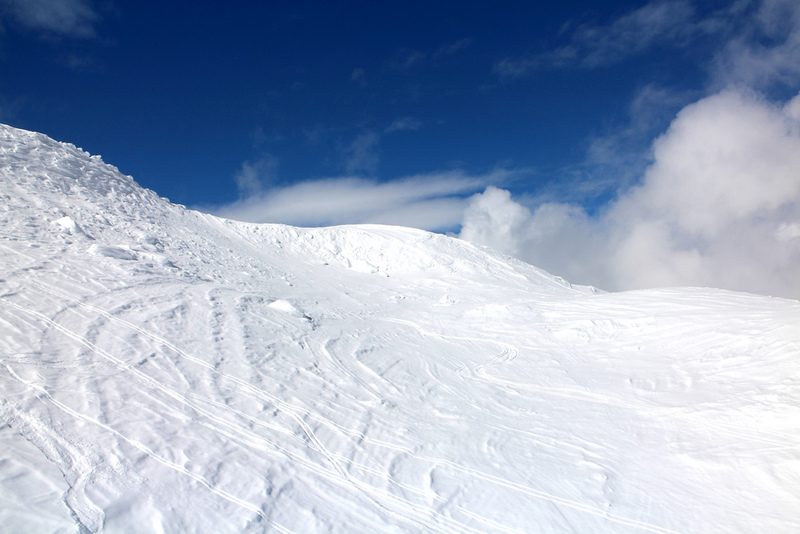 It arrived in time for my annual holiday to the snow, and so I decided I’d put it through its paces on the slopes, and see how it fared. I had read quite a few reviews before investing, but mostly they were based on the pre-release model, and I couldn’t find much written after about October last year. So, I knew that most of the reviews felt the focusing was prone to slowness. I also knew there were some new features like the touch screen. 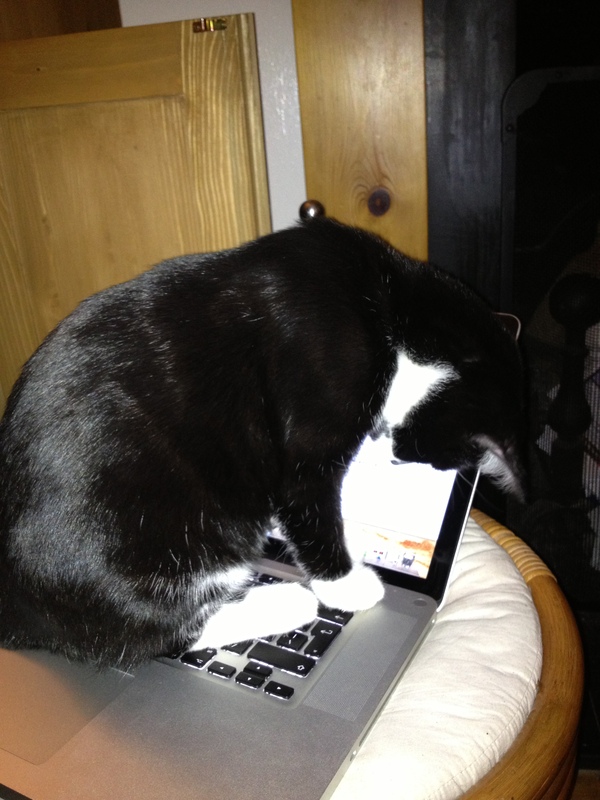 But I really needed to try it out and see how I got on with it. I took some lovely stills of the mountains. As with all cameras that have given up the viewfinder space in favour of a larger screen, it was hard sometimes to see exactly what shots I was capturing. That was a little frustrating. But the photos came out well in general. I also used the camera indoors in the evenings. That’s where it’s not so performant, as all the reviews indicated. Even with auto ISO and the aperture as wide as possible, it was only “acceptable” when used with decent lighting, and then got very blurry when used in less than ideal lighting. The flash helped somewhat, although being so small, I will need to figure out what settings will give the best results, as initial findings are that it was a bit over bright. I guess that’s a shortcoming that I will live with. 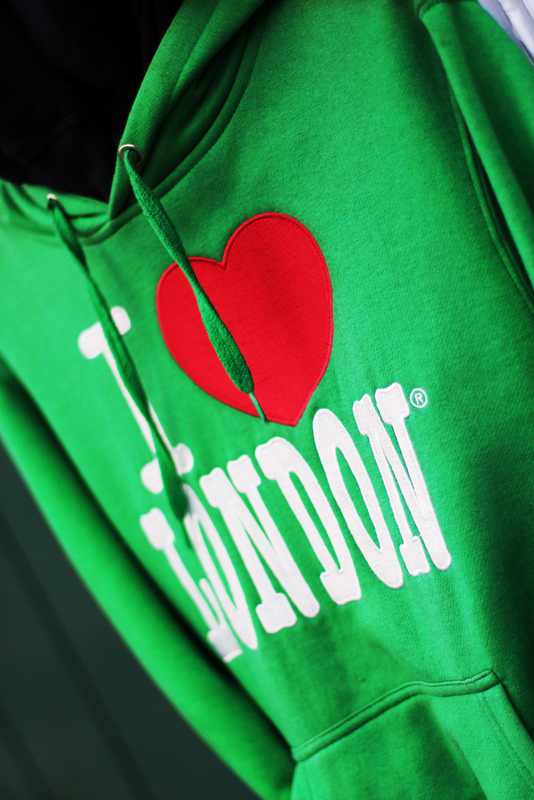 Once home, I took it with me on an explore of London in daylight and it again performed really well. 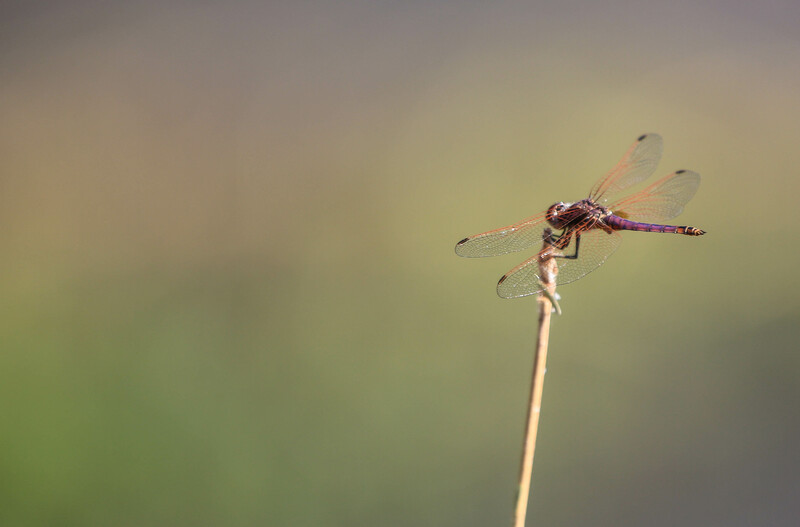 I changed from the kit lenses to using my 70-200mm f4, and 50mm f1.4 using the adapter ring. 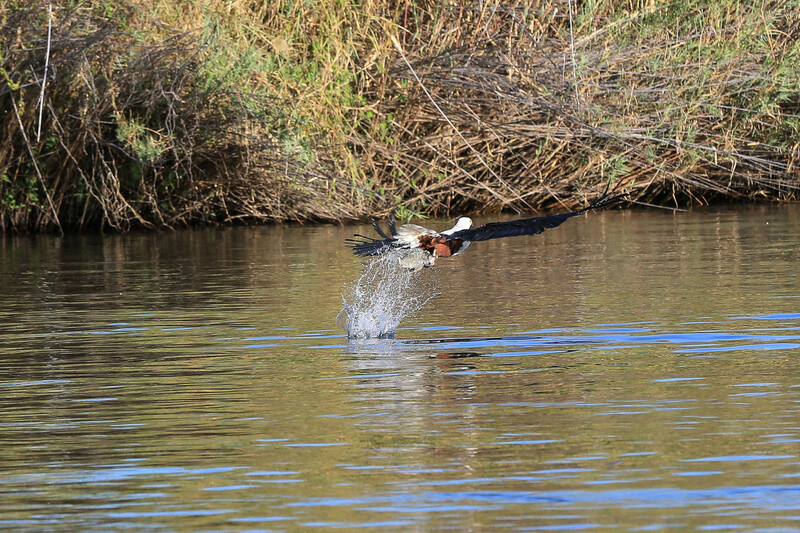 The shots that resulted were at least as good as the 5DMKII. I am finding now that I carry the camera around with me all the time. I stopped carrying the DSLR as it was too heavy when carrying everything else for work. The EOS-M fits easily into my work bag adding very little weight. The only thing I need to remember is to ensure the battery is regularly charged as it has a fraction of the life of my 5DMKII battery. The overall rating of the camera I would say is 4 out of 5 stars. If the battery life was longer, if it dealt with low light better, if the 22mm lens was stabilised, it would get 5 out of 5. But it’s pretty close. 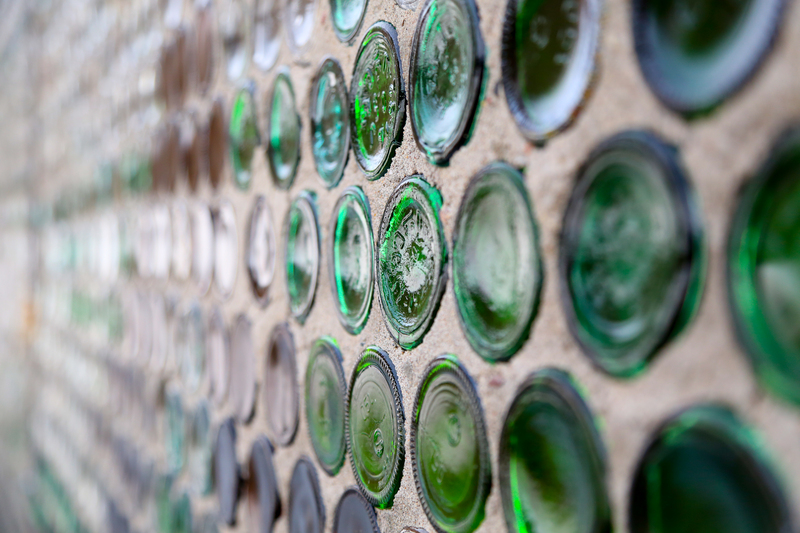 I have found that buying the EOS-M has encouraged me to get out and take more photos again. Sometimes you need inspiration to get your energy back into something … and a new camera has definitely re-engaged me in my passion of photography. I love that I can now have a lightweight back up camera body if I am going on a shoot with the 5DMKII – even if it does confuse people when they see L series lenses on a very small camera body! Although the general consensus is that Canon have come late into the Compact System market, I would say they have entered with a highly desirable product for any Canon DSLR user wanting a second lighter camera that can reuse their current kit! It has some fun features such as the touch screen. It has some “younger” features like filters applied in camera (e.g. fish eye, soft focus, bold colours, vignetting, etc) but it also allows you total manual control over ISO, aperture and exposure. All in all, it’s a great camera, and I am very pleased I made the investment. 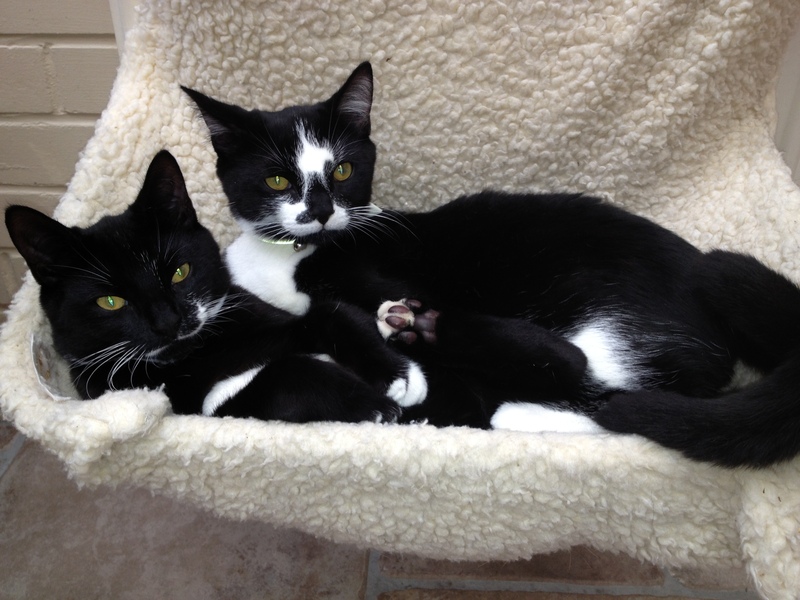 I very sadly lost my two beautiful boys Charlie and Billy last year – both to cancer. Until that time, I had had no idea how common cancer is in both dogs and cats. I really missed their presence in the house and everything felt too quiet without them, but it took me a while to be ready to adopt new feline companions! Having had a friend’s cat to stay for a month at the end of last year whilst they sorted out a house move, I felt it was time to have the pitter patter of my own feline feet again – so just before Christmas I phoned Cats Protection to start the process of adoption. That included some info about me, as well as one of their representatives doing a home visit to ensure it was a suitable place for cats. Then it was a case of seeing which cats needed rehoming, whether any fitted what I was looking for, and going to visit them at their foster home. I adopted Merlin and Arthur just before New Year. 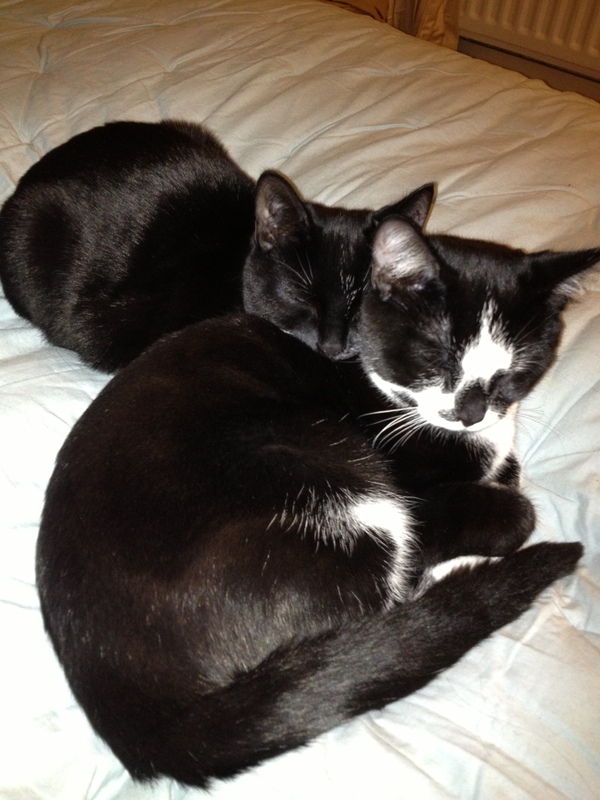 They are energetic “mini cats” at 4 months old, and obviously totally devoted to each other. I had had great advice from Cats Protection on how to settle them in one room for a few days, but they were having none of it! Within an hour of getting home, they had escaped their “safe room” and were exploring the whole house! 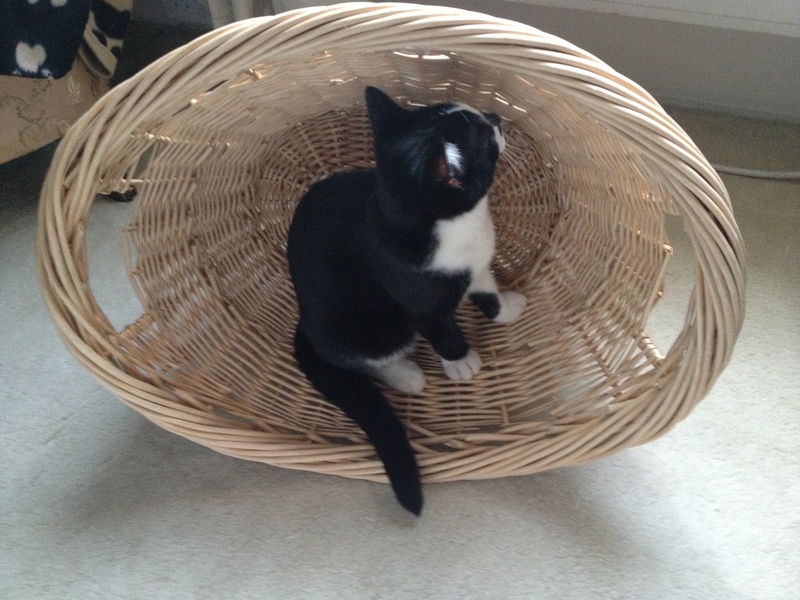 The (luckily) empty laundry basket! They coped very well from day 1 with a steady stream of visitors who popped in to meet them – and they were absolutely amazing with my friend’s two year old who followed them around constantly! 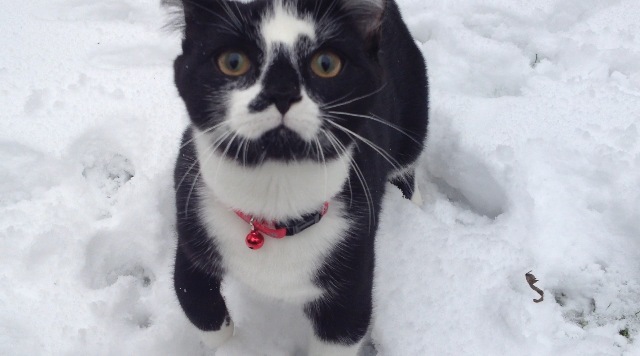 Within three weeks I let them out into the garden which was interesting as there was deep snow. I was pretty nervous for the first few days but they took it slowly – spending the first week only within the bounds of their own garden. They now explore my neighbours gardens either side, and possibly beyond! They have met other cats – and are getting more confident (i.e. they no longer immediately run away!). They have a favourite apple tree in the garden which they climb right up to the heights. They love lying across the back of the sofa and watching the world go by the lounge window, as well as accepting the admiring looks from the neighbours. They squeeze into a single radiator bed to have a brotherly cuddle. And thankfully, they love spending the night asleep on my bed! 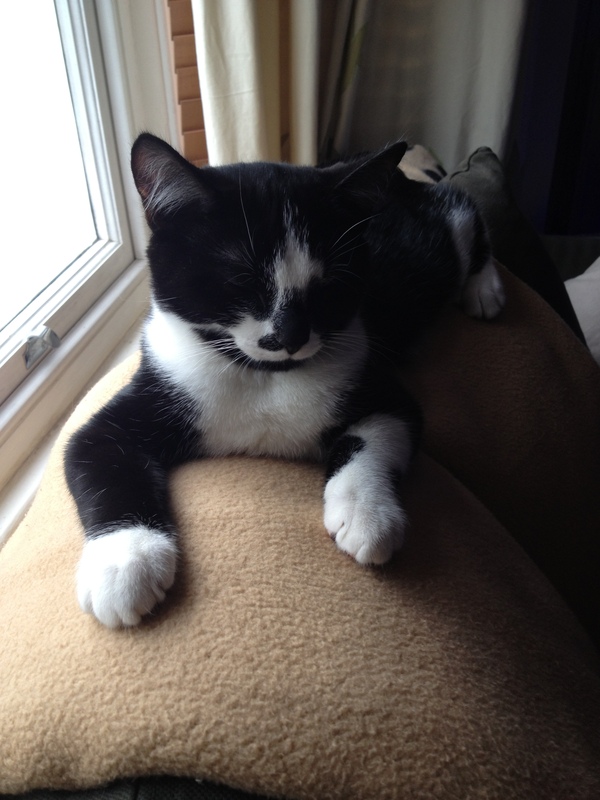 Cats Protection were fantastic through the whole process, from initial contact, through to post adoption. At every step of the way I was offered advice, and help. 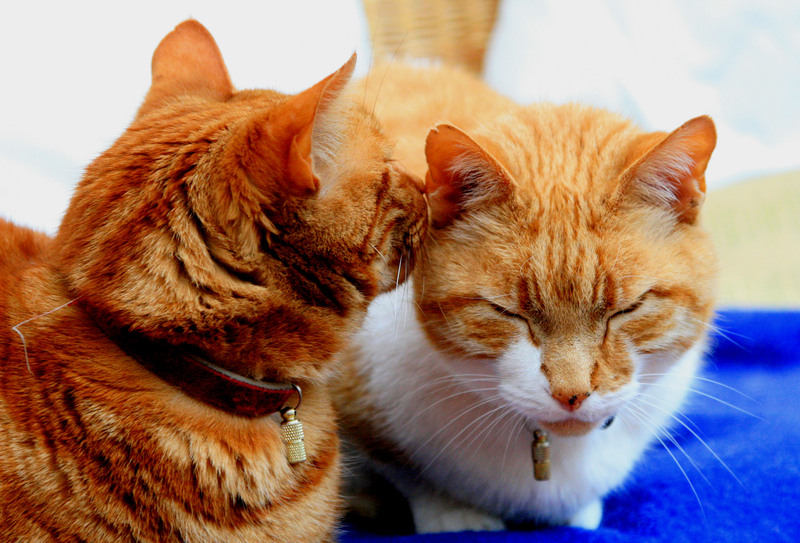 Having not had kittens for over 15 years it was really reassuring to know someone was always there at the end of the phone. The boys have settled in incredibly well and are totally integrated into my family. Thanks Cats Protection for everything! 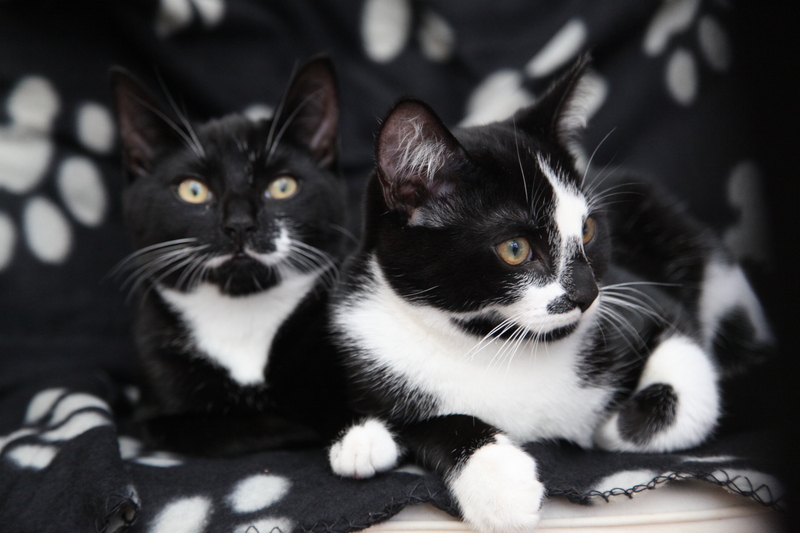 If you are thinking of adding a cat to your family, please please please consider adopting a cat that is currently being cared for by one of the many charities – Cats Protection and RSPCA to name the two obvious ones. Give a cat a second chance and adopt one today! 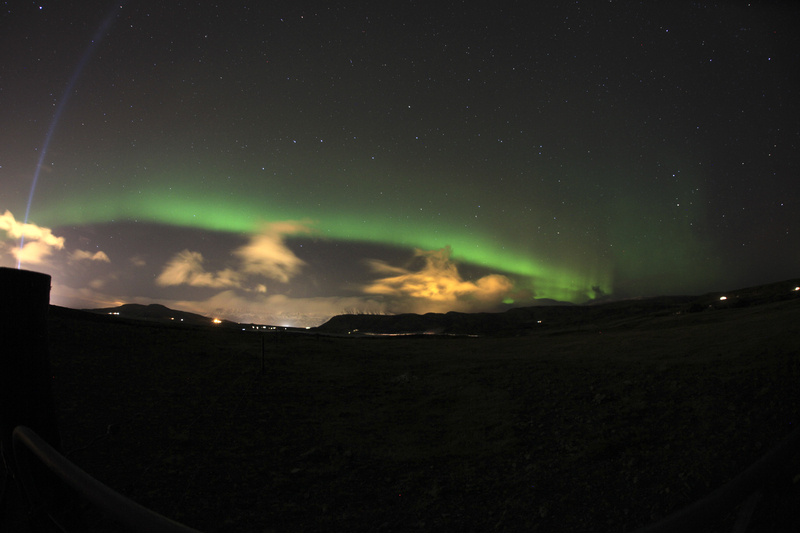 So I promised a post about the Northern Lights, which I was lucky enough to see for about 20 mins in Iceland in November 2012. 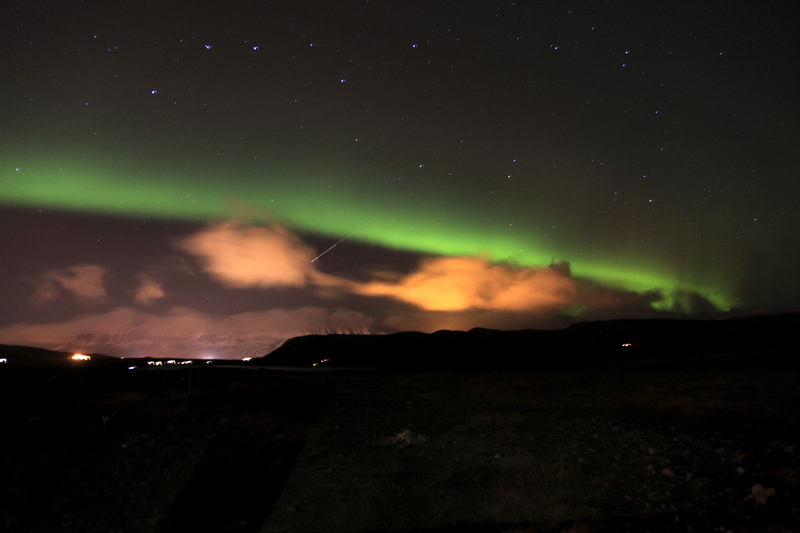 We went out in a small mini bus with about 9 others, and drove out of Reykjavik away from City lights. Not really being aware of what to expect, it was very exciting to realise there was a light green “cloud” in the sky, and that it WASN’T a CLOUD! That is how it appears – a band of colour, and then you realise that ever so slowly, it is changing, moving, expanding, contracting. 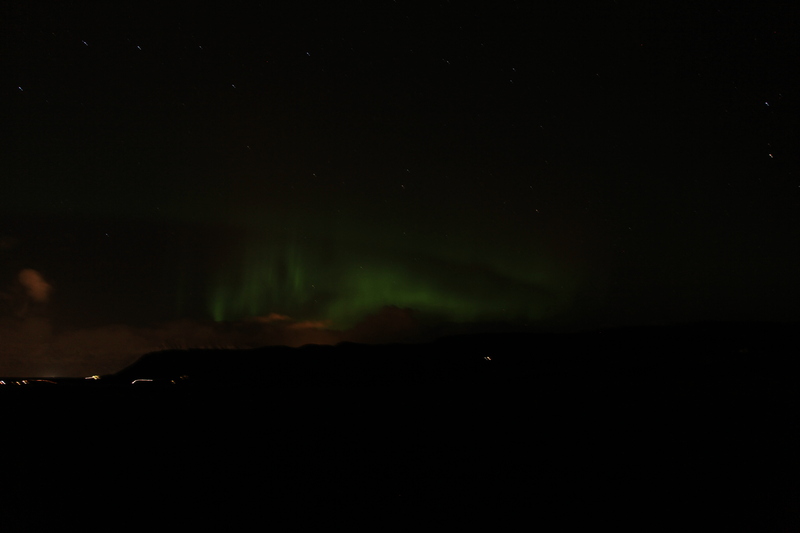 Anyway, it was so exciting, and even though the temperatures were way down below zero, and the wind was blowing a hoolie, we stood outside and watched them for about 20 mins (with some hot-chocolate-on-the-bus breaks). A few of you have asked me how to shoot the lights – so hopefully this will give you somewhere to start! 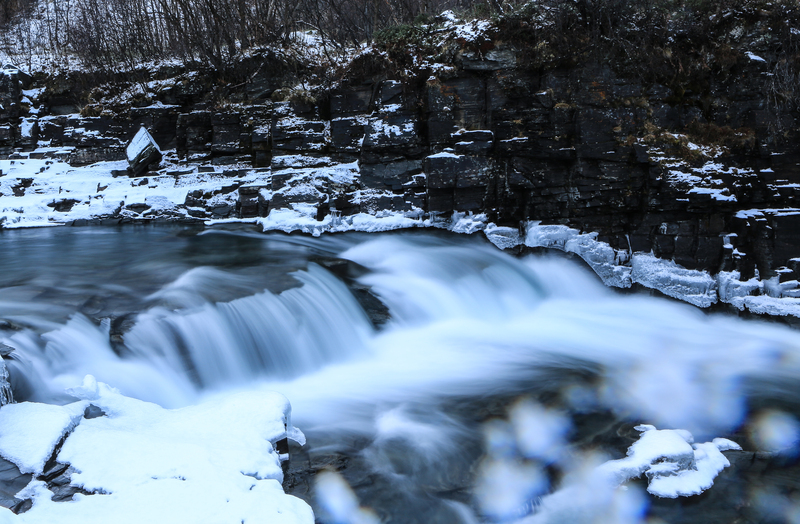 If the temperature allows it, play around with ISO and exposure duration, and see what different effects you can create. The kit I had with me was: 5DMkII, 24-105, 15mm fisheye, full sized tripod, remote control. Most of the shots I took were using the 24-105mm lens, but I did take a couple with the fisheye just to give it a different feel. Before I went out into the bitterly cold night, I set the camera to ISO 400 and f4.0. 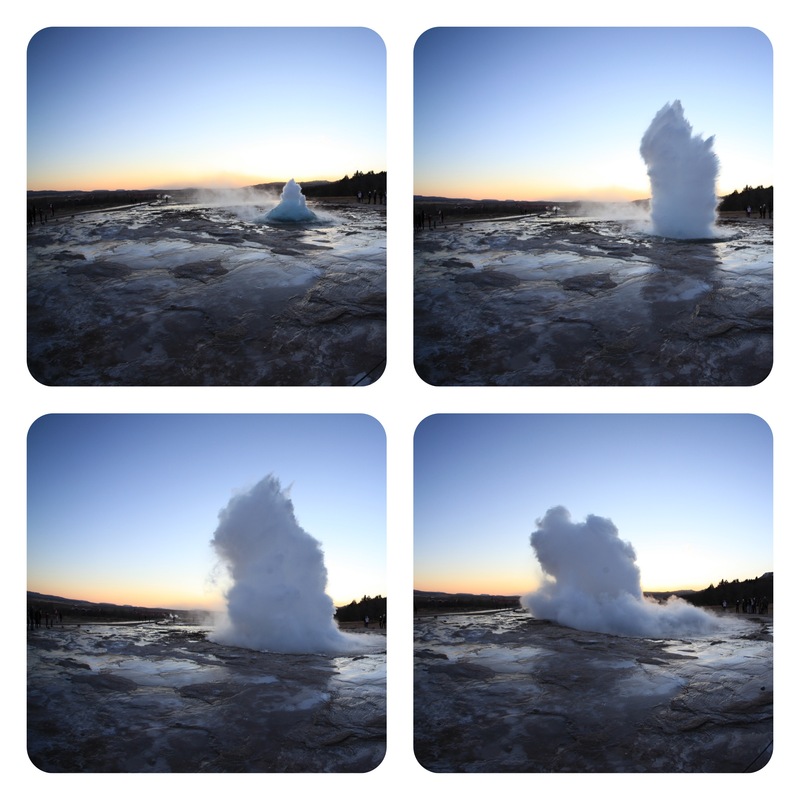 I then tried a variety of timed shots to get the best effect. I quickly realised 400 ISO was not going to be successful without overly long exposure (which the temperatures were really making difficult), so I changed it to 800 ISO. 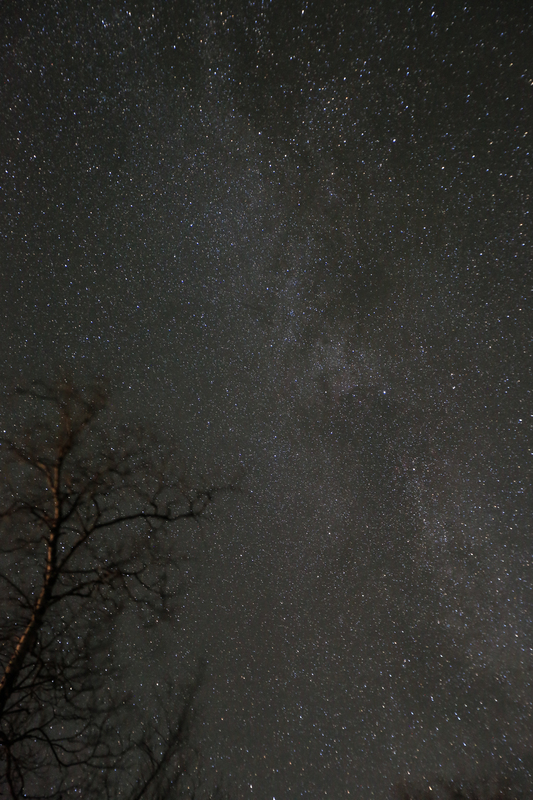 Below is a shot at 400 ISO, exposure 30 seconds long. After this point, all shots are at 800 ISO. Below is a timed shot of 10 seconds. 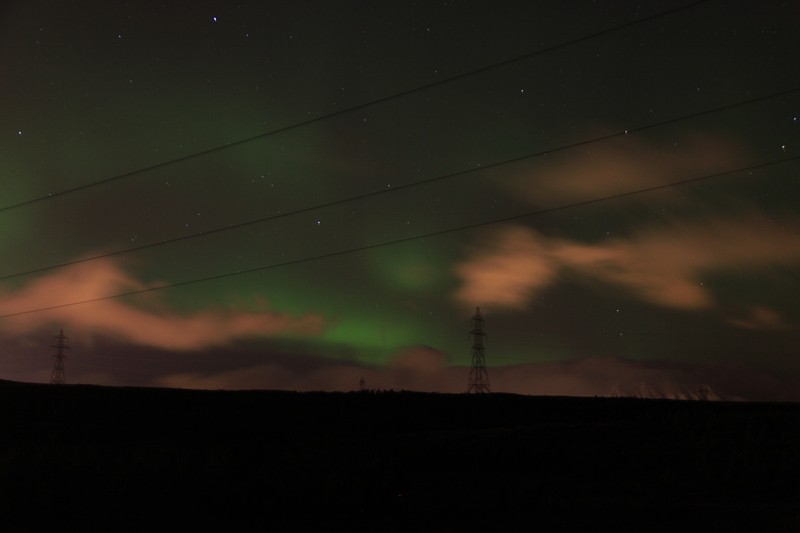 I then tried a 20 second shot which came out pretty well. 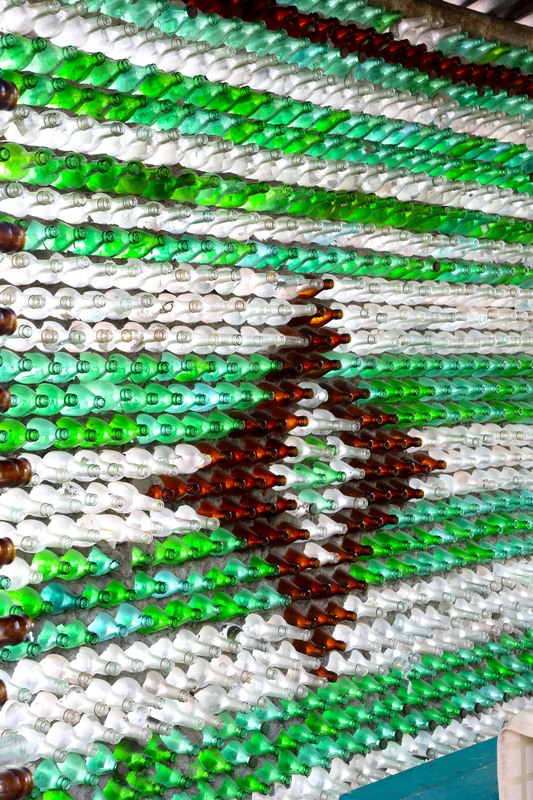 Once I dropped it into photoshop, and tweaked the levels a little, this was the result. Just to show you a shot with the fish eye lens, here’s a shot taken with the same ISO as before (800) f4, and the lens is a 15mm. It is a 30 second exposure. The “piece de resistance” was the shot below. 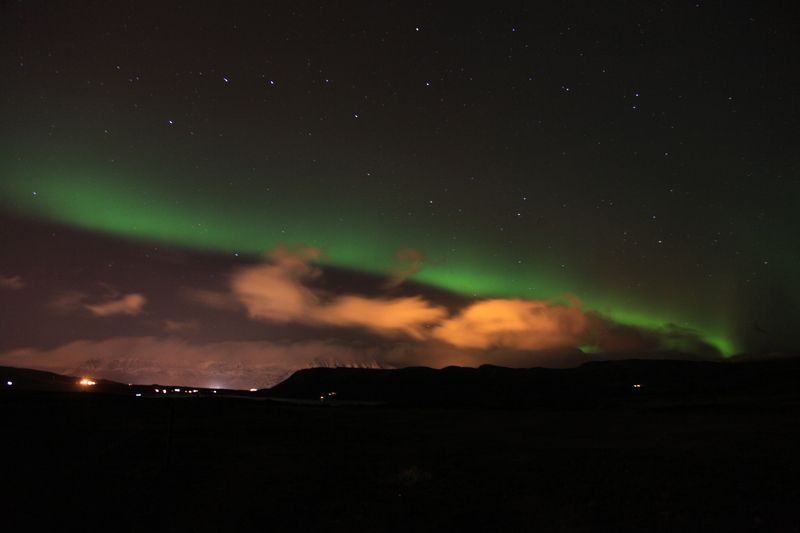 As I was taking this shot, we saw a shooting star fall through the middle of the Northern Lights. 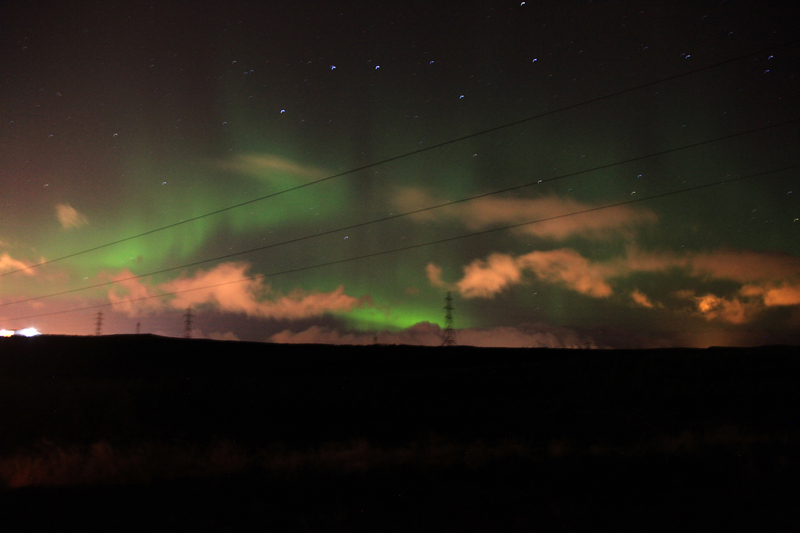 That was a truly magical moment – and it is my favourite shot of all. I hope this has been helpful to some of you … and for those of you who know better than me how to take these shots – I hope you could at least enjoy the photos!! It was a magical experience, and one I’d really like to repeat! 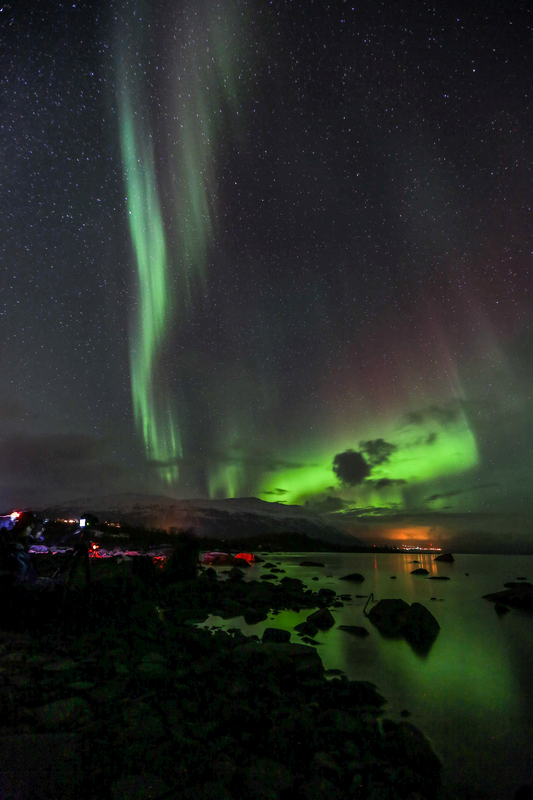 I have always wanted to see the Northern lights, so when a friend proposed a long weekend away in Iceland, I signed up straight away. 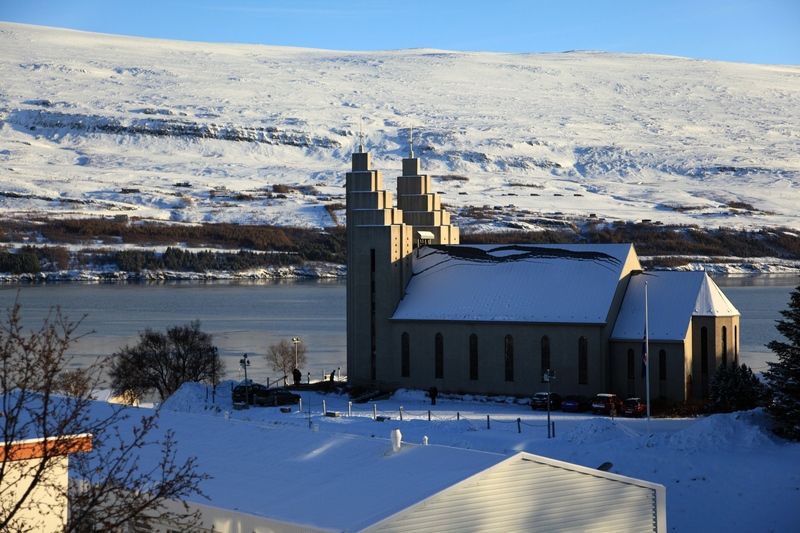 We did some research, and ended up booking a 4 night trip that covered both Reykjavik and Akureyri in the North. 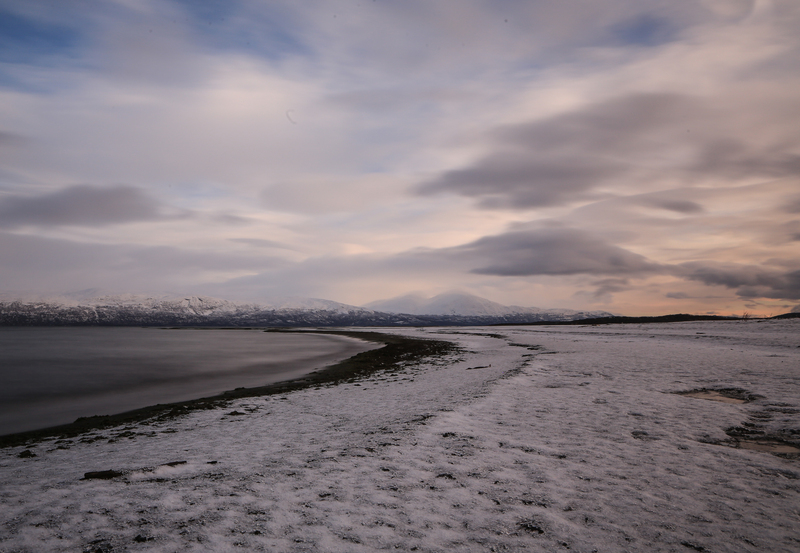 We arrived late into Reykjavik, and after a few hours sleep, headed off the next day for our internal flight up to Akureyri. On arrival, it was just beginning to get light – at 10am! There was plenty of snow on the ground, and by the time we had checked into the hotel it was light enough to have a walk around the town. The winter light was stunning and I really enjoyed getting the camera out for a few photos. 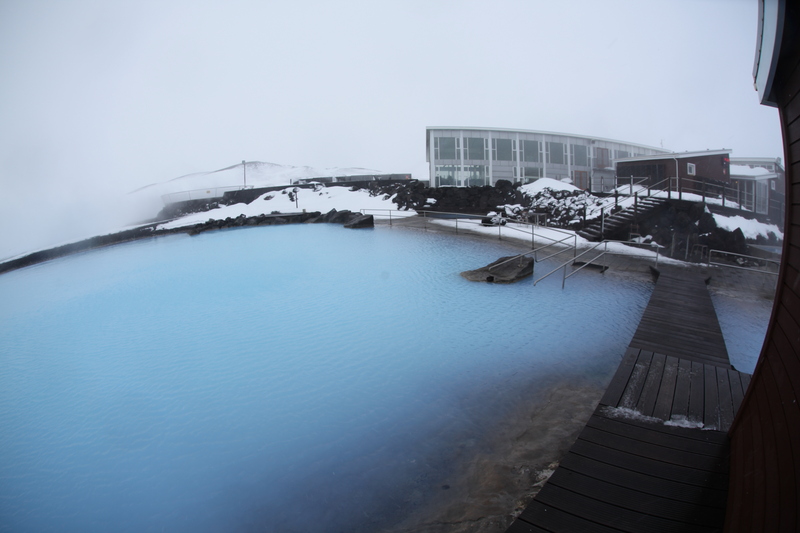 We started by going for a swim at the local baths – all naturally heated spring water! The main pool was a leisurely 27 degrees – but there were a couple of jacuzzi baths that were 35 and 42 degrees! 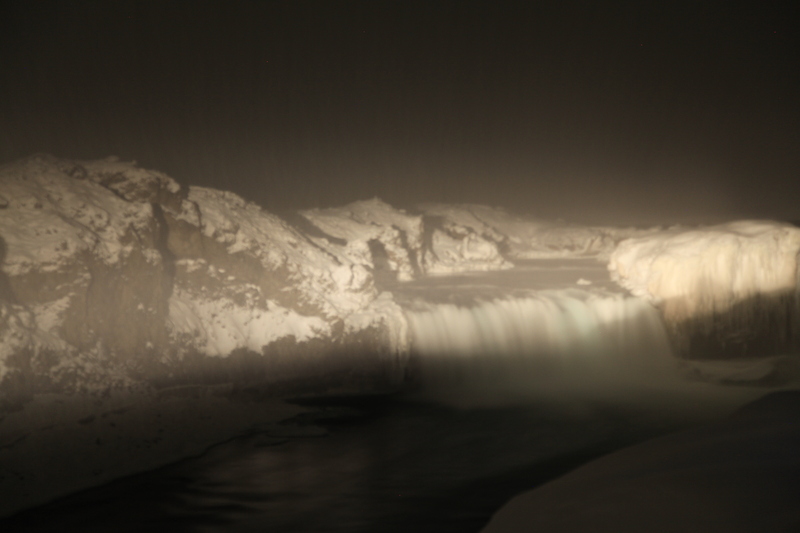 It was amazing to be outside in the snow, sitting in a very hot pool of water! Reminded me of ski holidays where there has been a hot tub at the chalet! It certainly warmed us up for the rest of the day. In the afternoon, we opted for a boat tour. 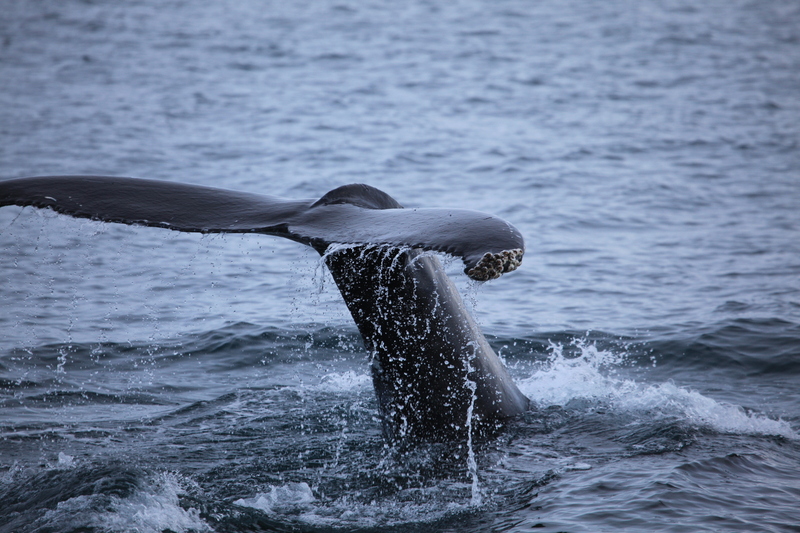 They called it a whale watching tour, which seemed unusual as all the info I’d read up on before arriving said that whales went south to warmer waters in the winter. 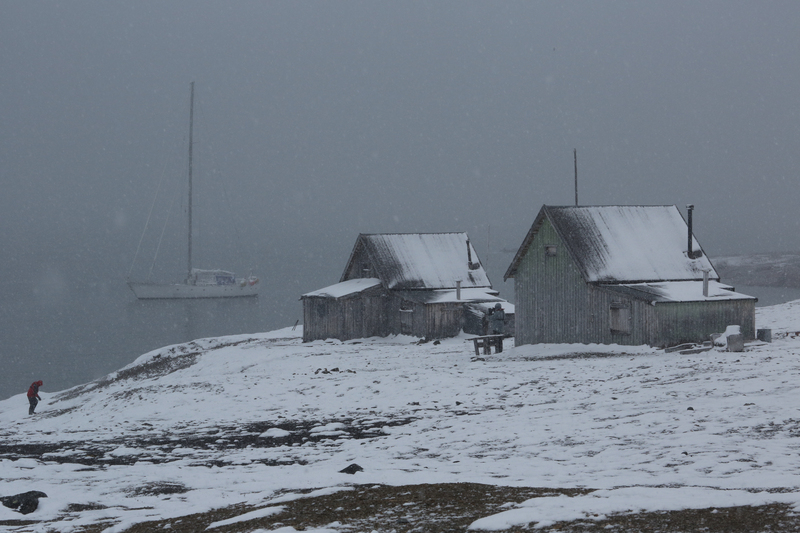 It was the tour company’s first Winter of running the trip, so we headed off to sail due North up the fjord. 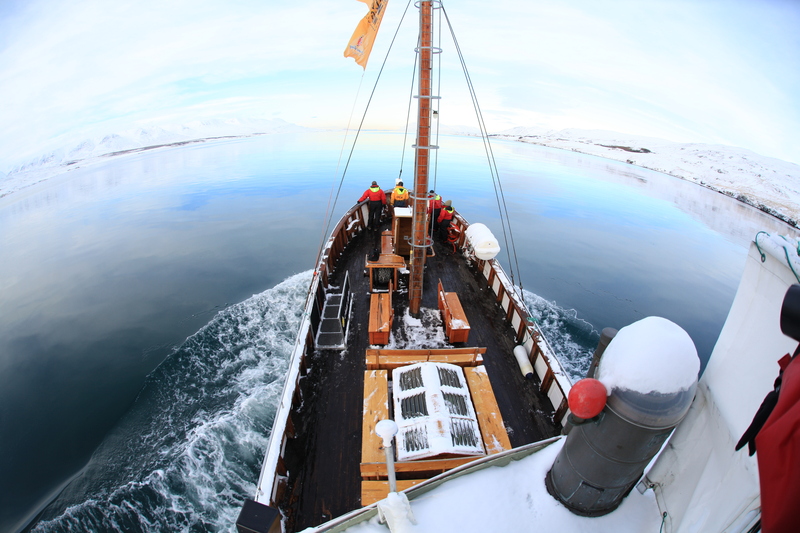 We got dressed up in all in one warm suits, and headed out, breaking our way through some ice as we went. 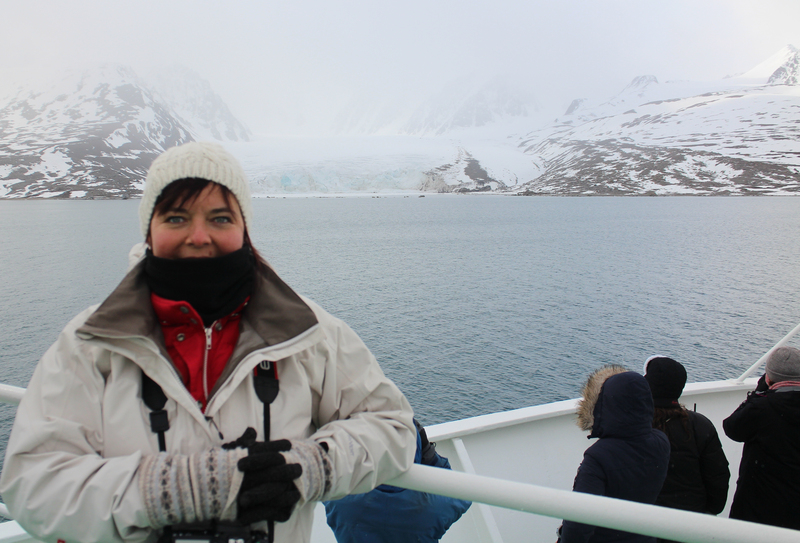 It wasn’t too long before we realised we were going to be very lucky – the Captain spotted some humpback whales further up the fjord. And there were about 8 spread out over about a mile of water. And before we knew it, we were along side them and watching them breach. 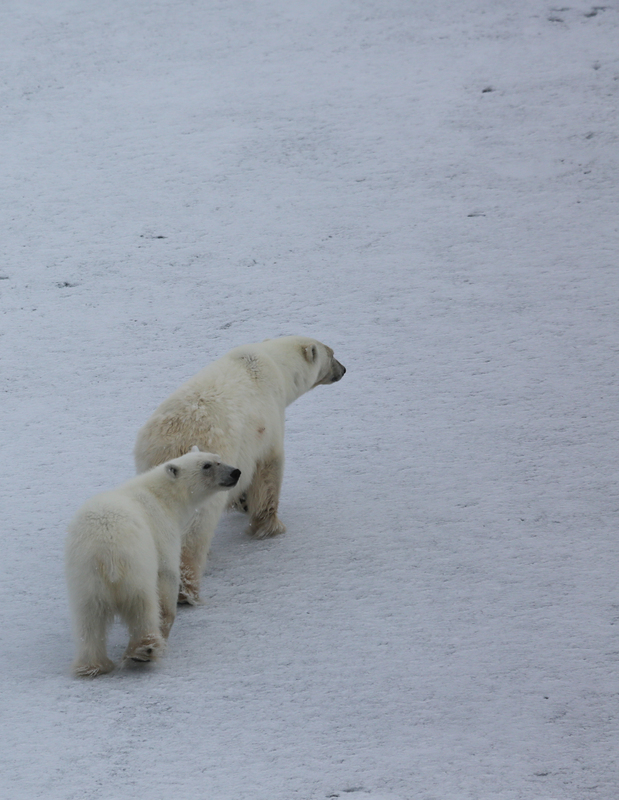 It was amazing to be so close so these beautiful mammals. We stayed in the area for about 45 minutes. 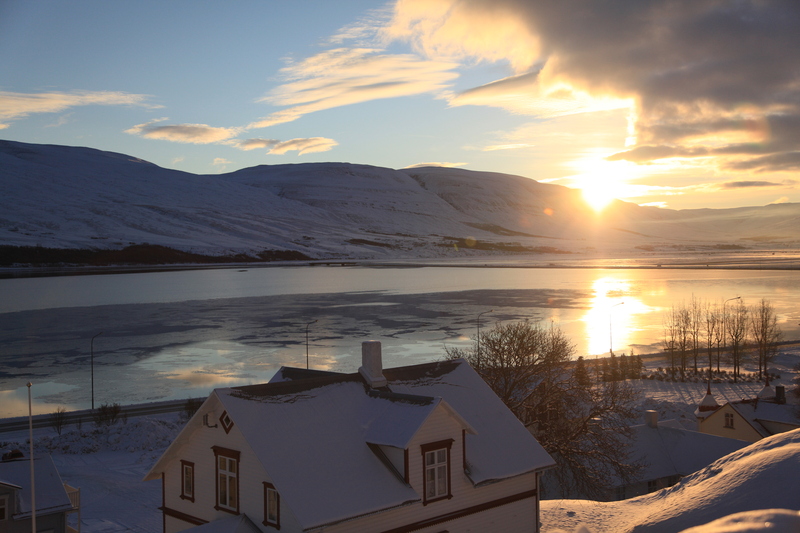 Before we knew it, it was time to head back to Akureyri. 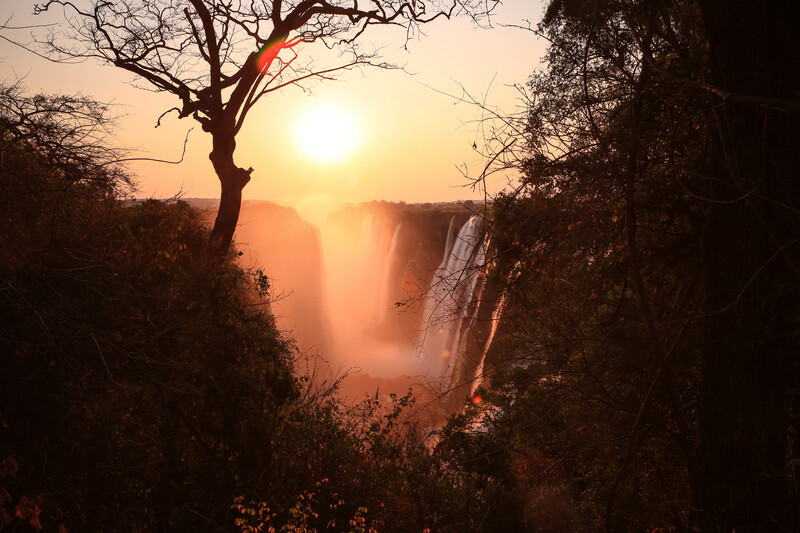 When we got back, we had just enough time to grab some dinner, before we headed out in a coach with some other guests to go and visit a waterfall … in the dark … there’s a first time for everything! 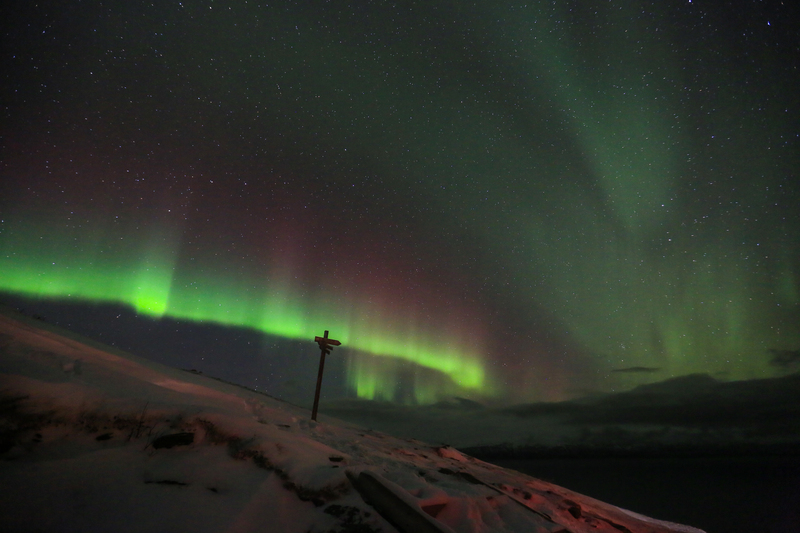 The idea had been to go Northern Light hunting, but as we drove onwards, it was clear we were heading into snowy weather and there would be no lights tonight! 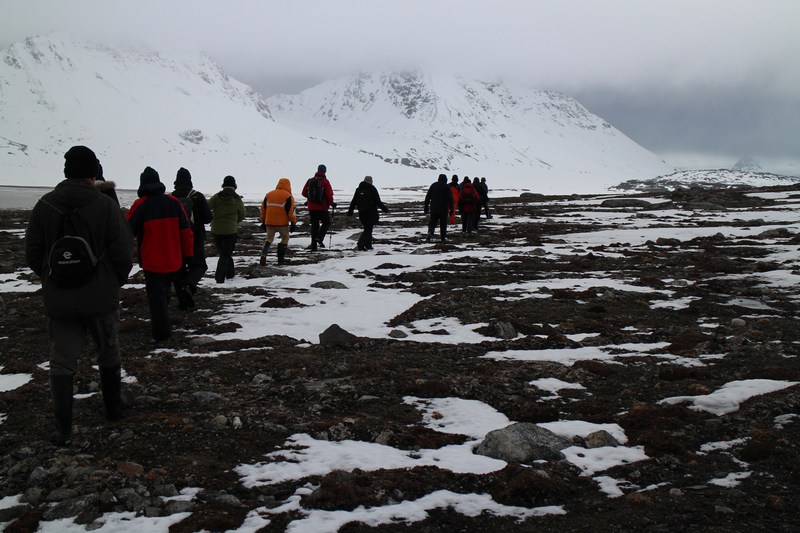 Next day, despite some severe weather warnings, we headed off to do some exploring. 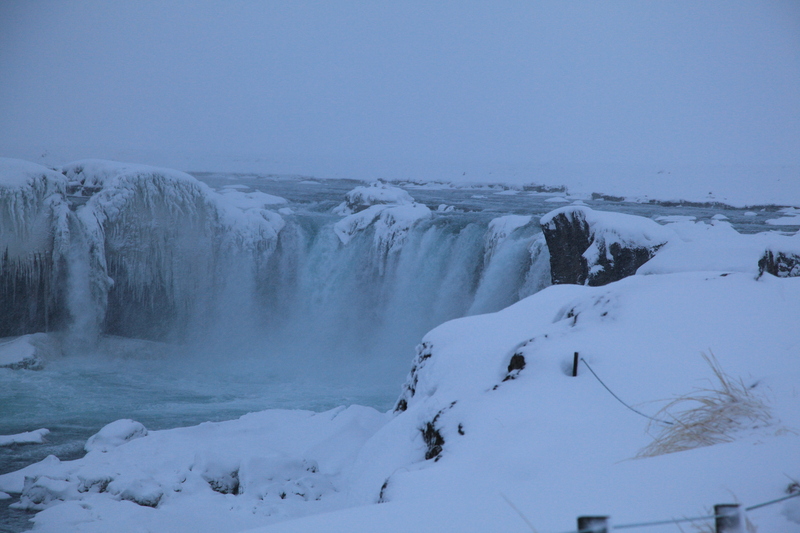 We revisited the waterfall – Godafoss – so named as the story goes that when Iceland converted to Christianity, their pagan god statues were thrown into the waterfall. 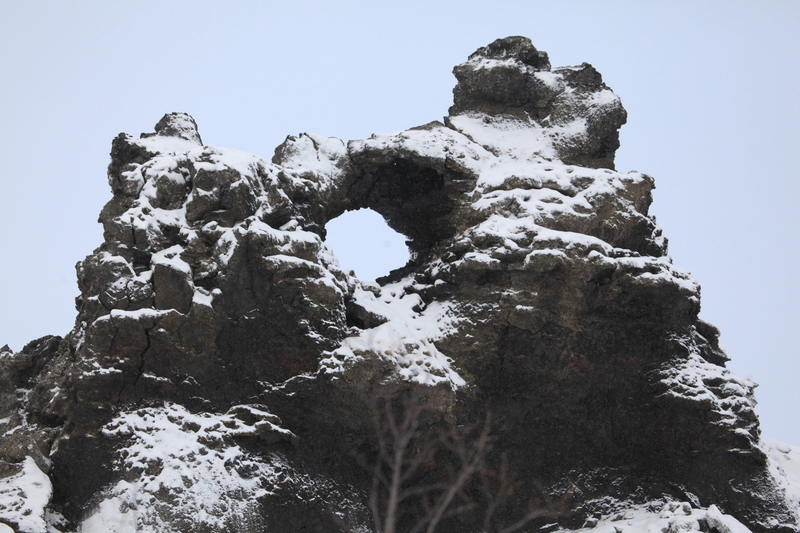 We then went on to Dimmuborgir – the home of the Yule lads trolls. It’s a lovely place with amazing volcanic rocky areas. The idea is that they could be hiding in them – which at Christmas time, they do! After that we headed off to another local natural bath, so that everyone could soak their cares away! Then it was time to head back to our hotel. 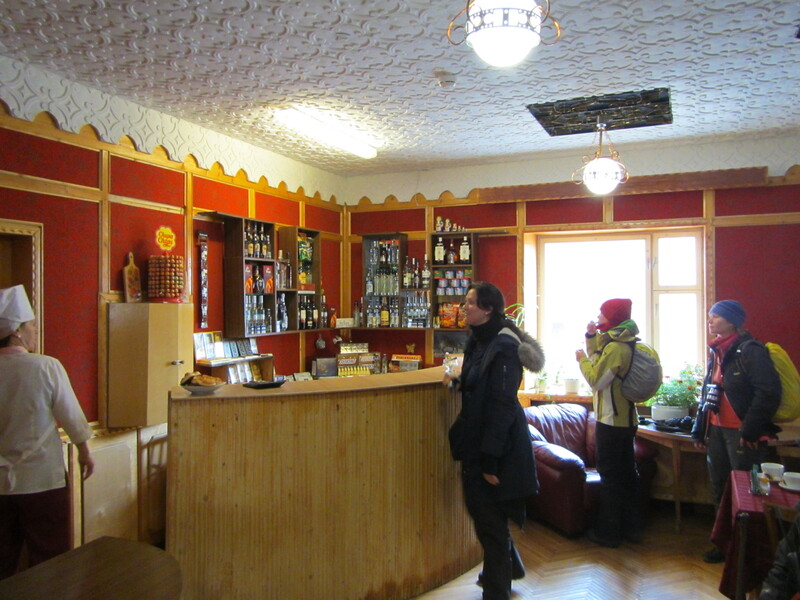 We had a bit of a tricky time getting back through the pass to Akureyri – but eventually we were back in the bar and enjoying getting warm by the fireside. 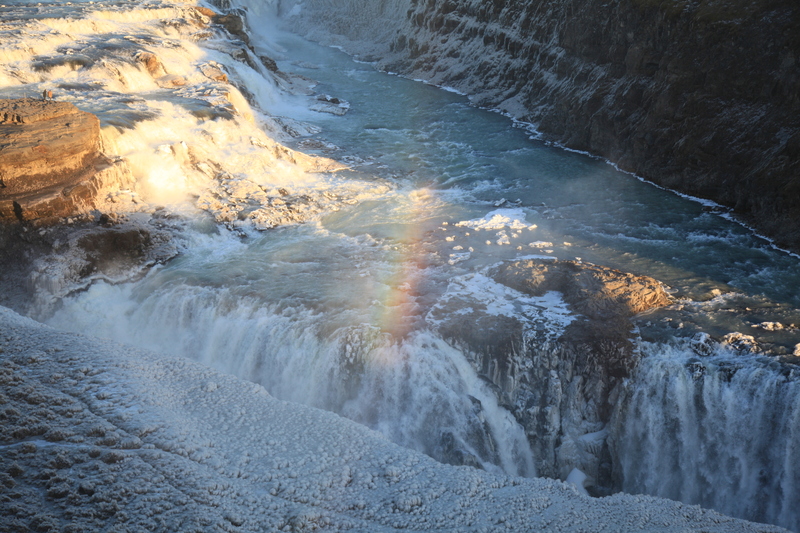 Next day it was already time to head back to Reykjavik, where we had a trip booked to drive out to the Gullfoss waterfall, and the geysirs. 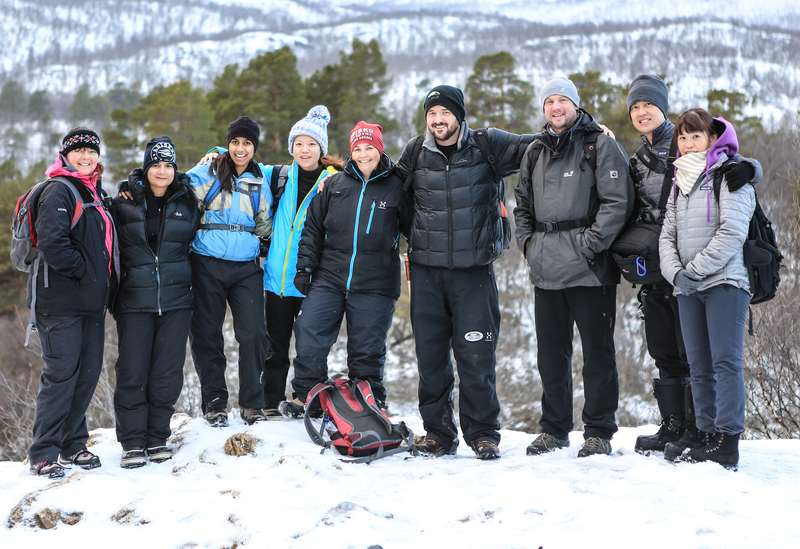 After that, we had a little time to rest, before our final adventure began – which had been due to be a boat trip to try and see the Northern Lights! However, following on from the snow storm in the North, the boating trip was cancelled, and instead we jumped into a mini bus and headed off to find the lights! 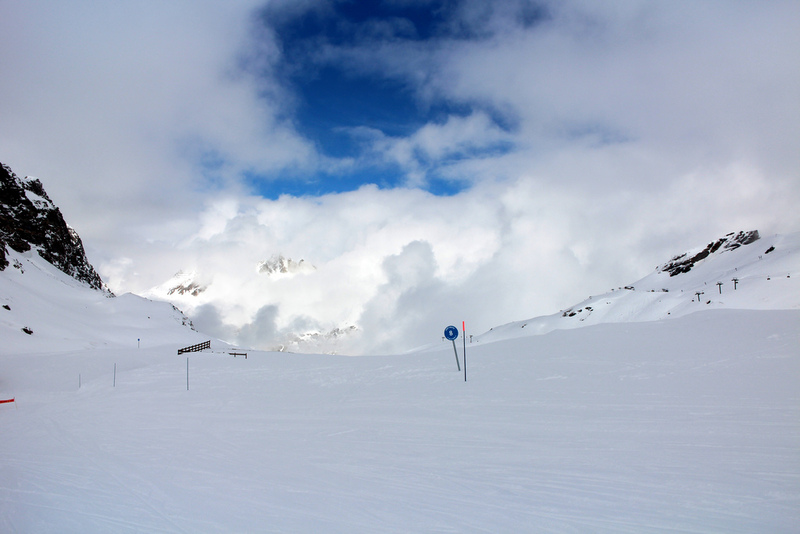 The forecast was very poor, but ever optimistic, we kept our fingers crossed! We saw the lights. Not for long. But we saw them. But more about that another time …! I appear to have run out of space for now! Until a couple of days ago, the only adders I had seen were in an enclosure at the fantastic British Wildlife Centre near Lingfield, in Surrey. Last spring I was lucky enough to get to the BWC just as the two males were “dancing” to see who was the dominant male. 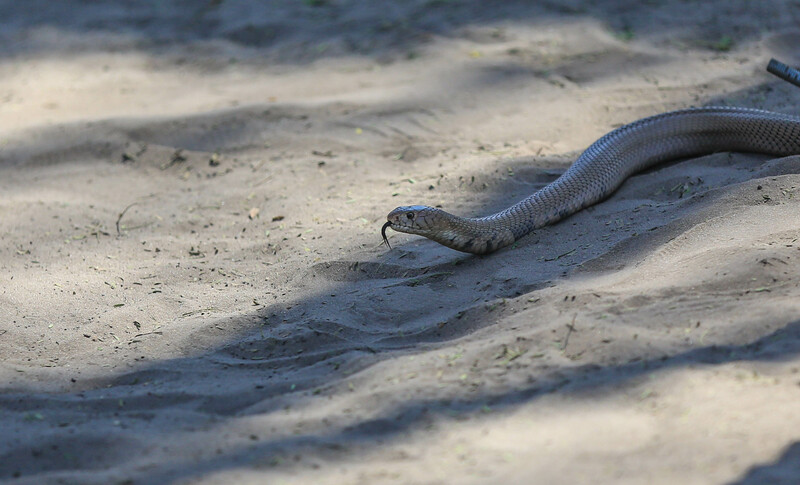 It was amazing to watch – and photograph, and I had thought that was the closest I would come to seeing our native snake. These are a couple of shots from last year, taken at the British Wildlife Centre, where the snakes are within a glass enclosure. So … that was my experience until this week! On Tuesday I went out walking at lunchtime with a good friend of mine, in the spring sunshine. 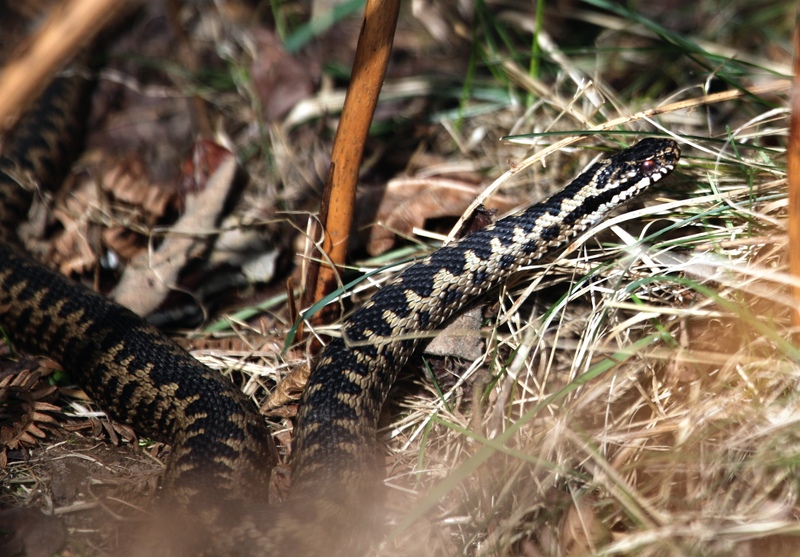 We walked along Banstead Common … and saw about 8 adders, all out of their winter hideaways, warming up in the spring midday sun. 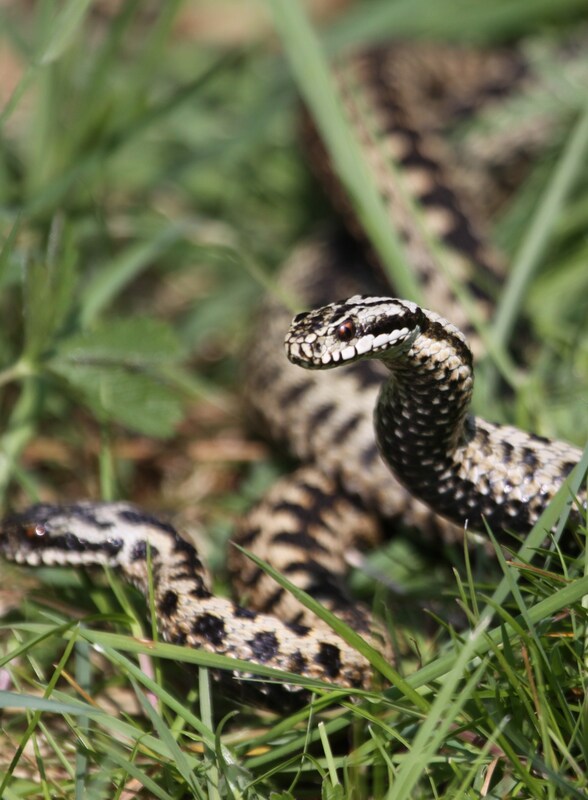 The first adder we saw turned out to be THREE all sunbathing whilst entwined. 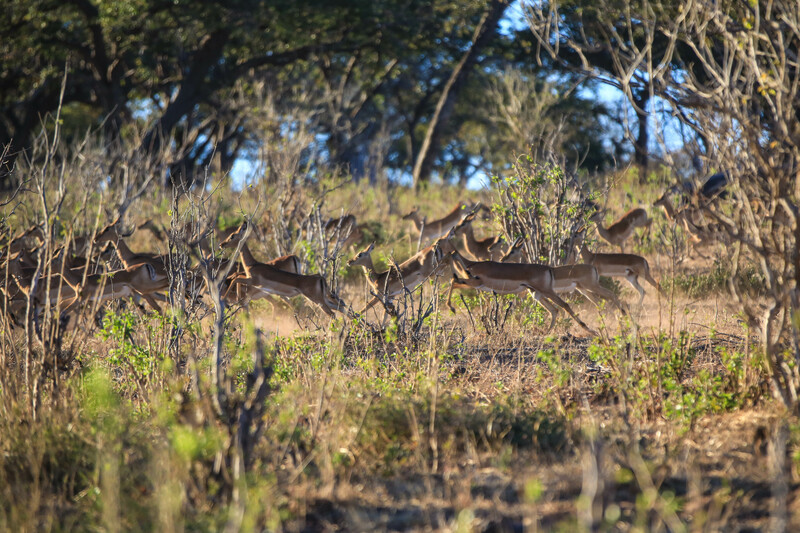 They quickly moved undercover as we approached, so after that we went a little more slowly … and quietly! It was fascinating watching their behaviour. 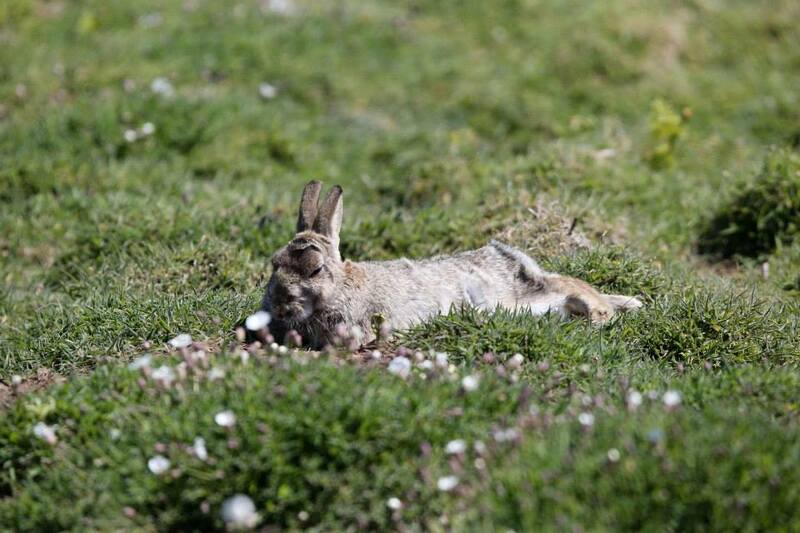 They would be asleep as we approached, but as we got to within about 10 feet they would wake up and watch our approach, wait for a few seconds, then quickly move undercover – deciding sunbathing wasn’t worth it if we were hanging around! So we had to be fairly quick with our photos! It was fun watching them sunbathe, and at the moment, as they are fresh out from their winter sleep, they are quite slow to move. 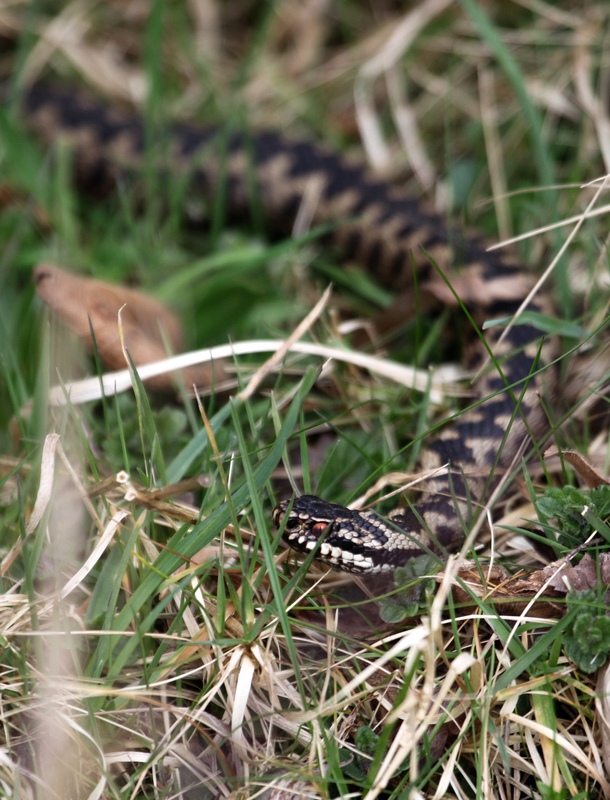 It was weird hearing the crackling of the dry grass, and realising that was the sound of the adder moving out of sight. We didn’t get closer than about 10 feet from the snakes, and I wouldn’t want to get any closer – although likely the adders would have moved way before I got any closer anyway! They are fascinating to watch and I’d like to see them again soon! 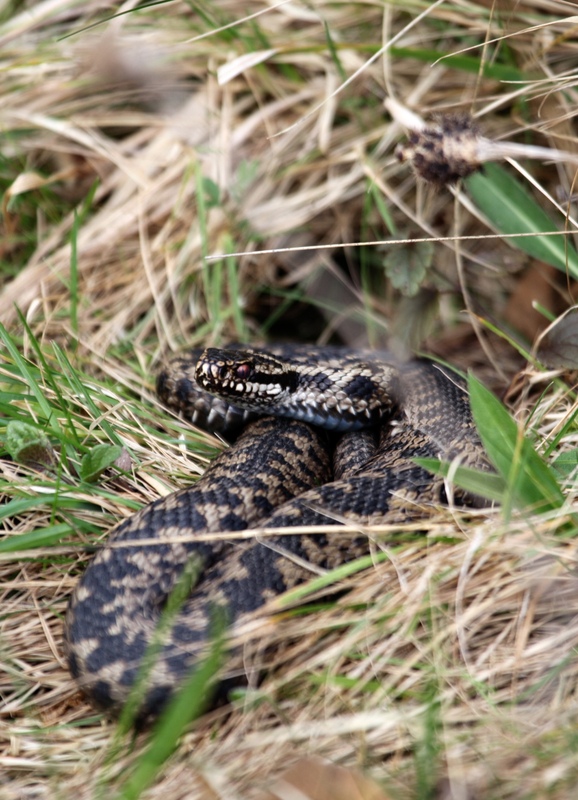 As with all wildlife watching, there is a responsibility on the part of the photographer .. so the safety bit is that adders are venomous (the venom from a bite goes into the bloodstream as opposed to being poisonous where you would ingest poison), but it has been many years since an adder killed a human. However the same cannot be said for dogs, who are definitely at risk at this time of year. 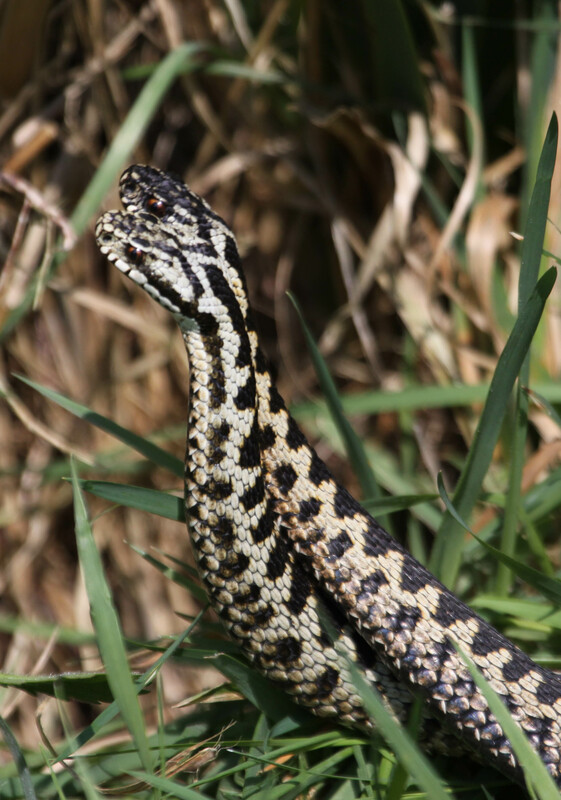 The key lessons are to be aware of where you walk – find out if it is an adder’s paradise, and take precautions. Walk early in the morning before the sun warms up, so that the adders will most likely be hidden away still. If that’s not possible, or if you are walking somewhere new, be aware of your dogs behaviour and if you think (s)he has been bitten, carry him/her to your car, and get to the vet as quickly as you can. If you get bitten yourself, you will need to visit A&E as quickly as you can!